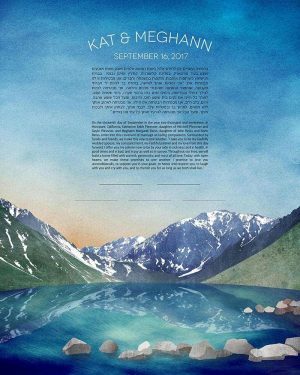 When I'm designing ketubahs, there's nothing I love more than working with a couple to bring their vision to life. 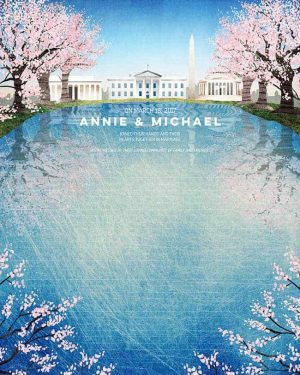 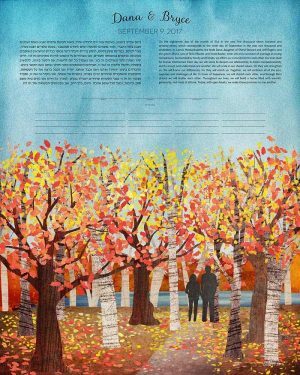 I often find that couples want to capture a place that has significance for them (such as where they met, where they're from, or where they're going) or a time of year that has meaning (my husband and I are both obsessed with the fall). 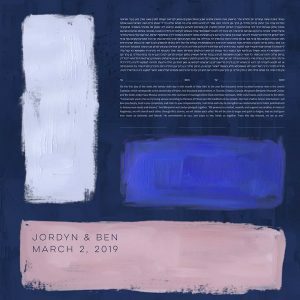  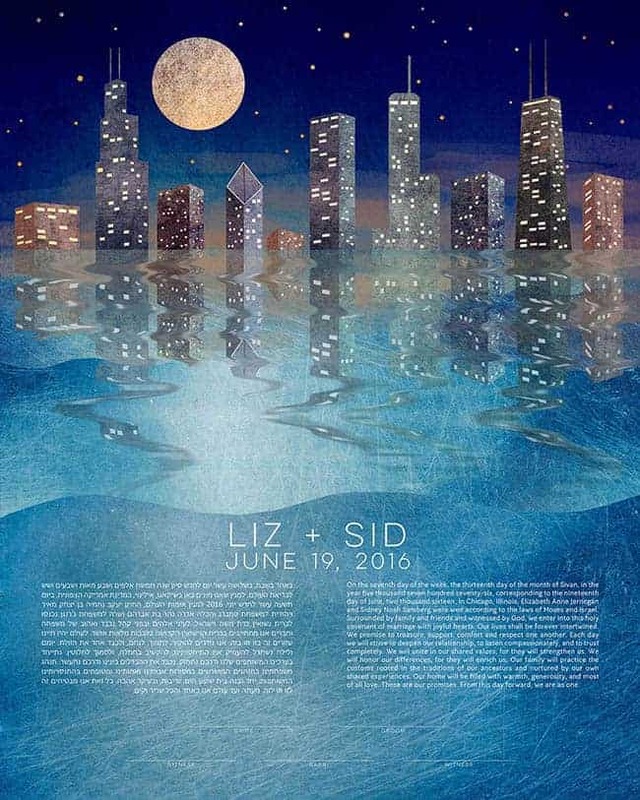 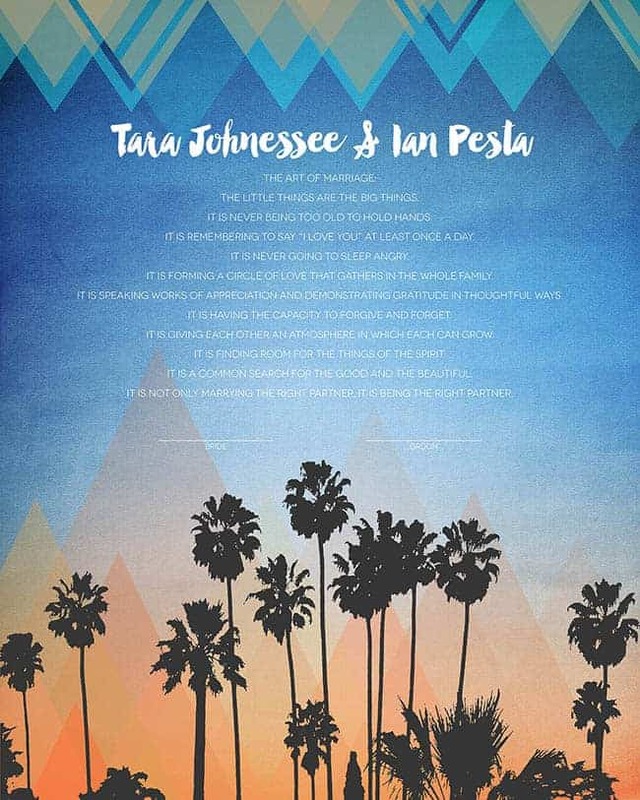 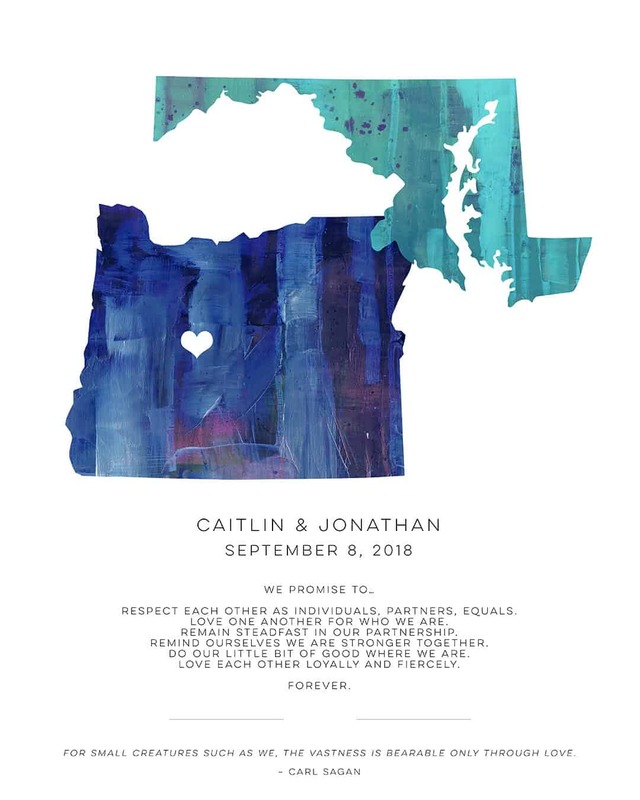 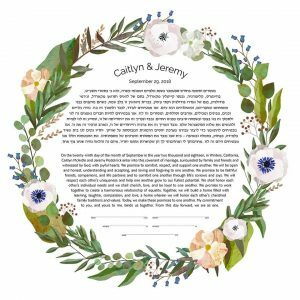 After you tell me your vision and we discuss the symbols and colors that capture your relationship, I'll use a combination of hand-painted elements and graphic design to create something completely unique. 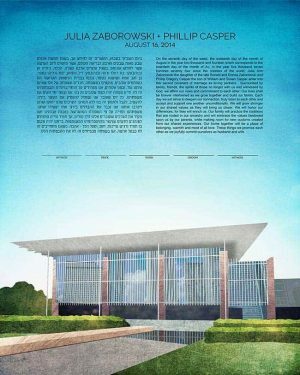  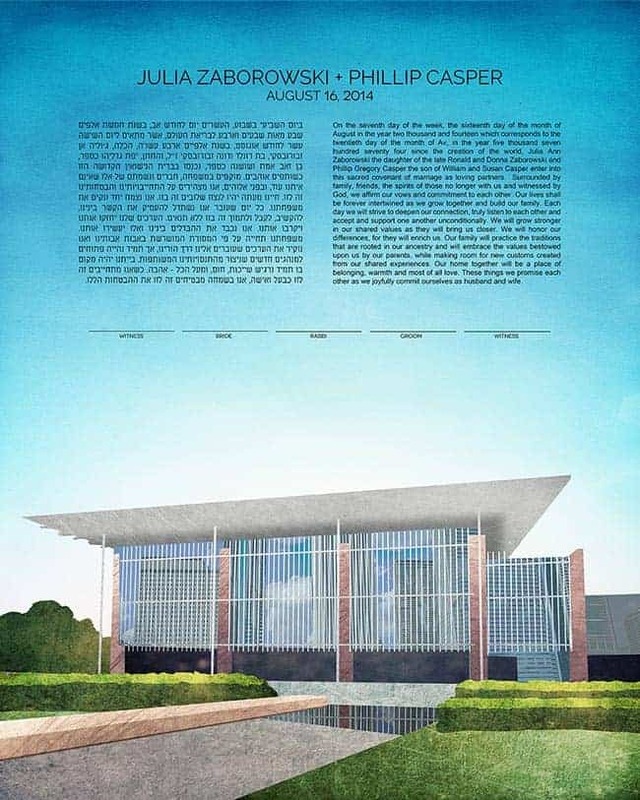 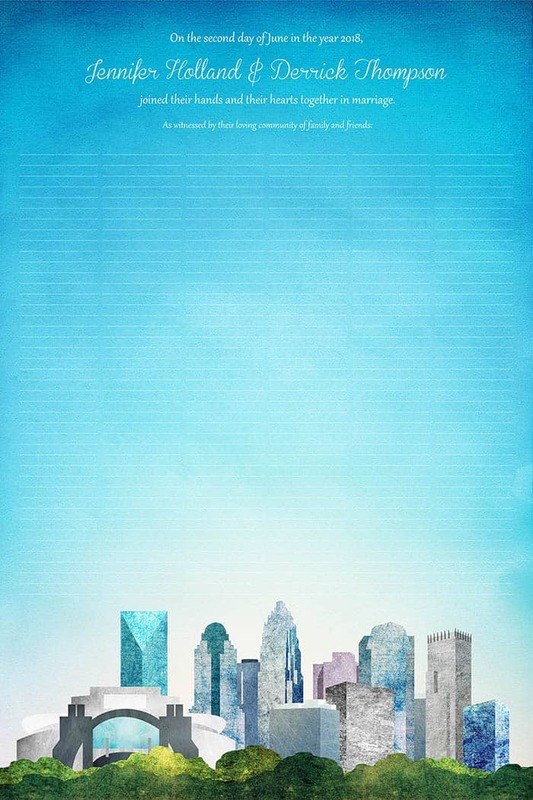  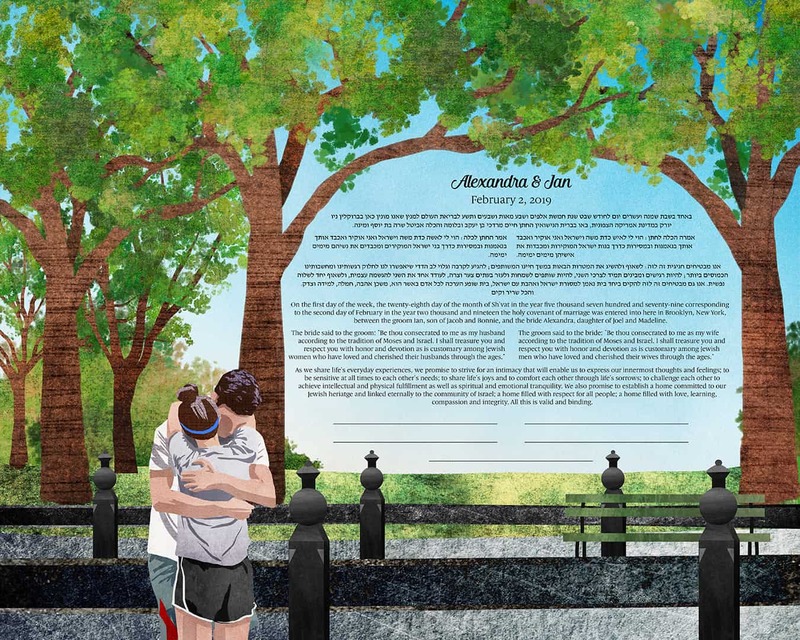 You'll have the opportunity to see the design before it's finalized so that you can provide feedback. 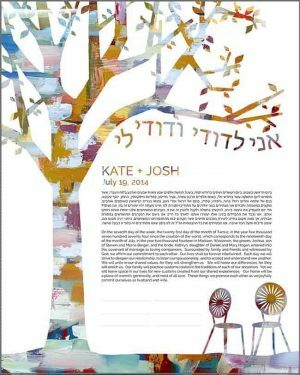 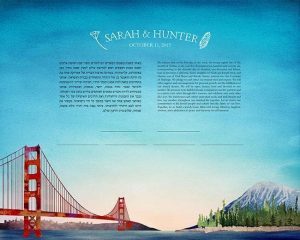 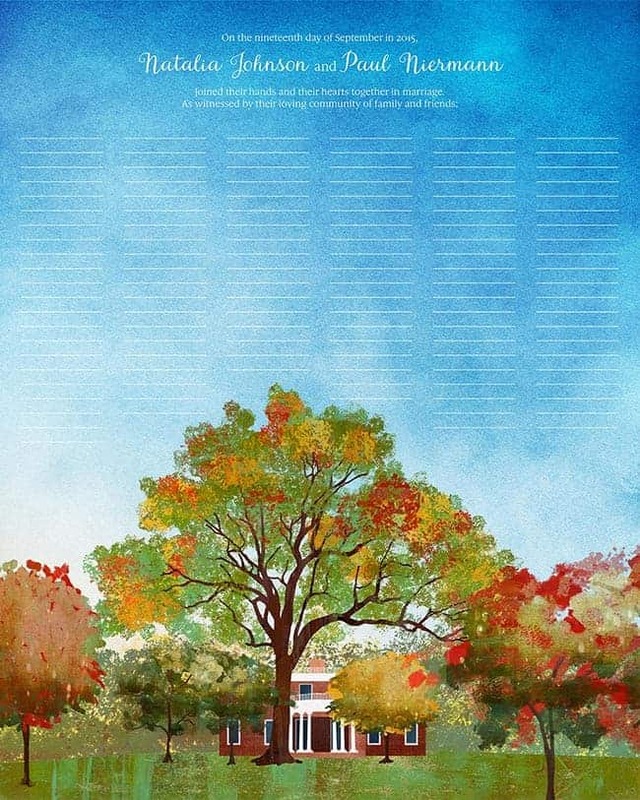 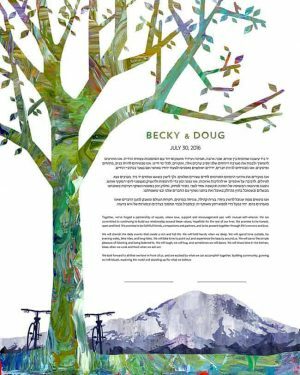 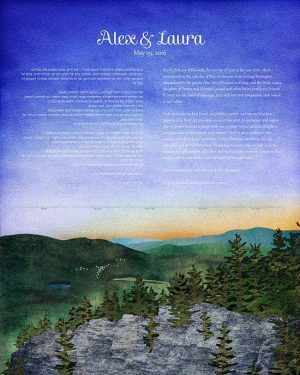 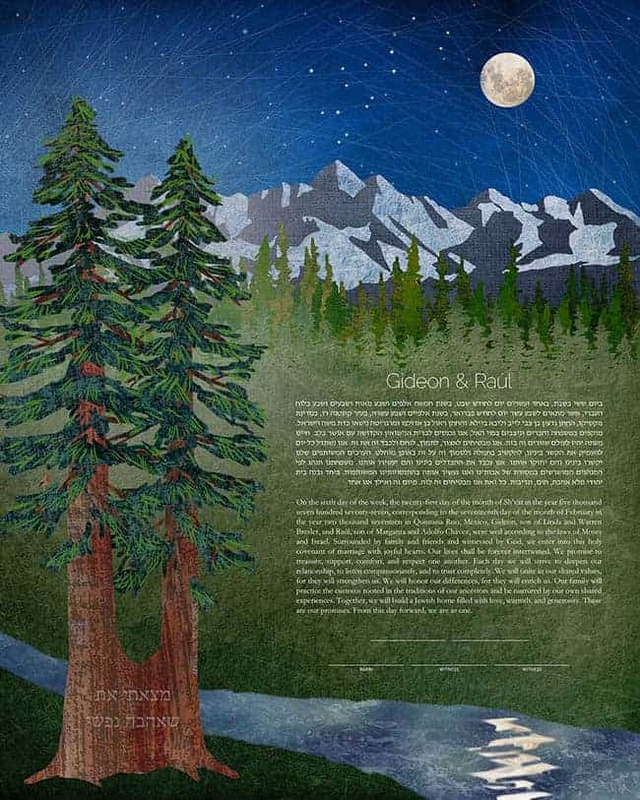 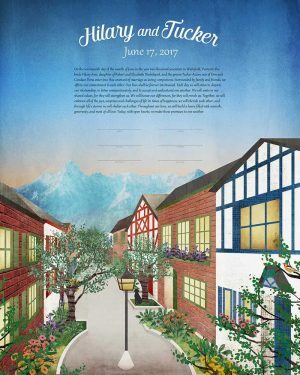 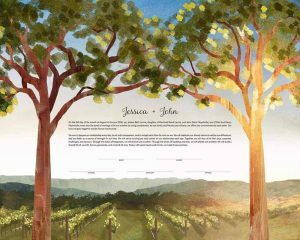 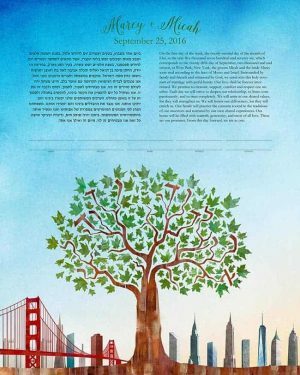 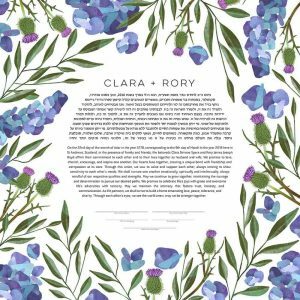 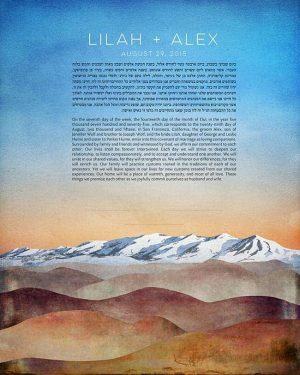 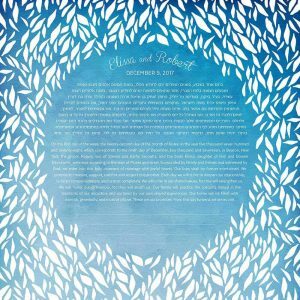 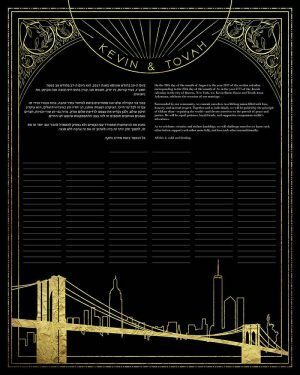 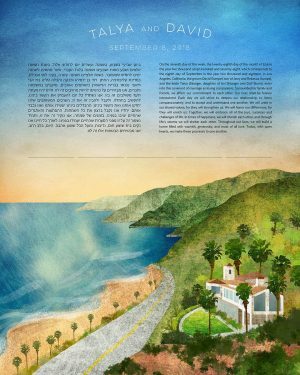 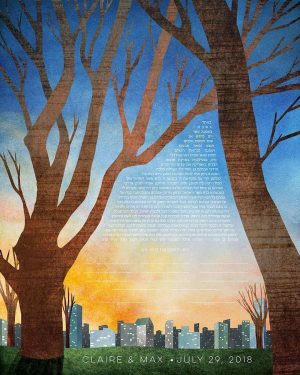 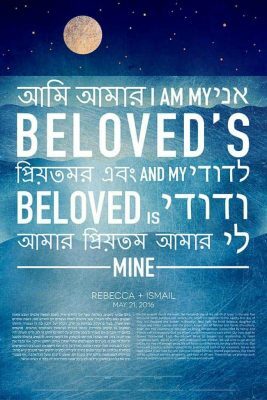 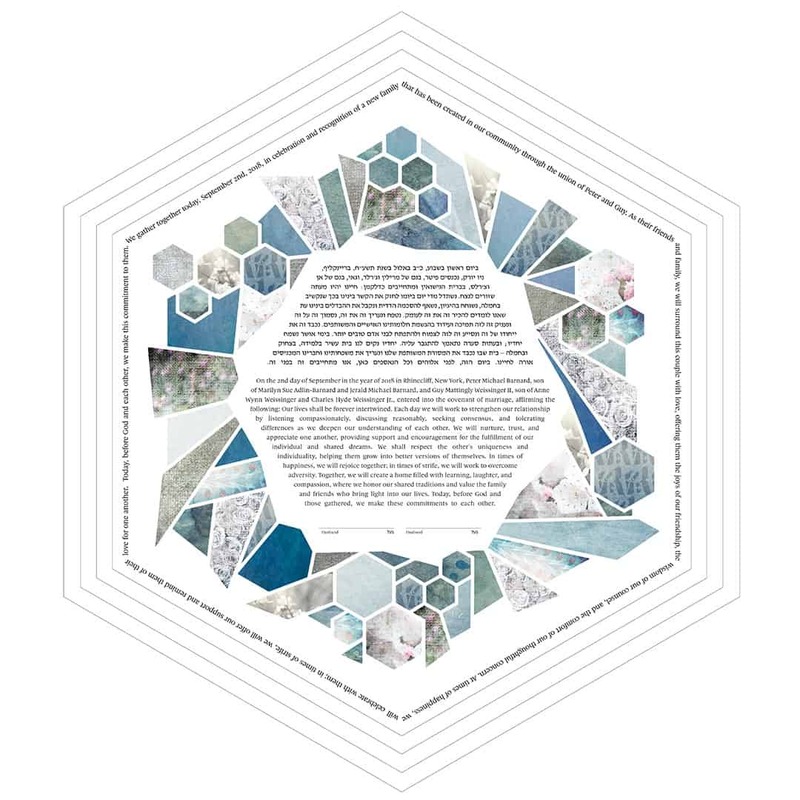 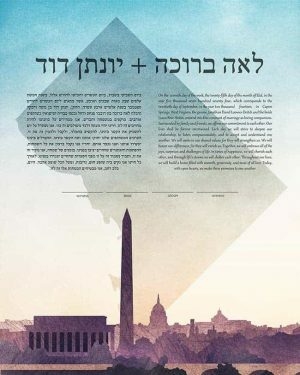 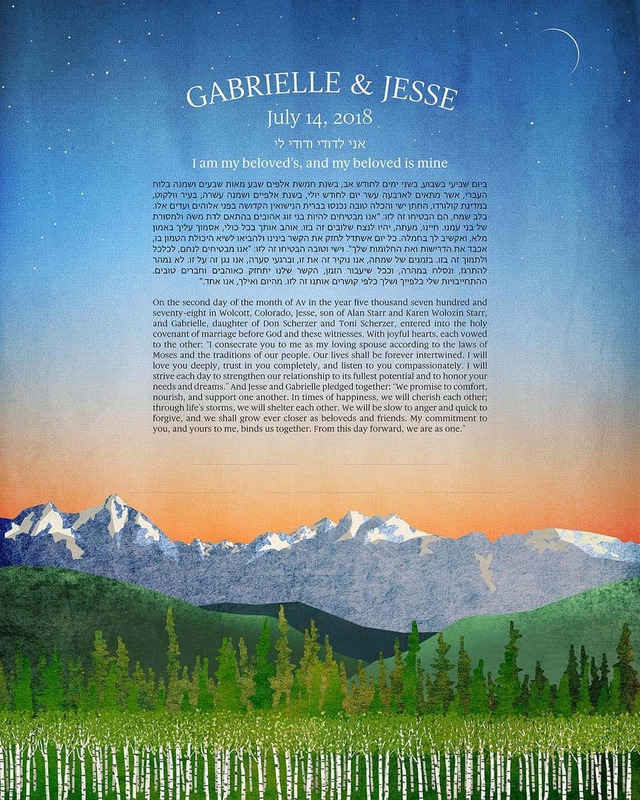 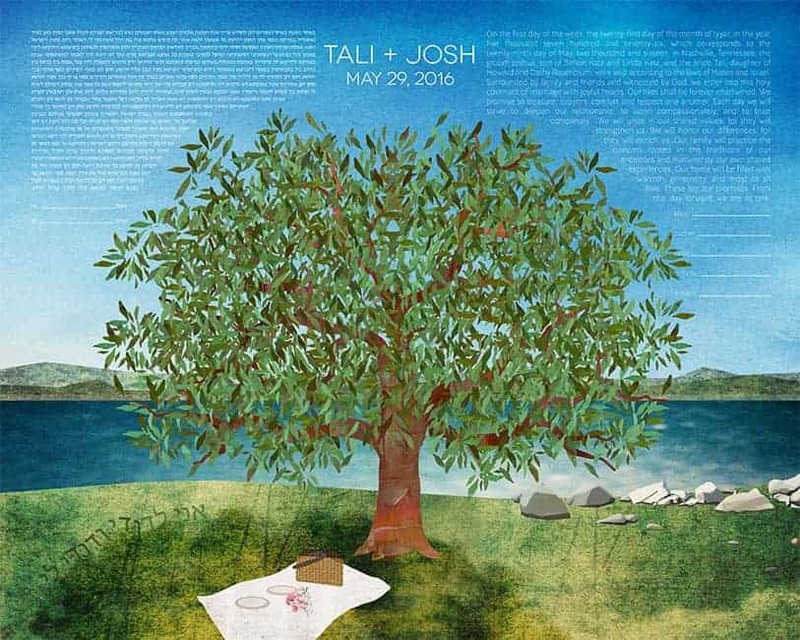 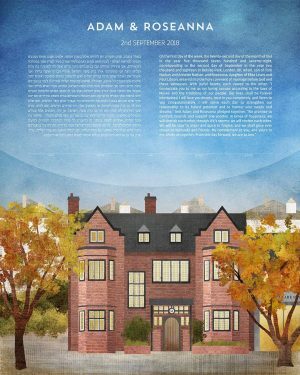 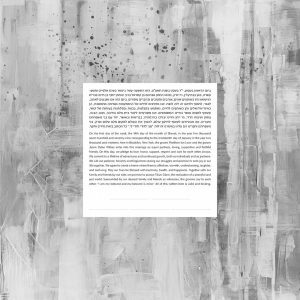 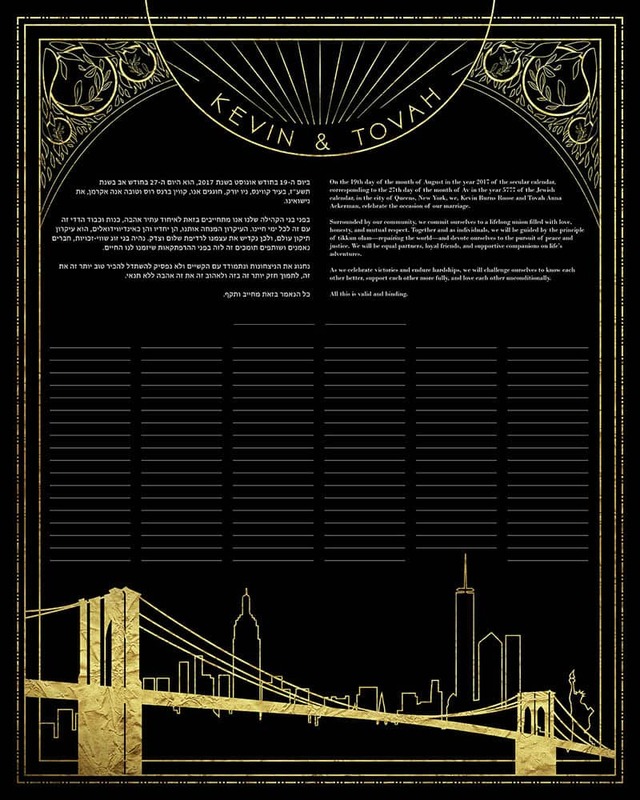 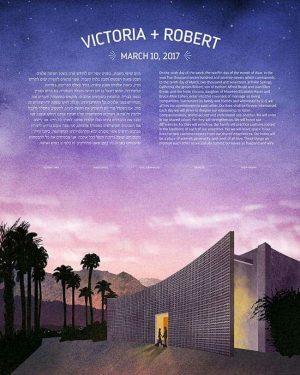 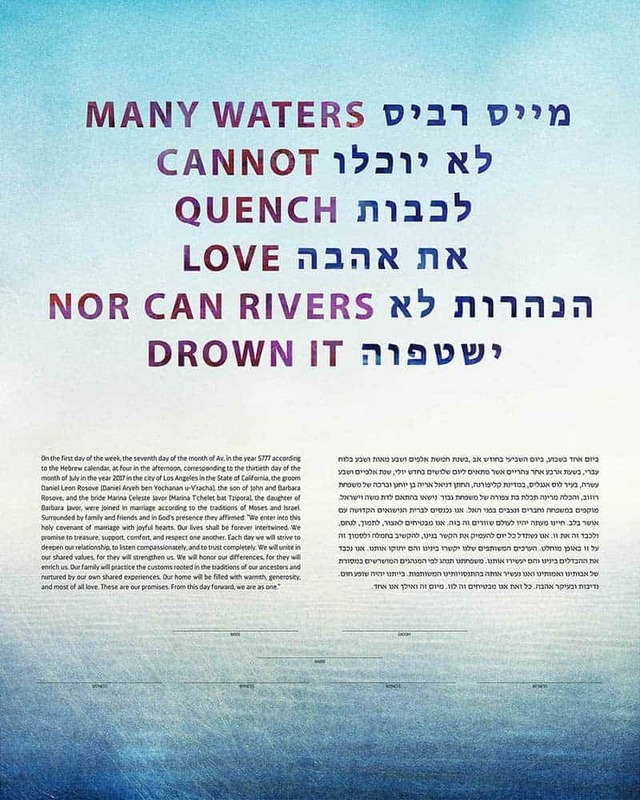 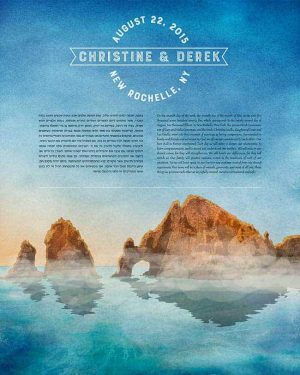 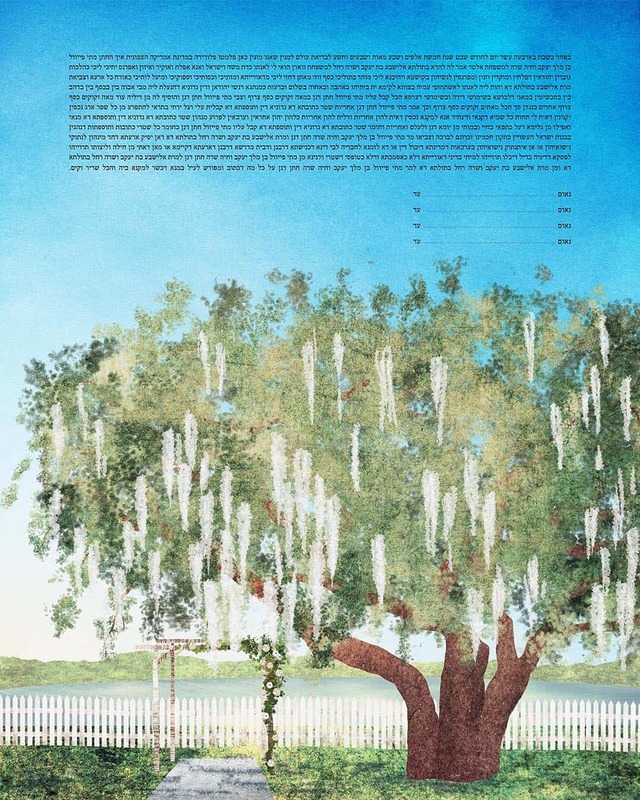 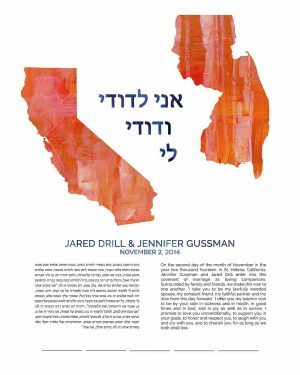 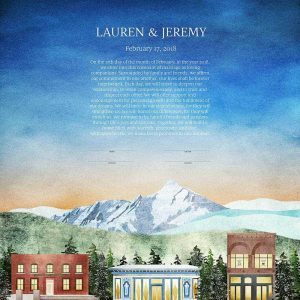 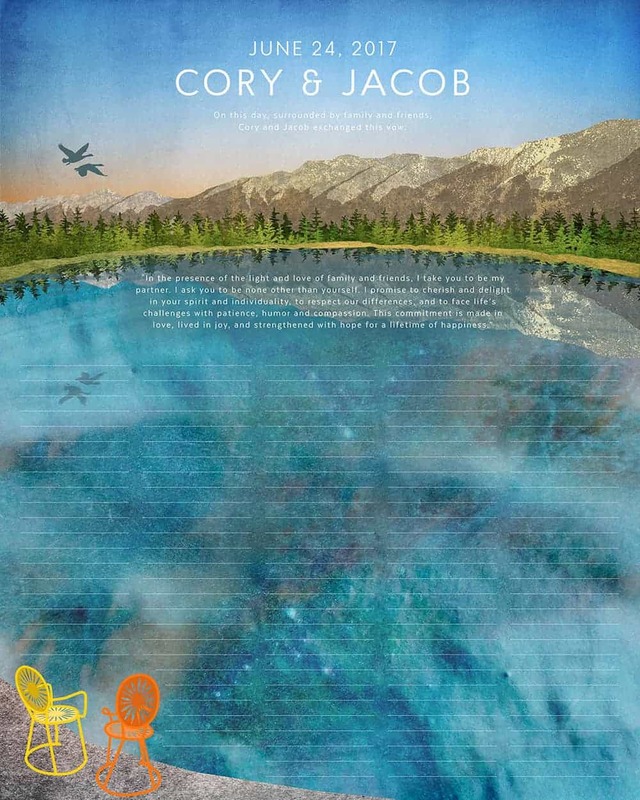 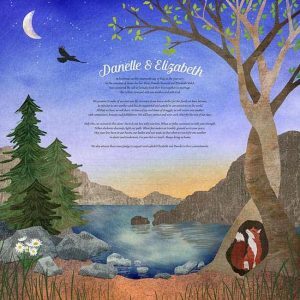 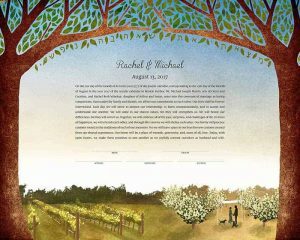 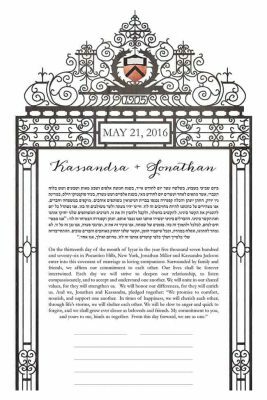 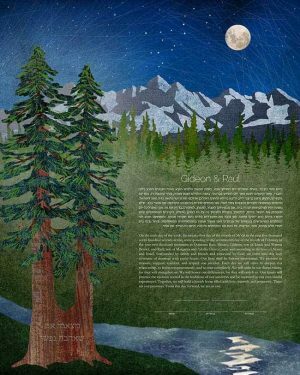 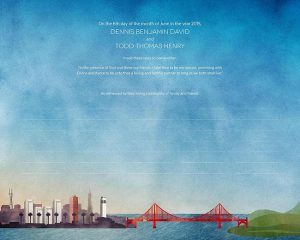 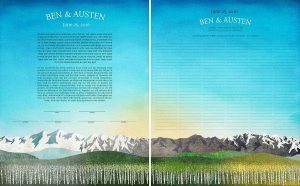 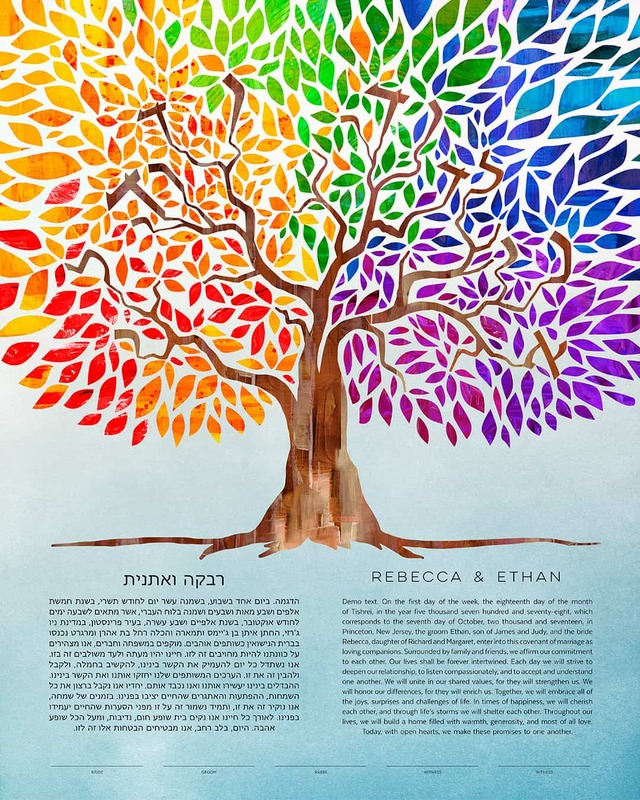 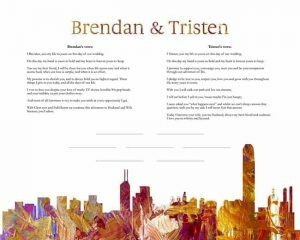 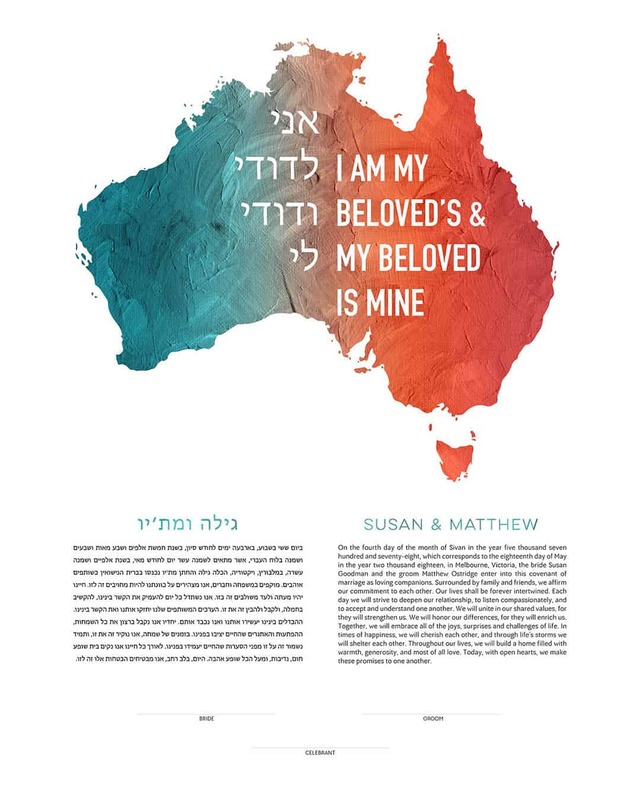 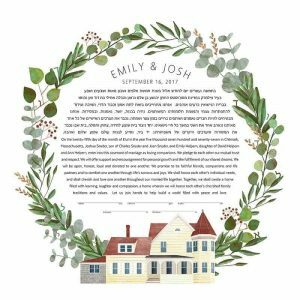 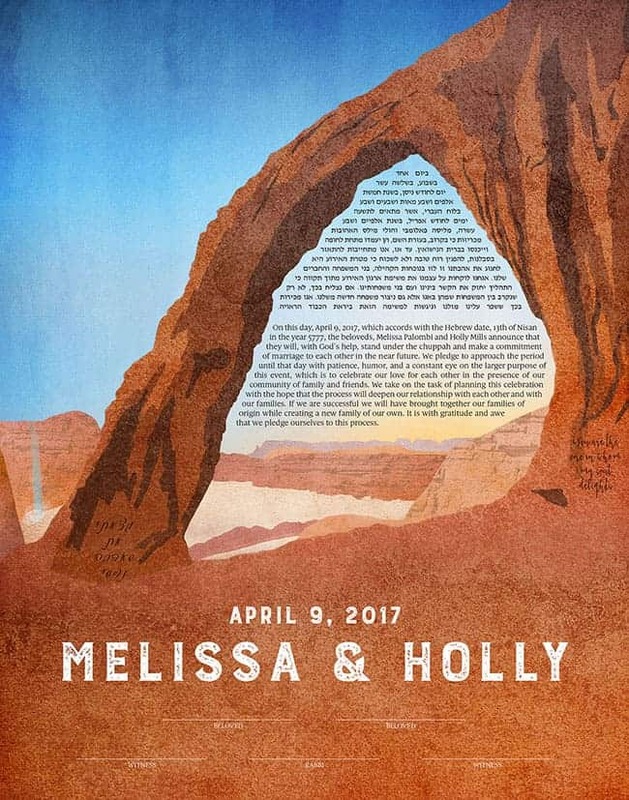 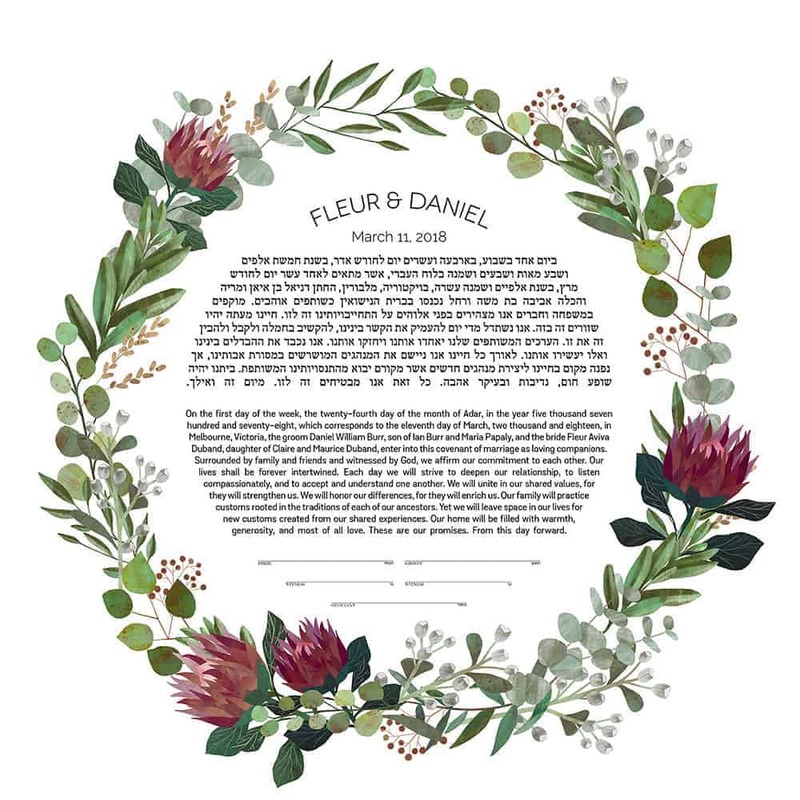 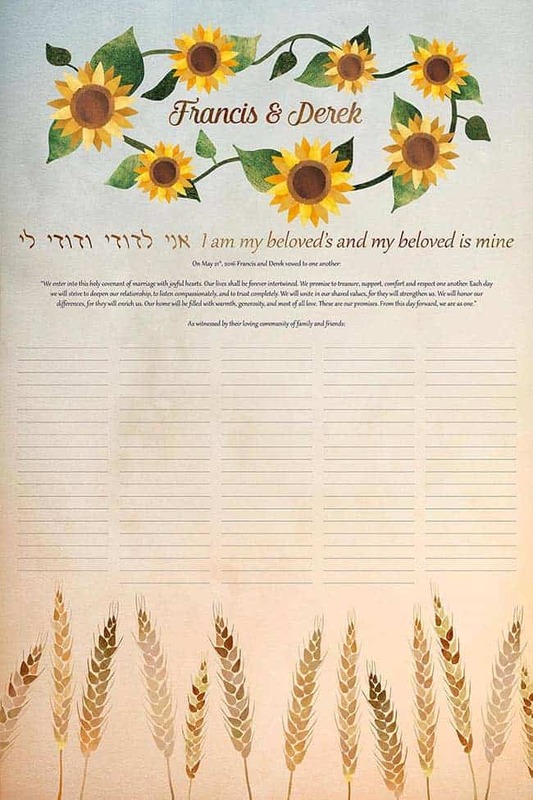 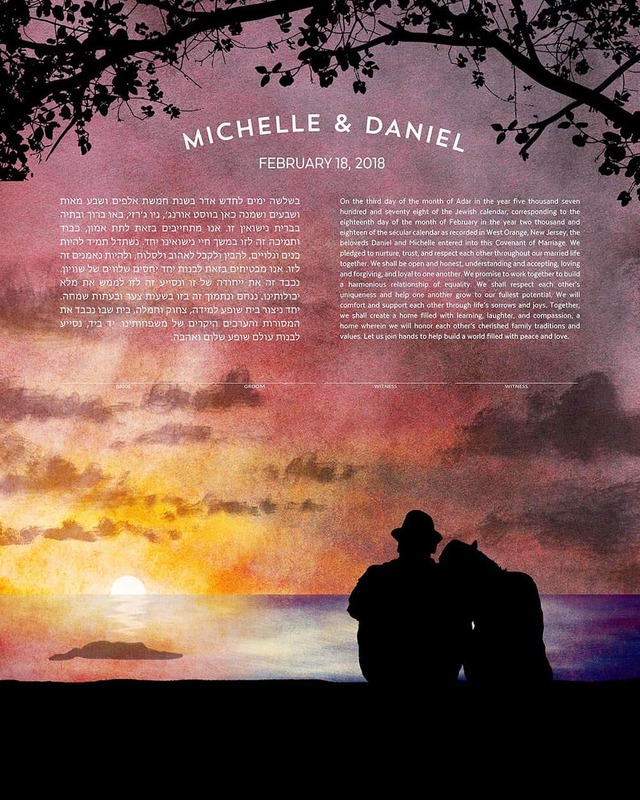 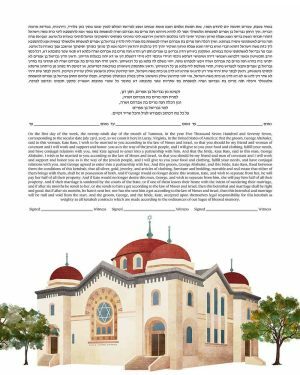 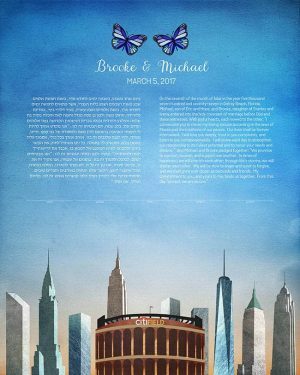 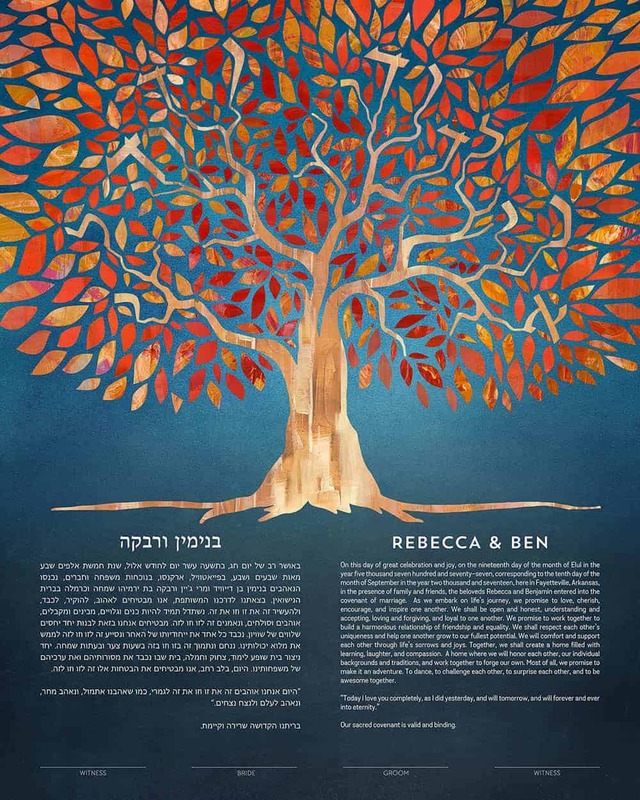 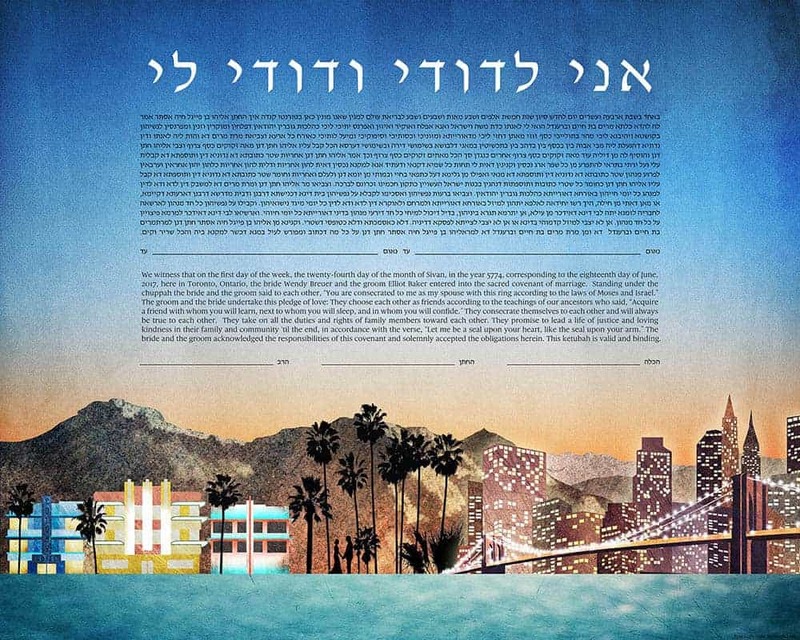 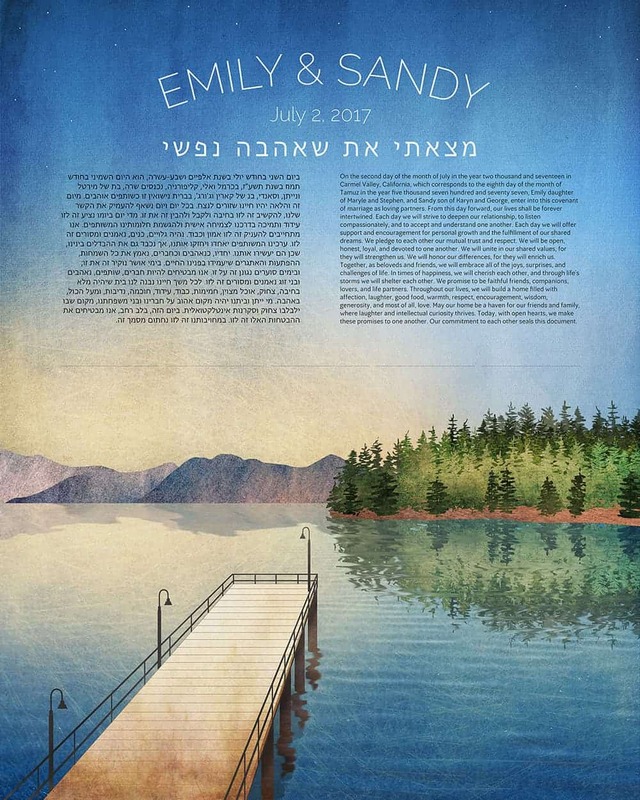 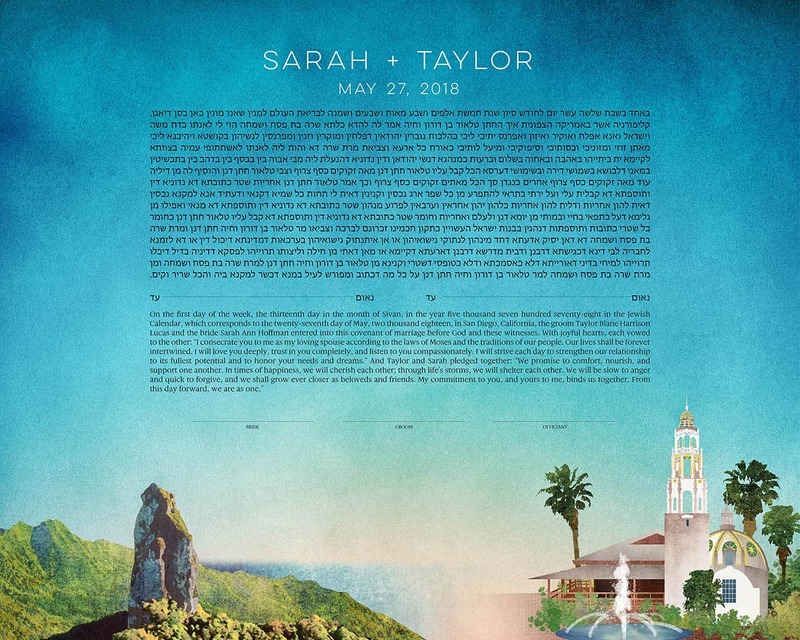 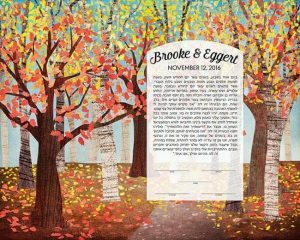 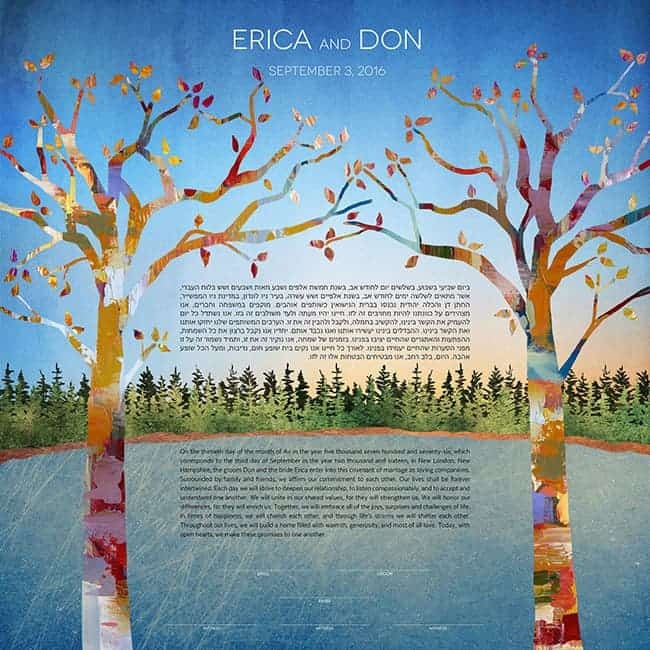 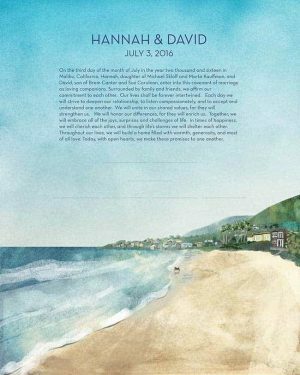 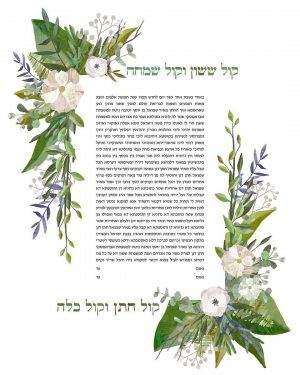 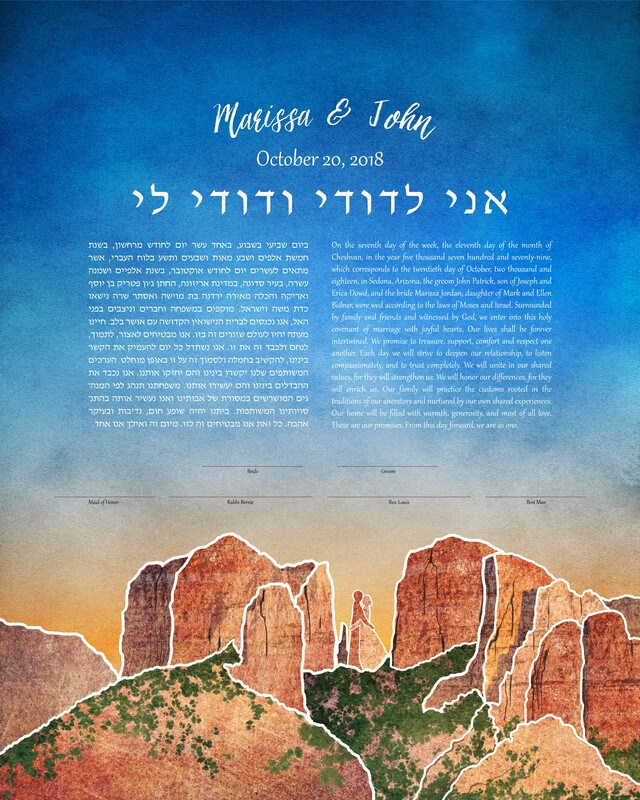 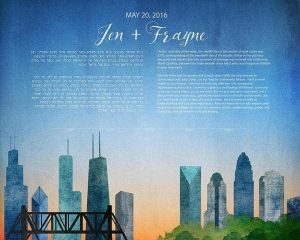 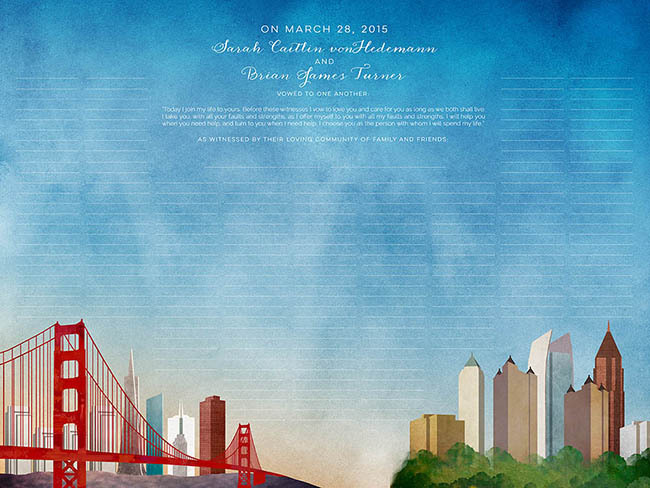 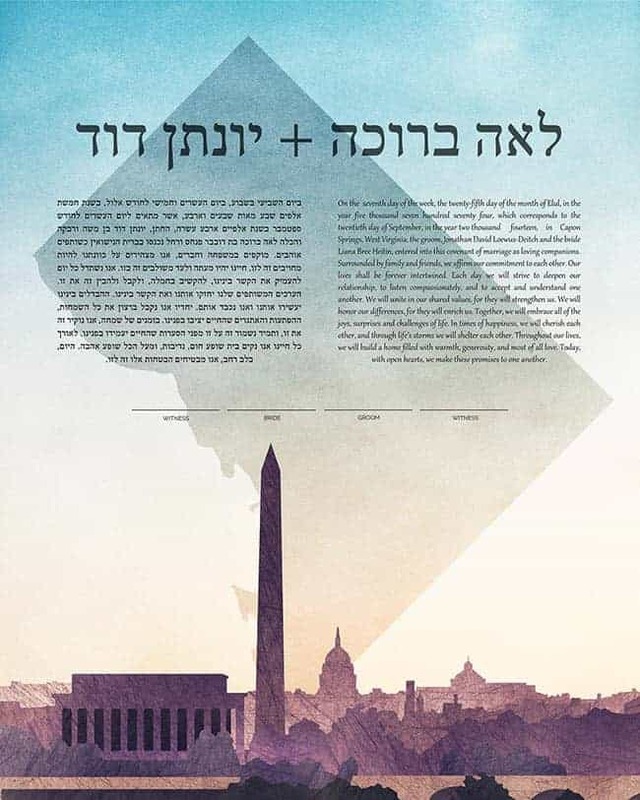 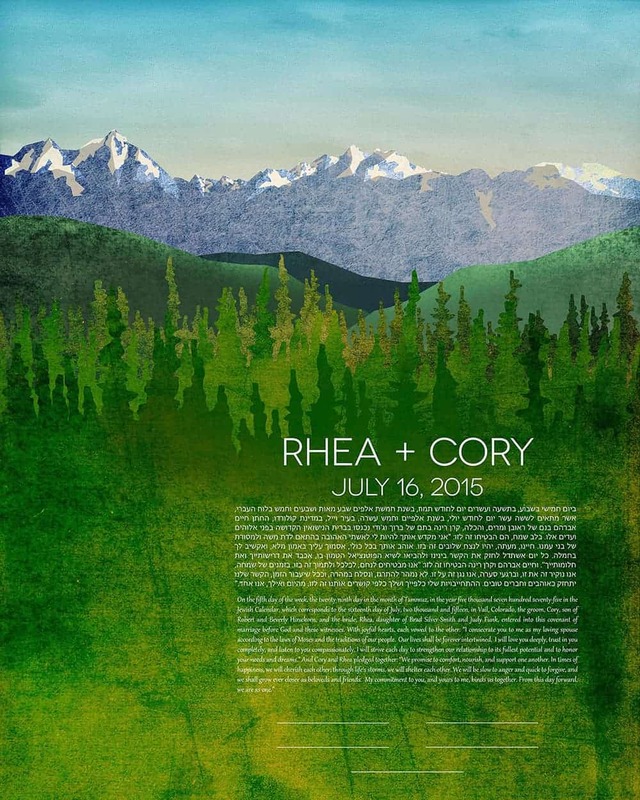 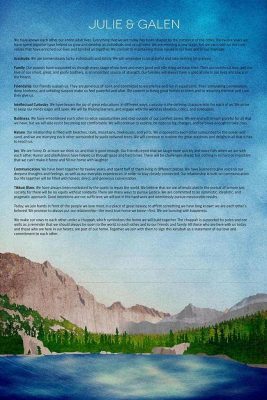 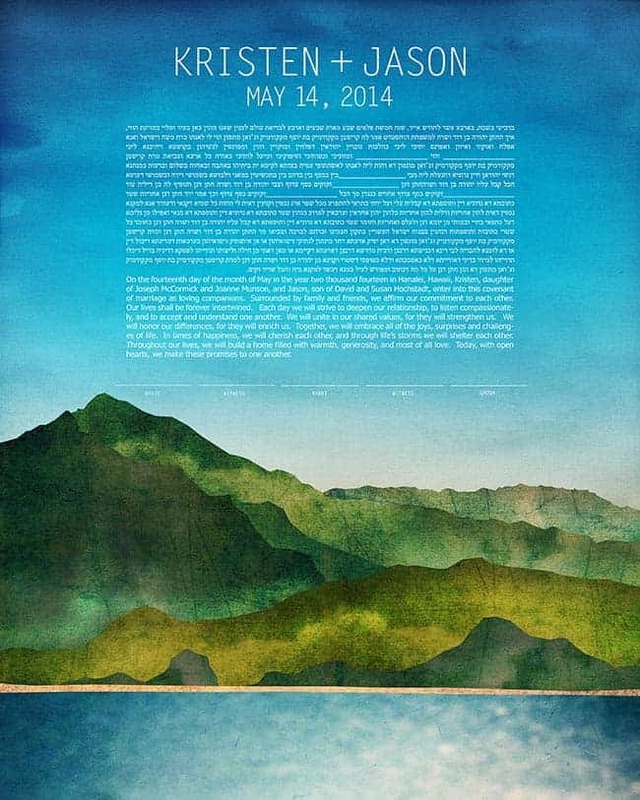 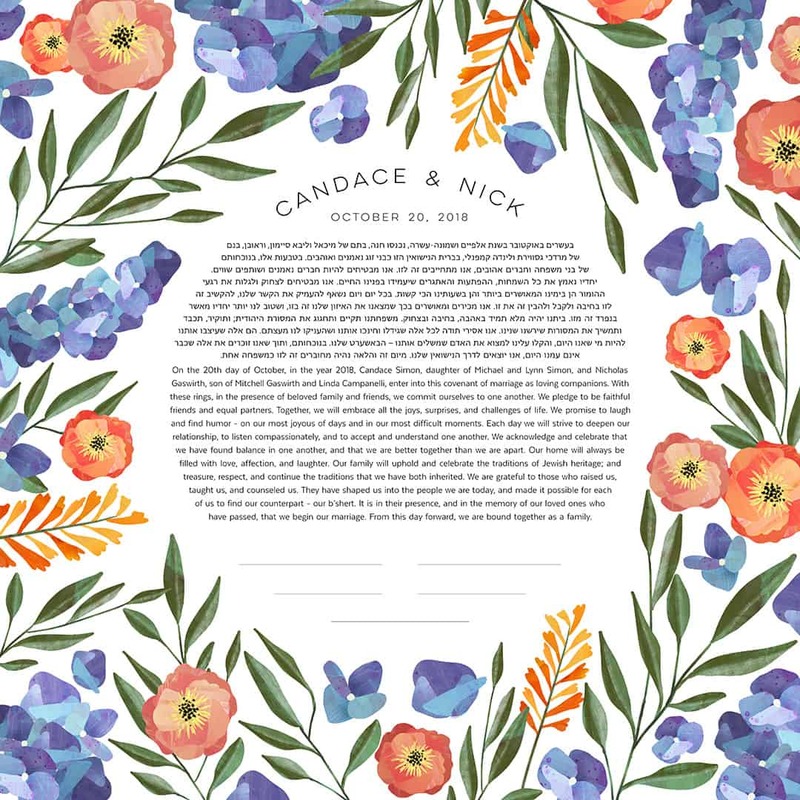 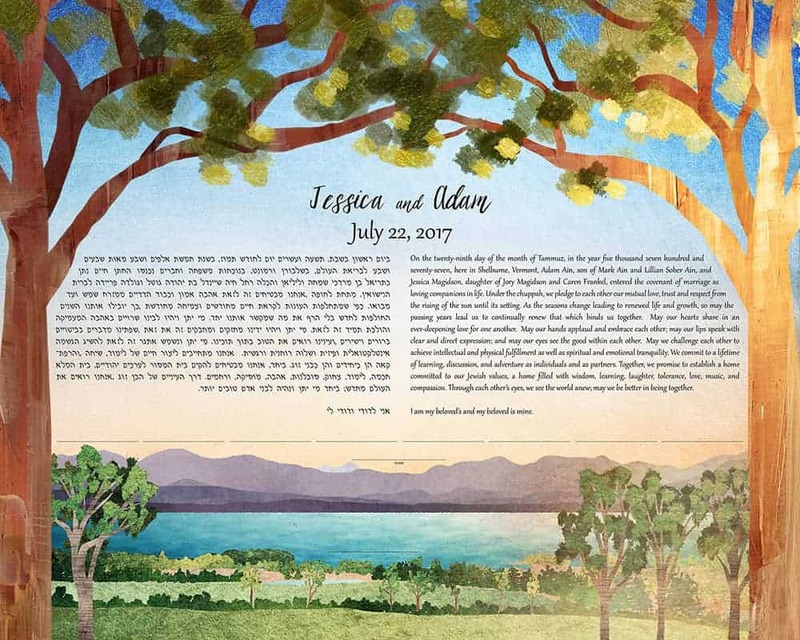 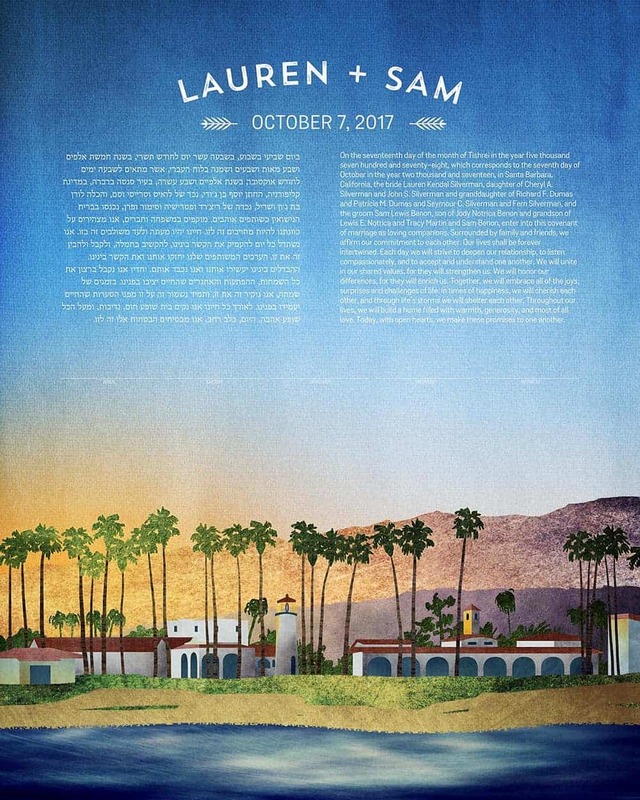 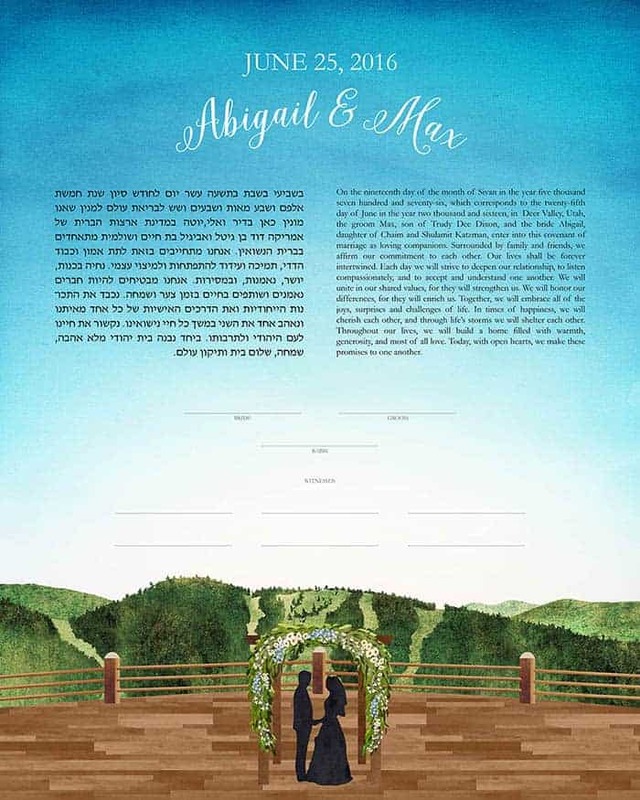 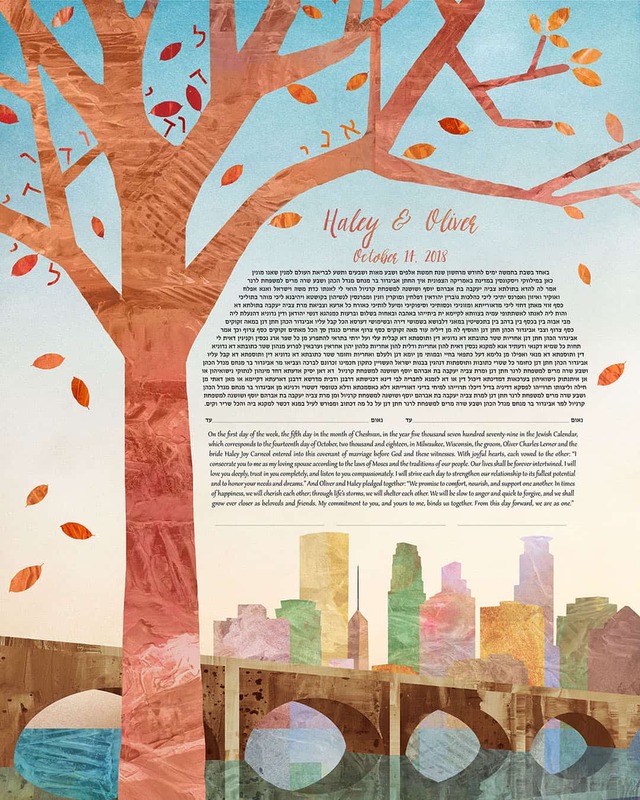 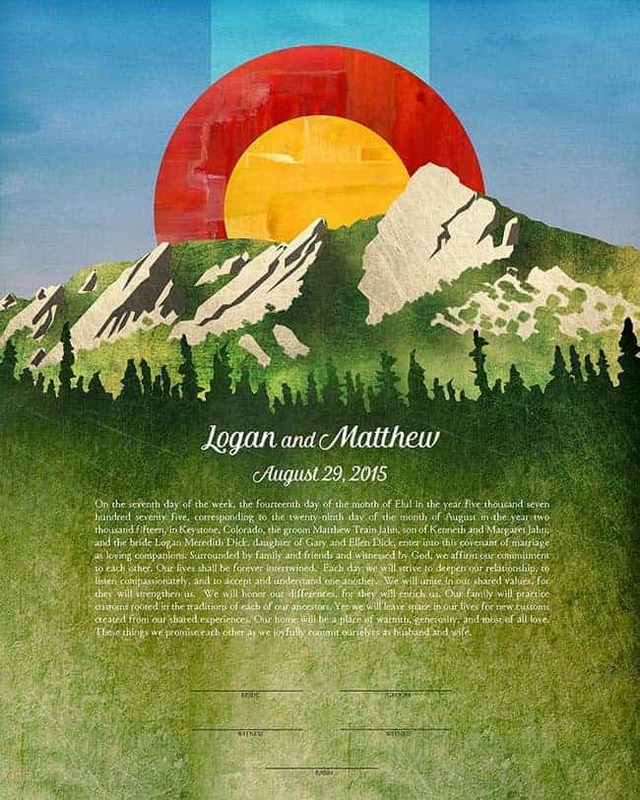 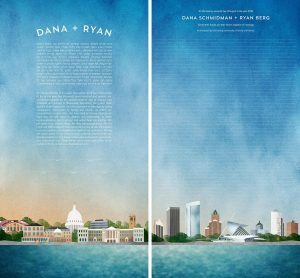 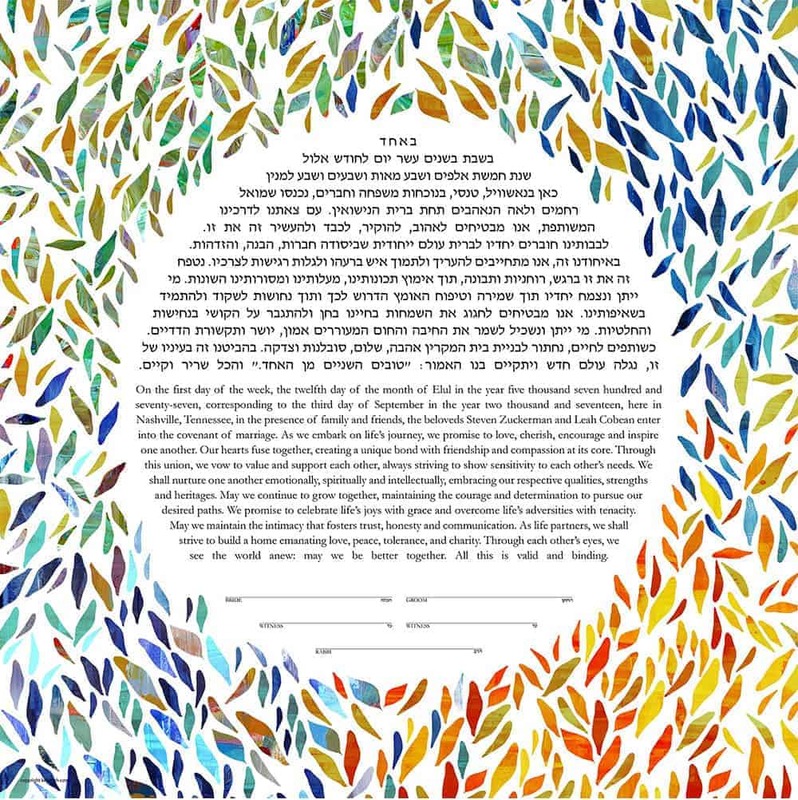 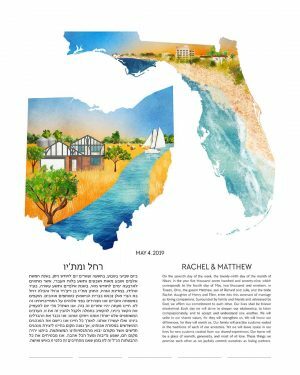 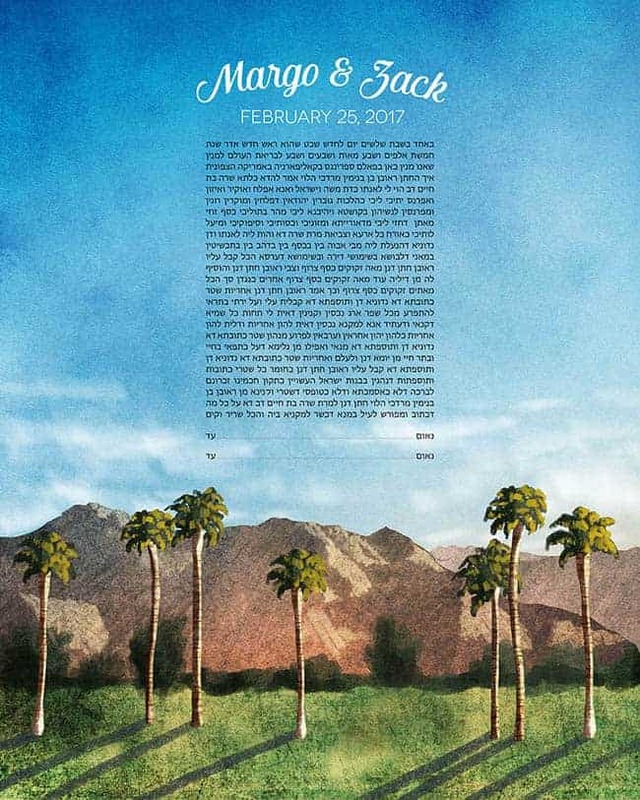 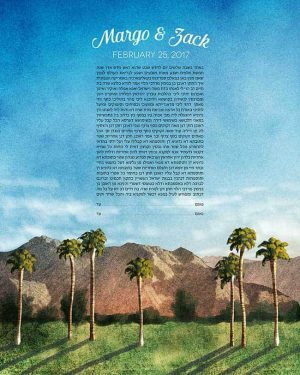 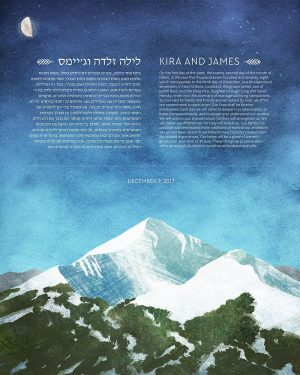 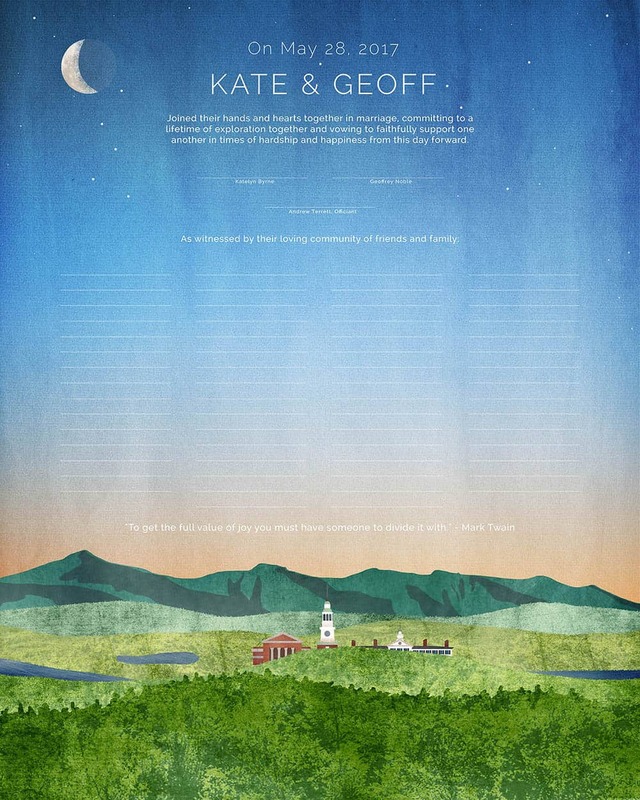 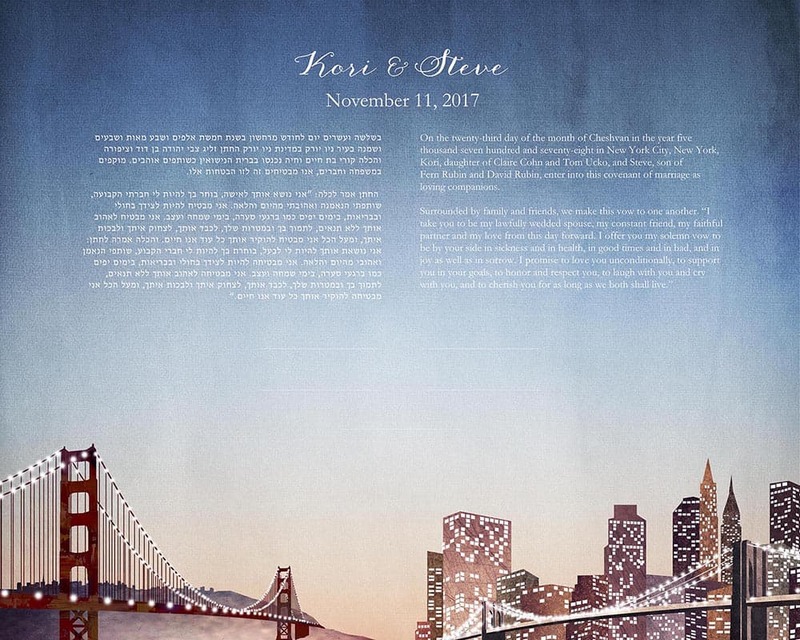 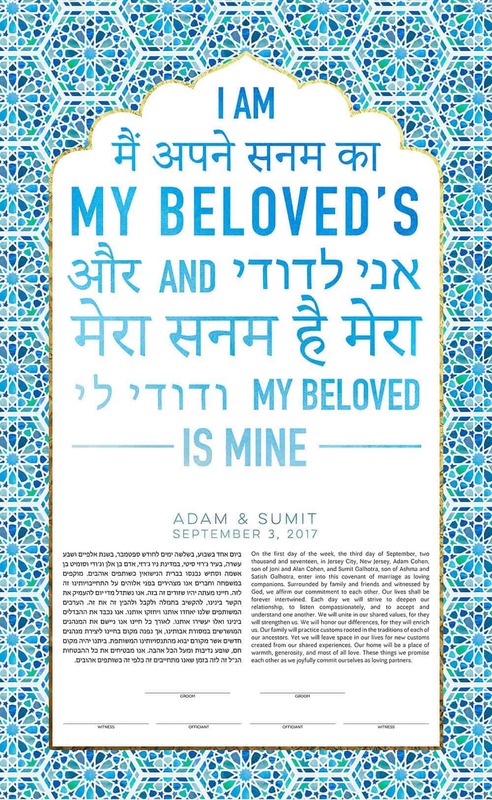 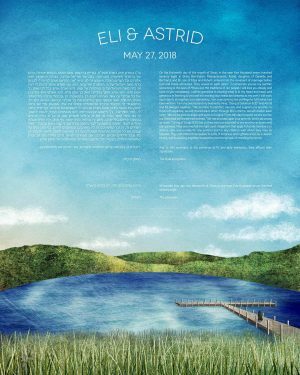 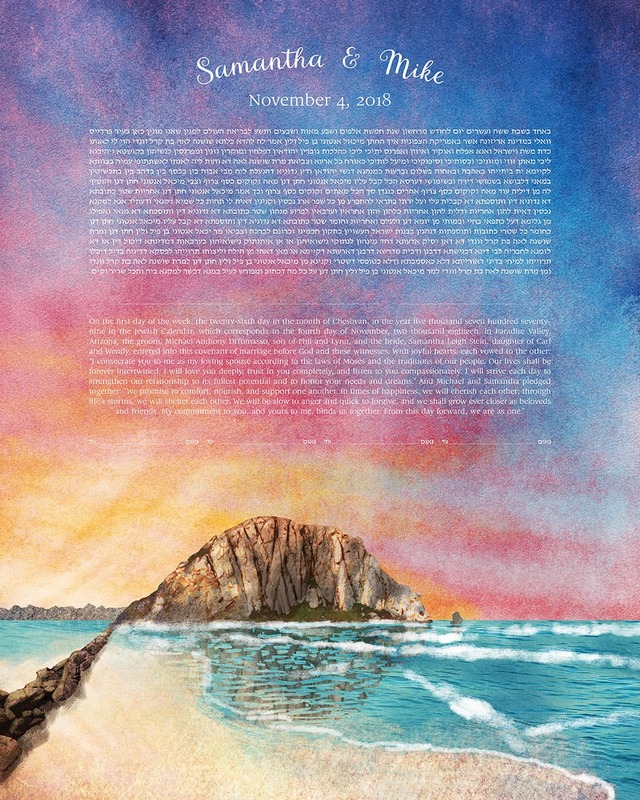 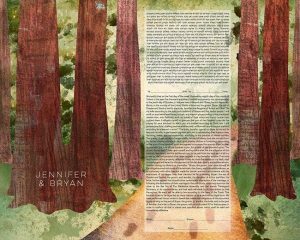 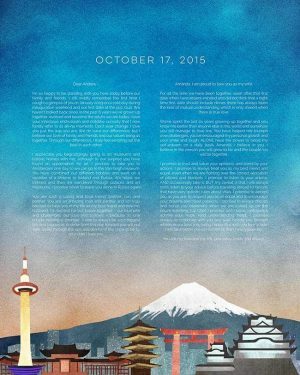 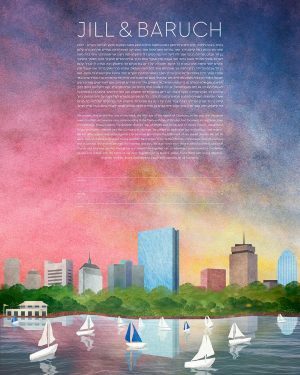 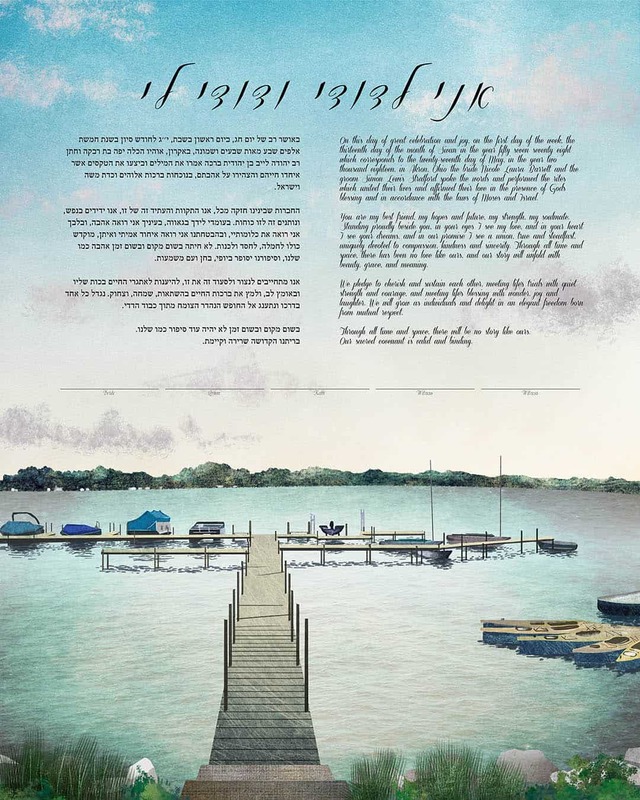 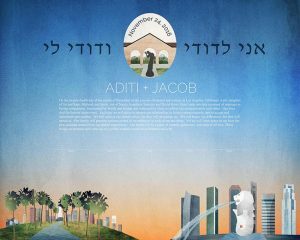 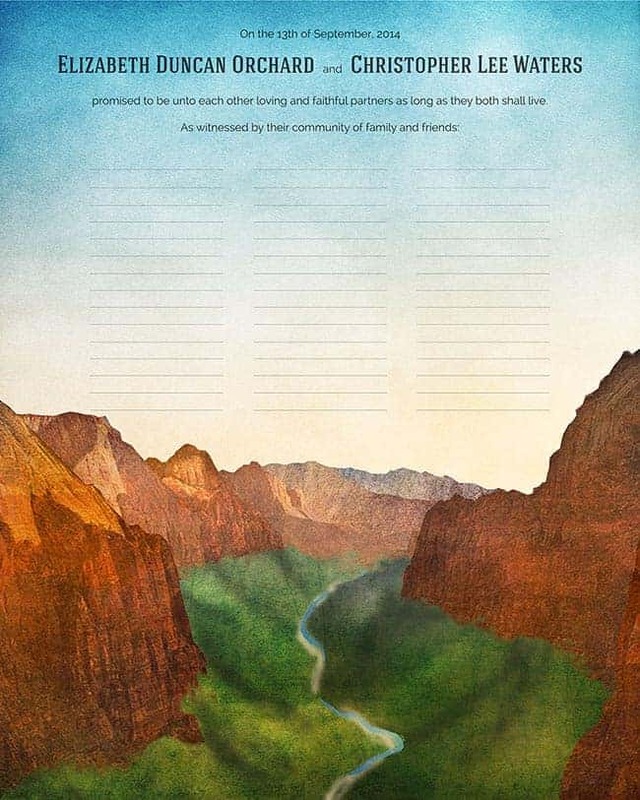 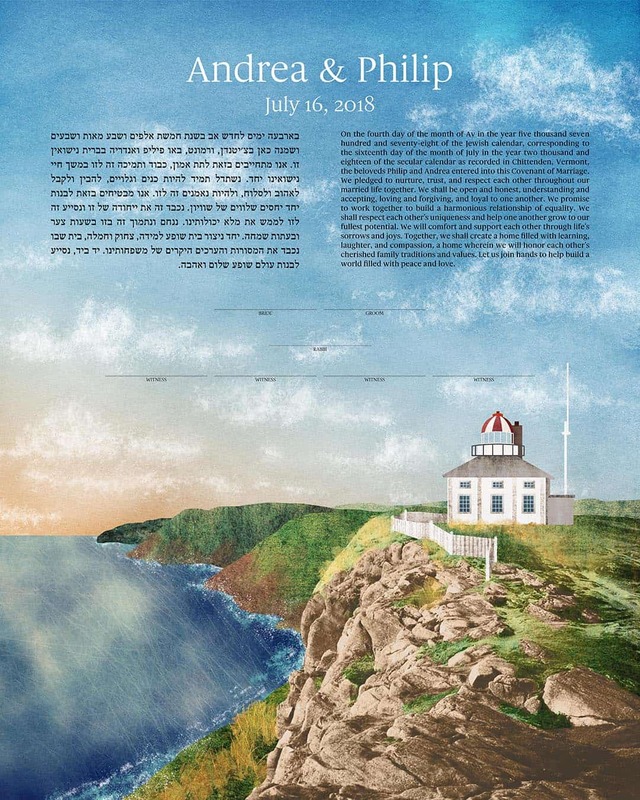 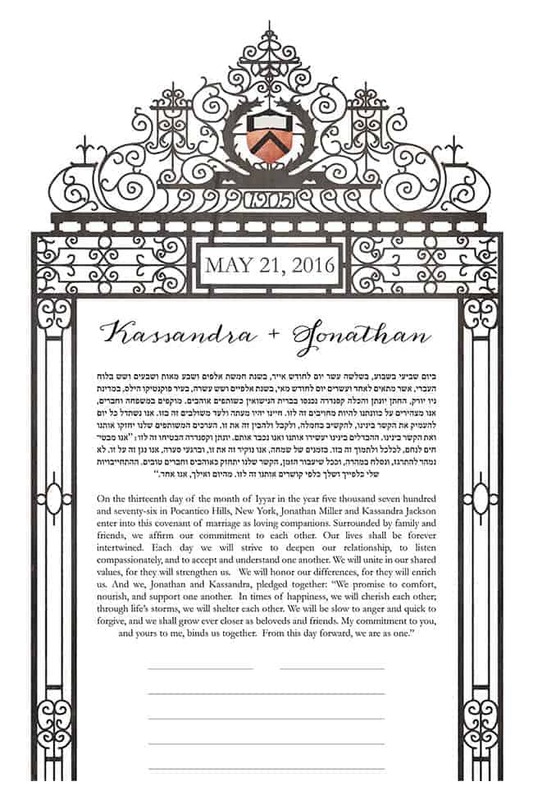 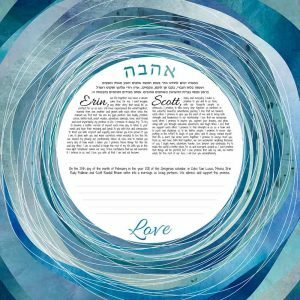 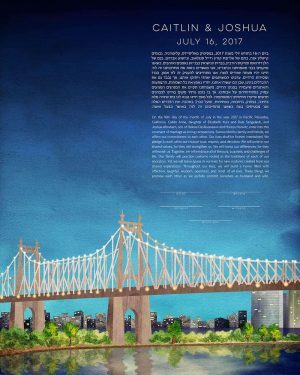 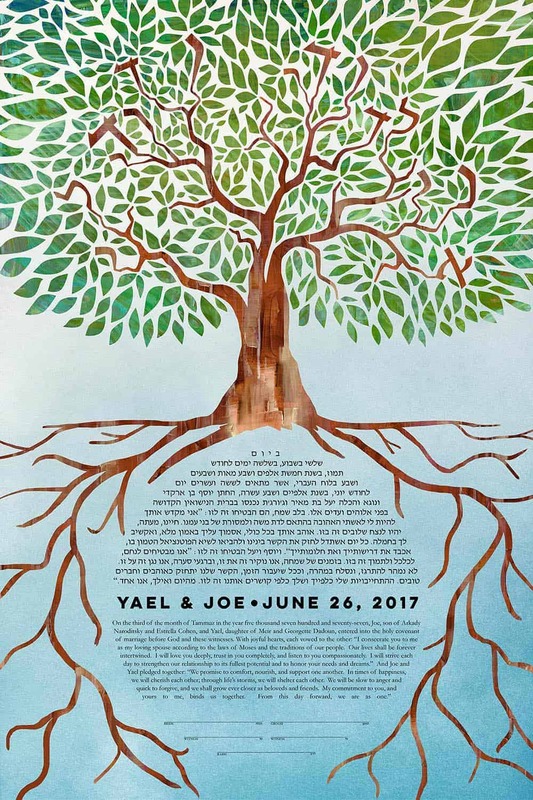 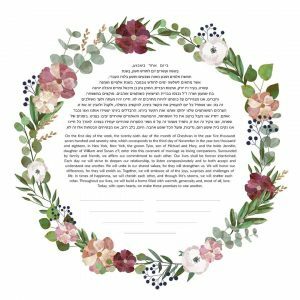 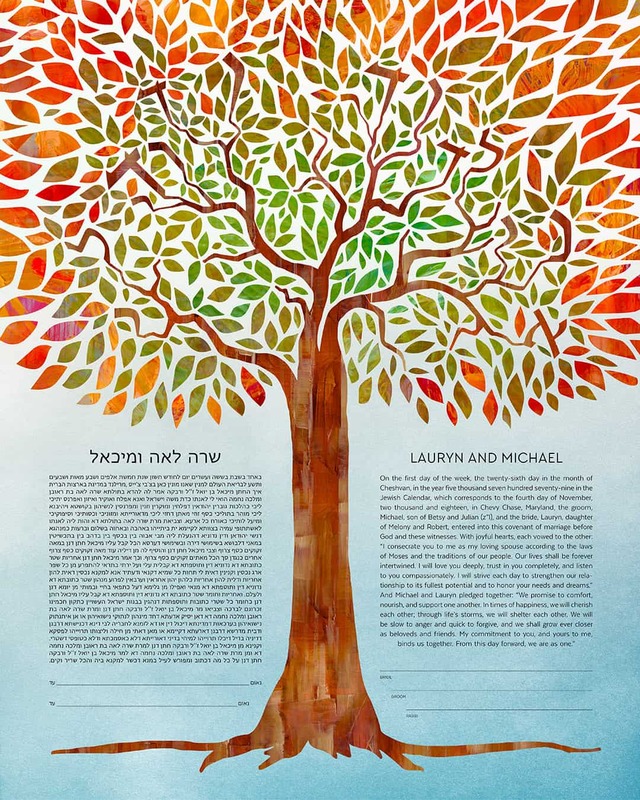 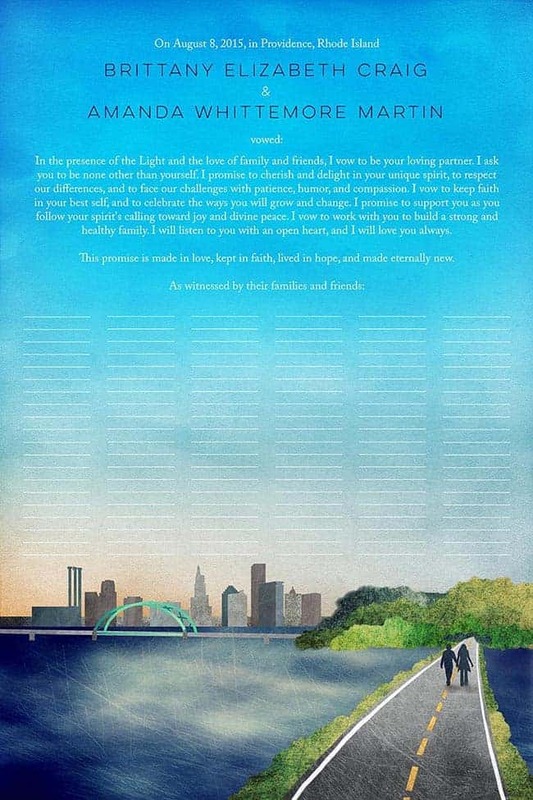 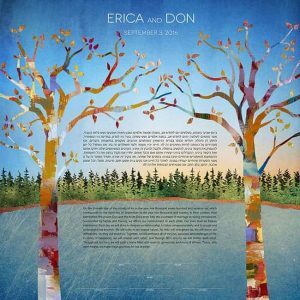 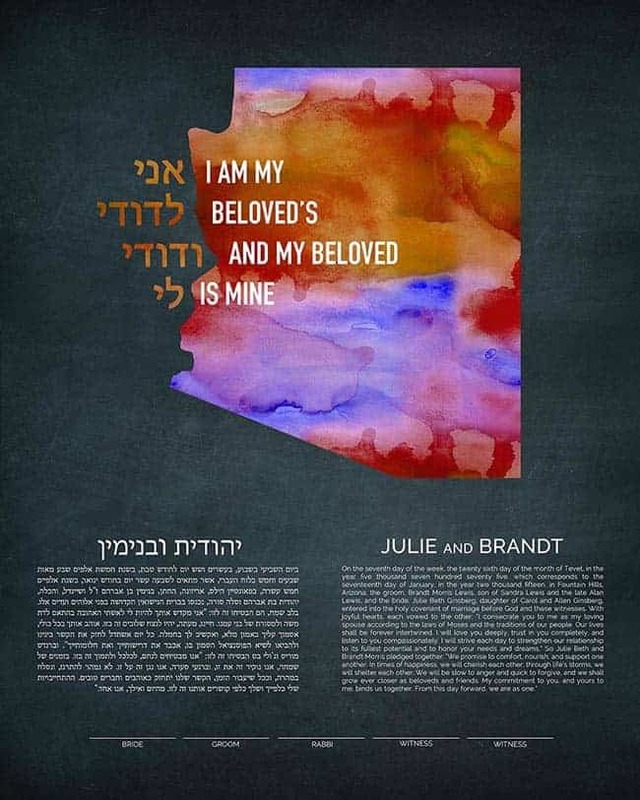 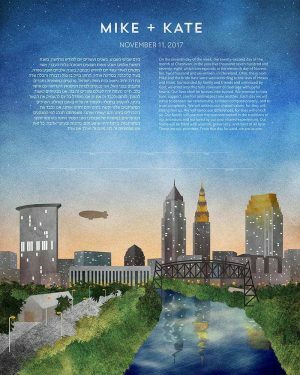 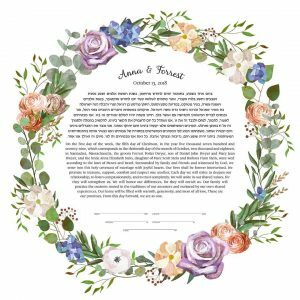 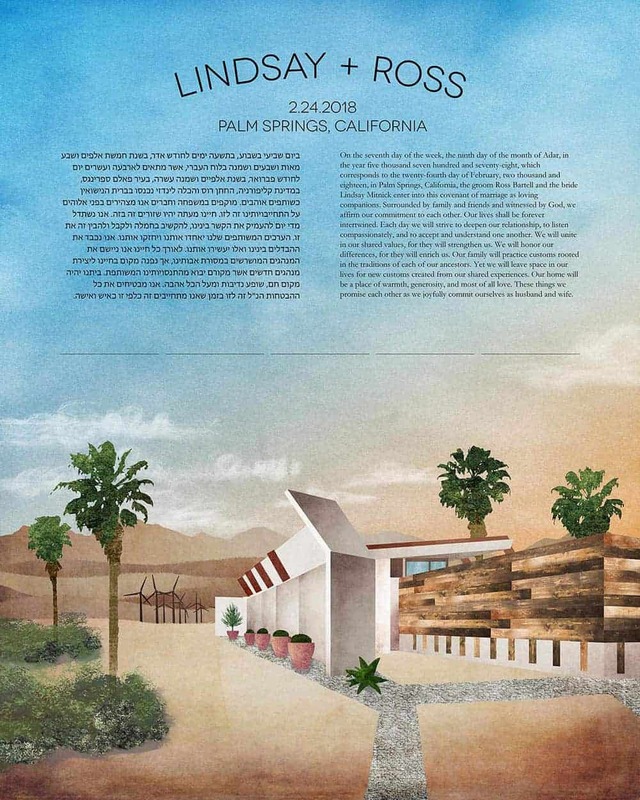 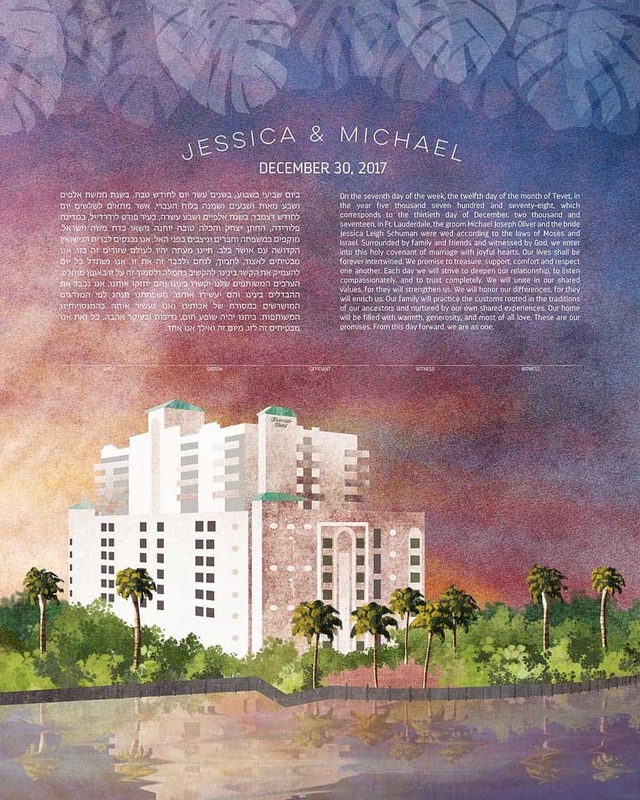 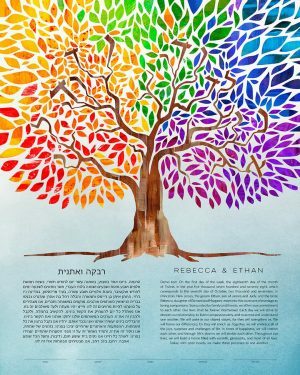 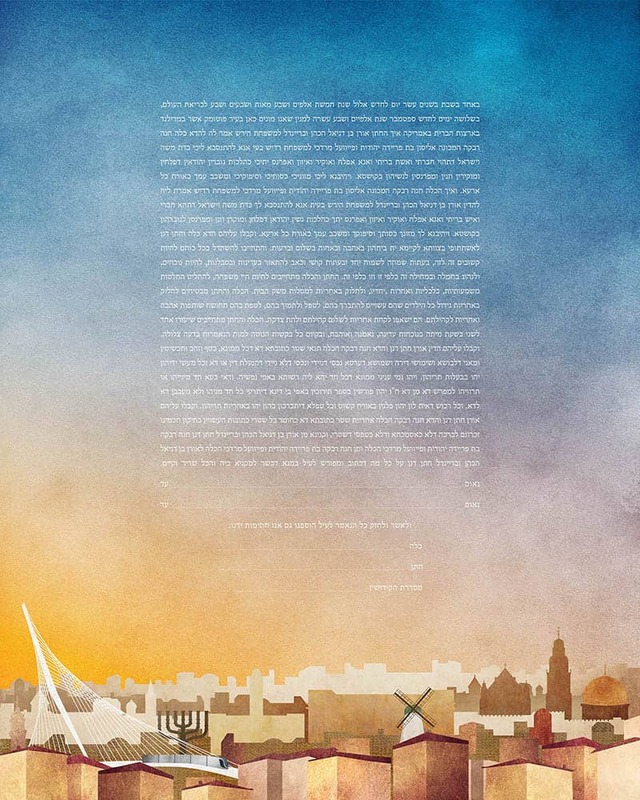 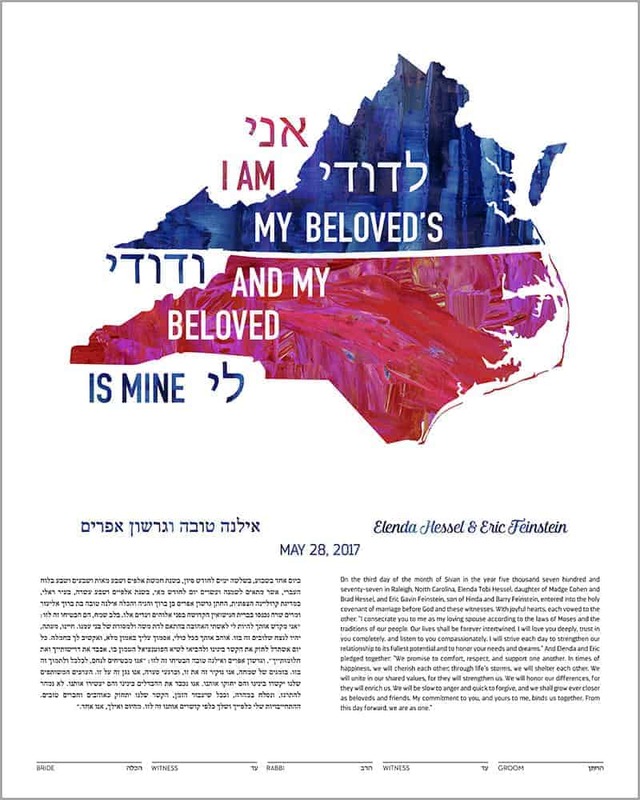 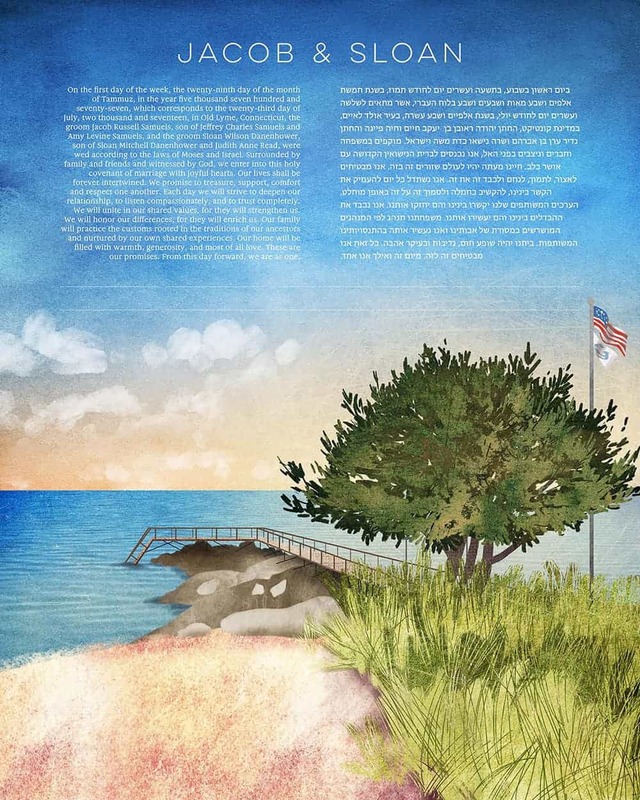 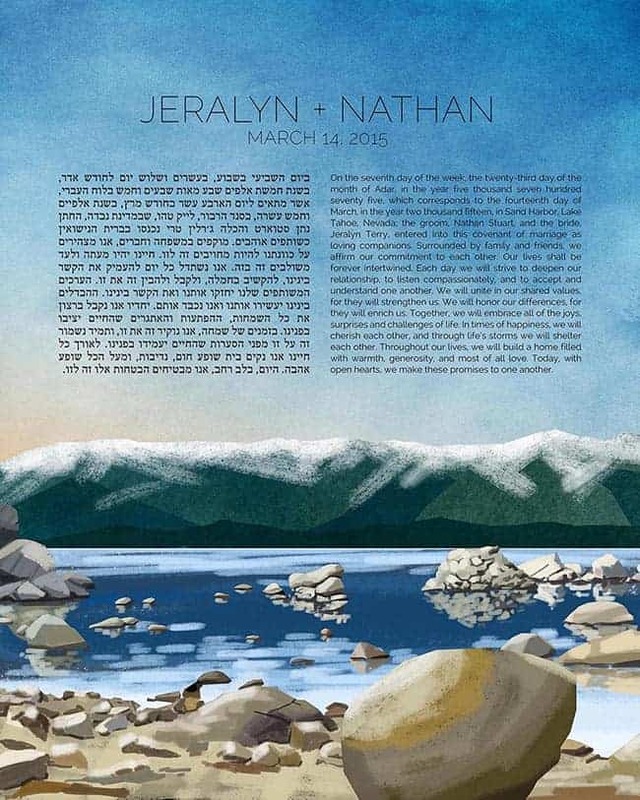 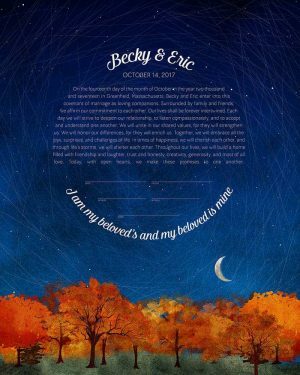 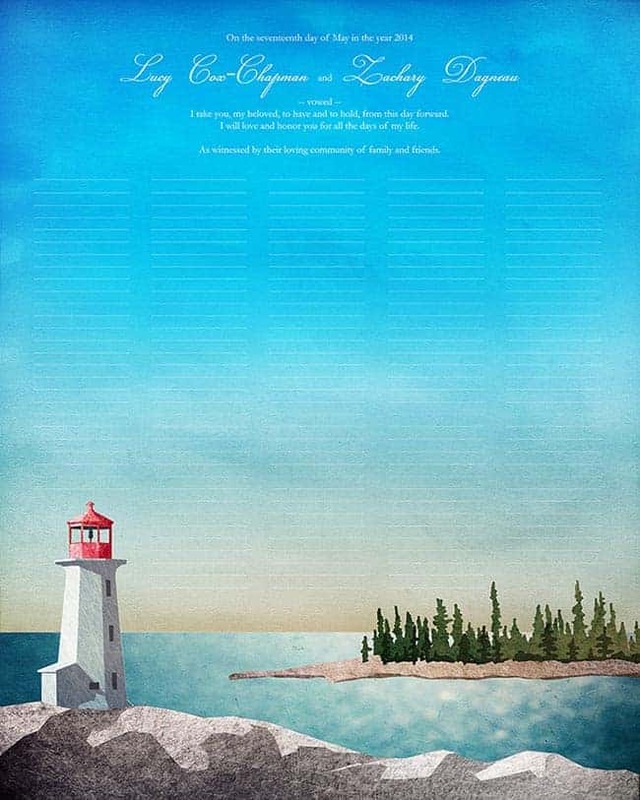 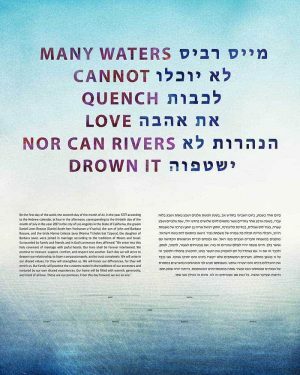 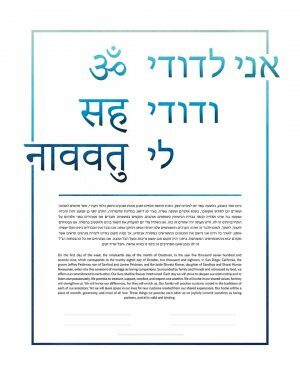 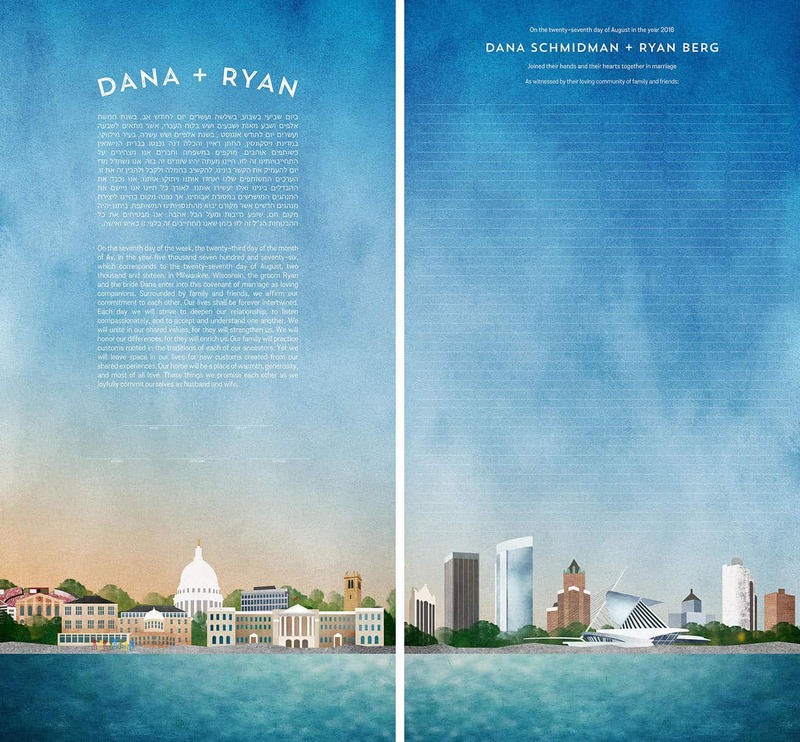 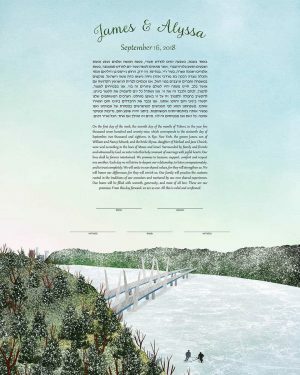 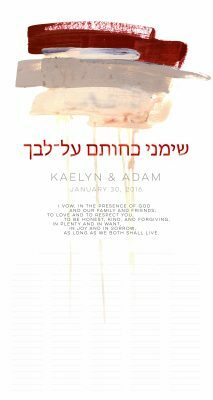 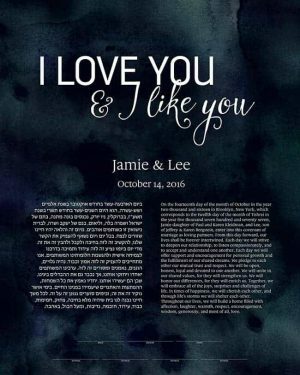 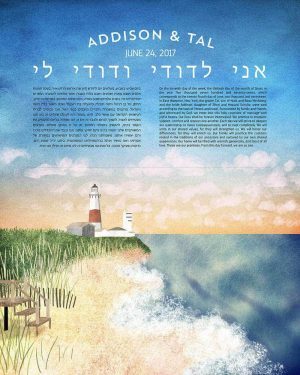 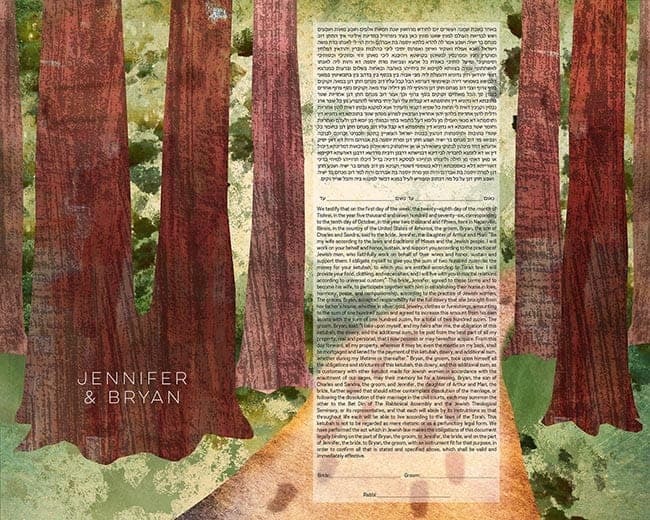 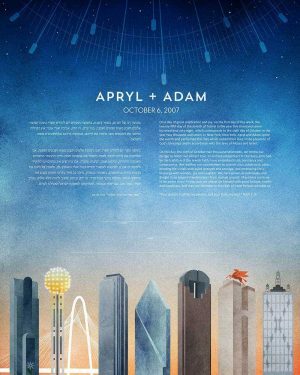 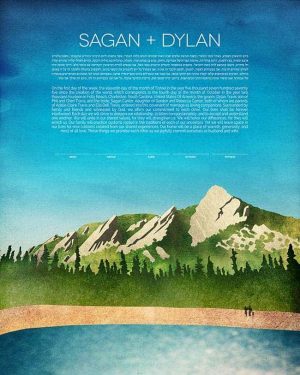 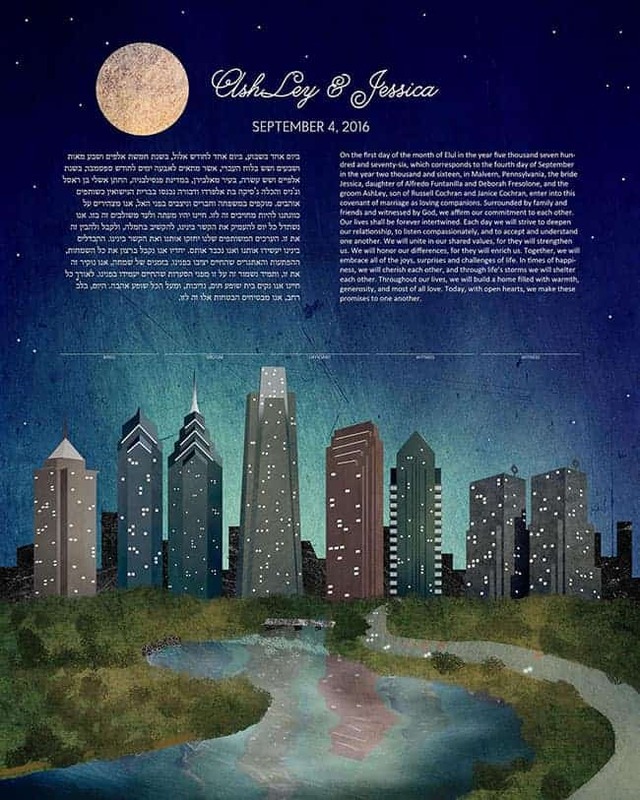 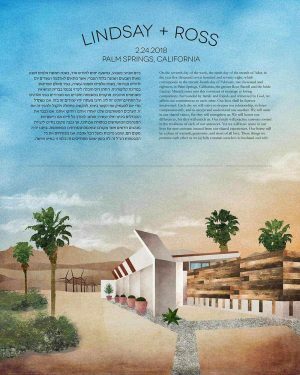 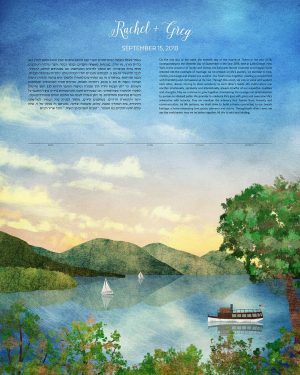 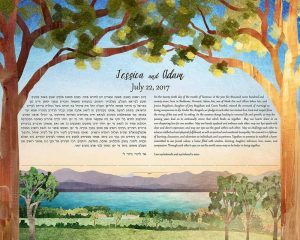 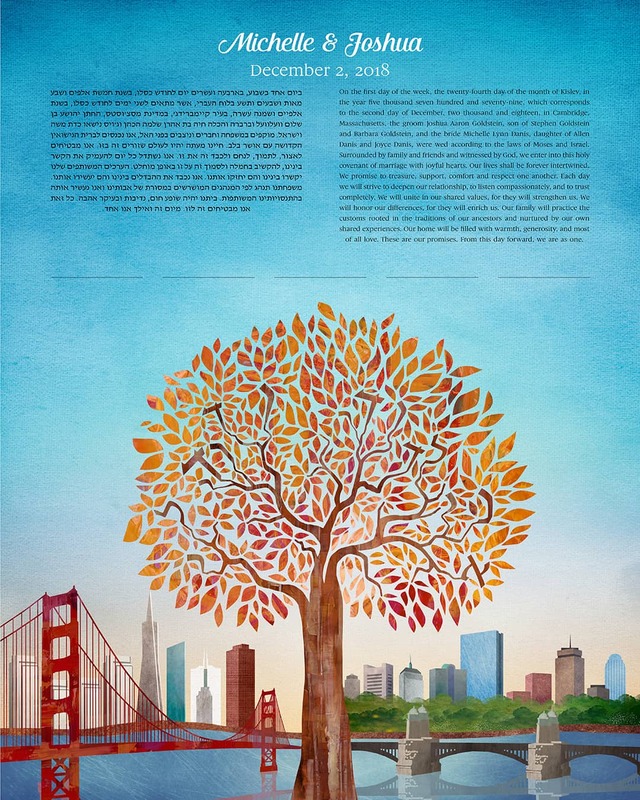 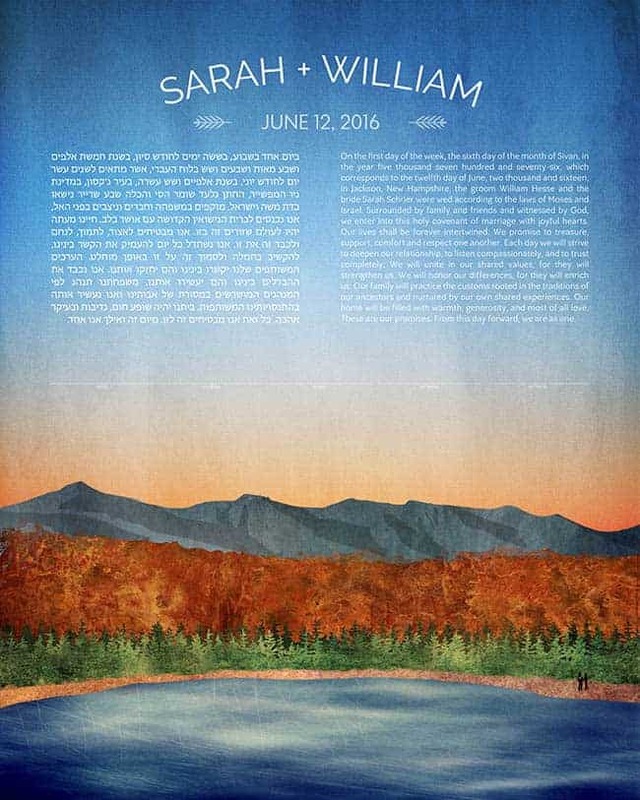 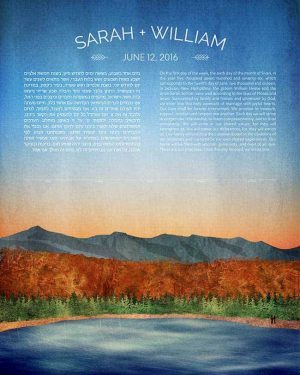 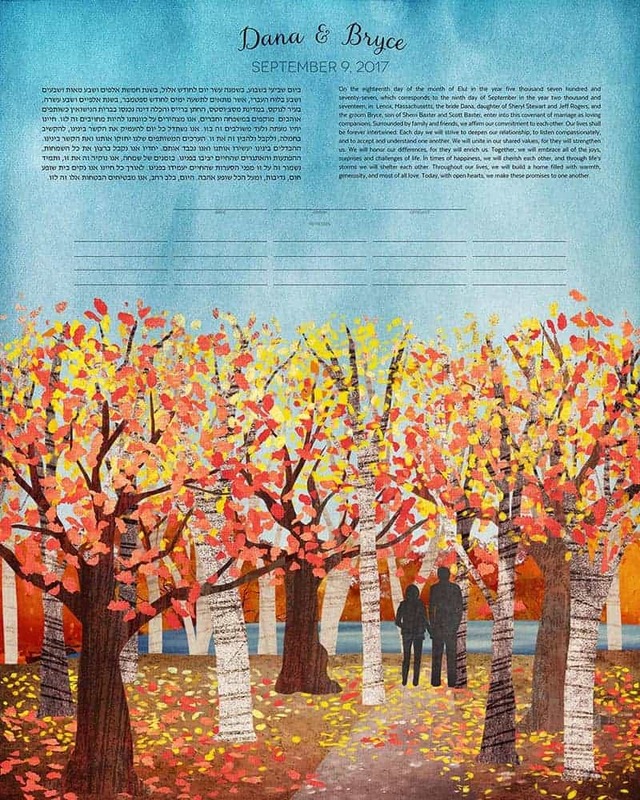 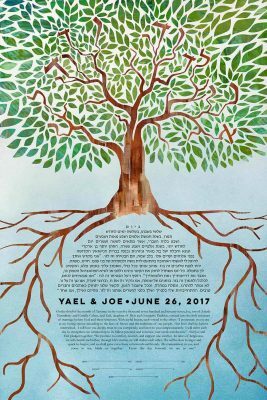 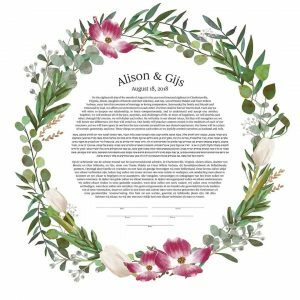 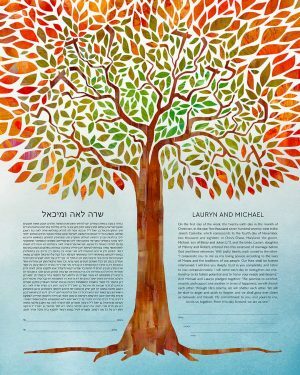 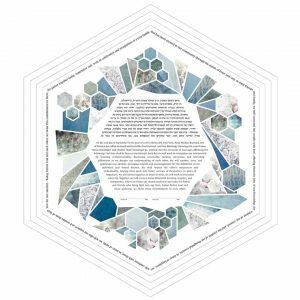 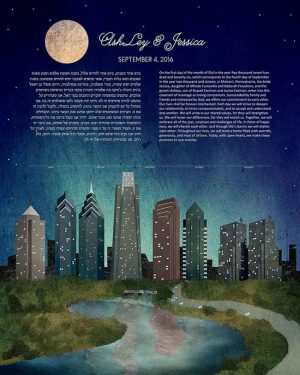 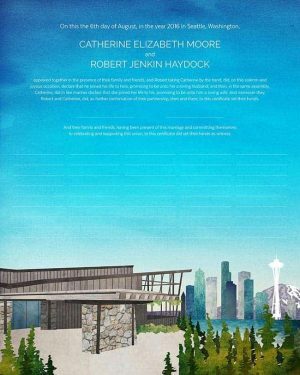 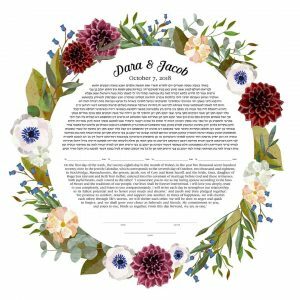 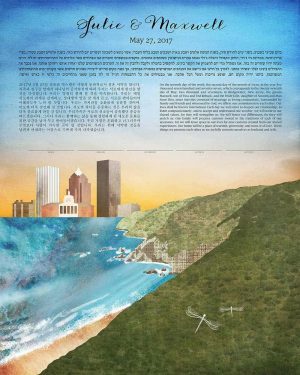 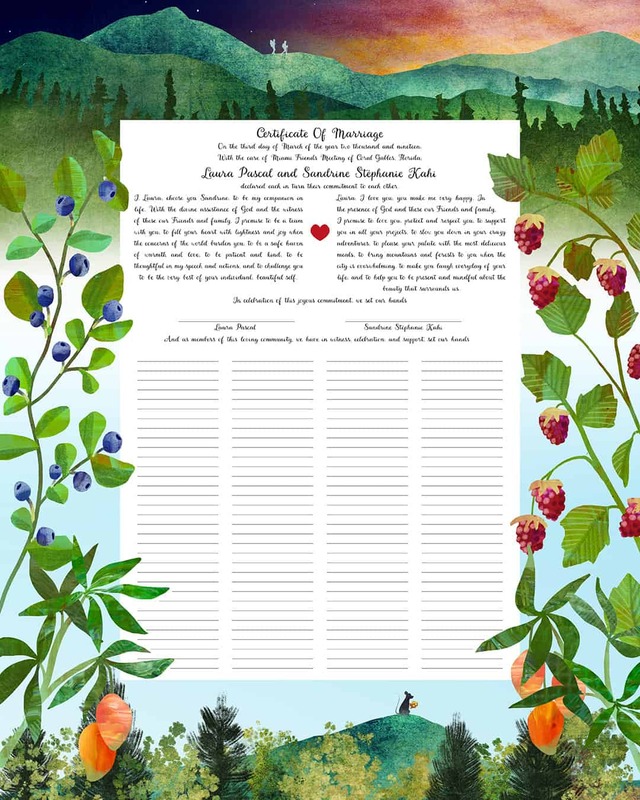 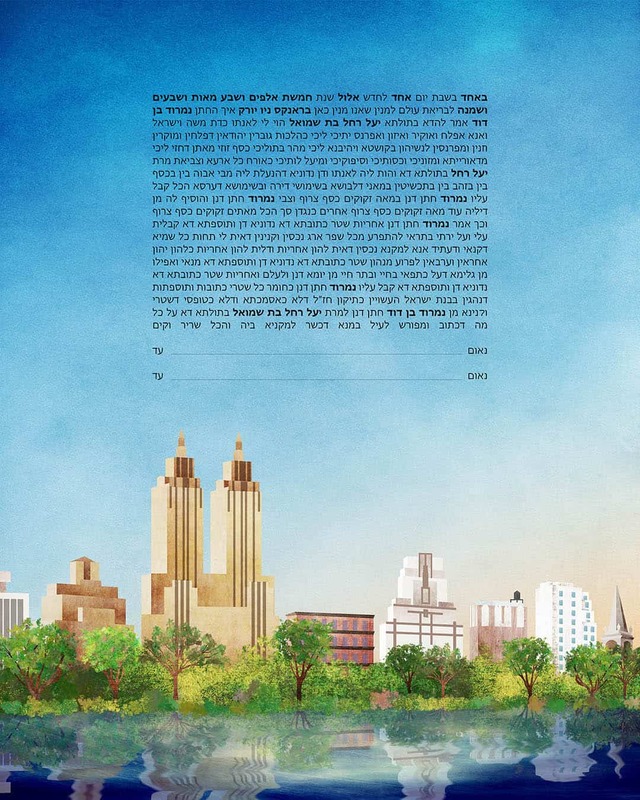 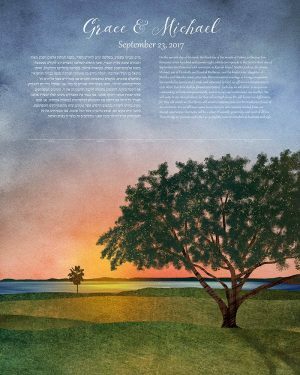 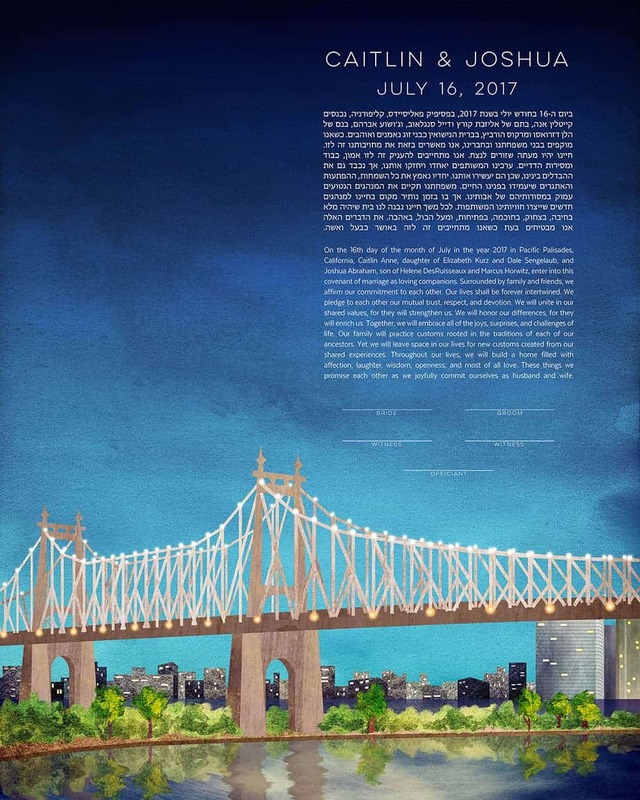 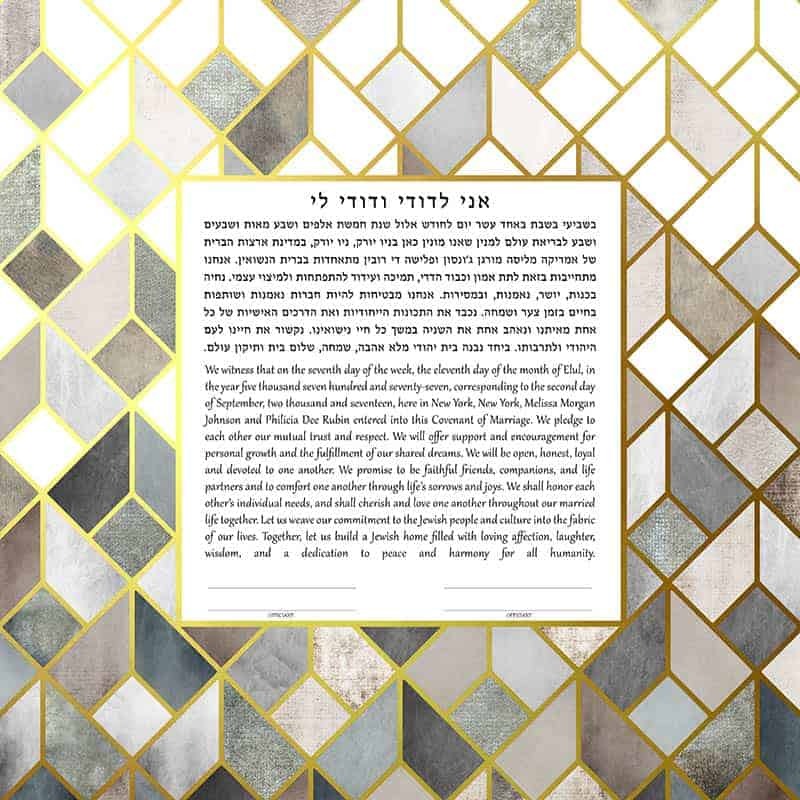 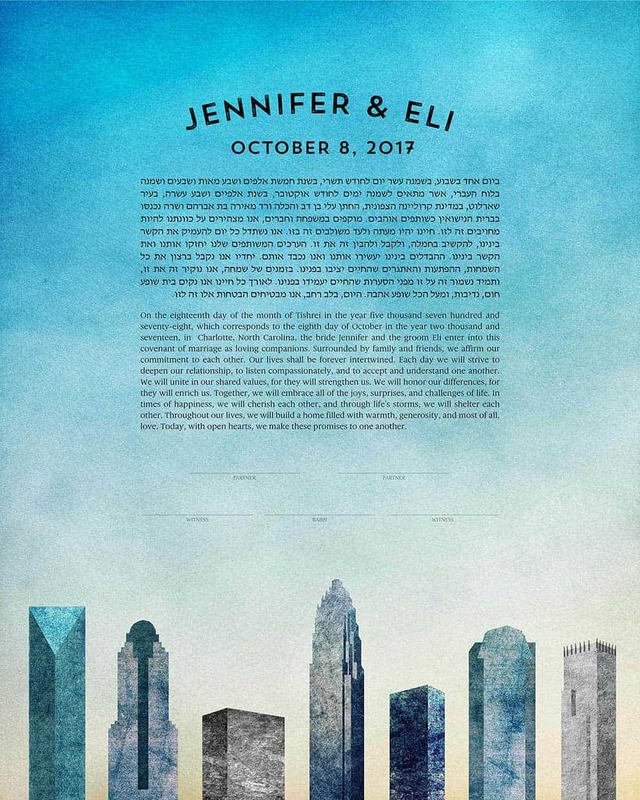 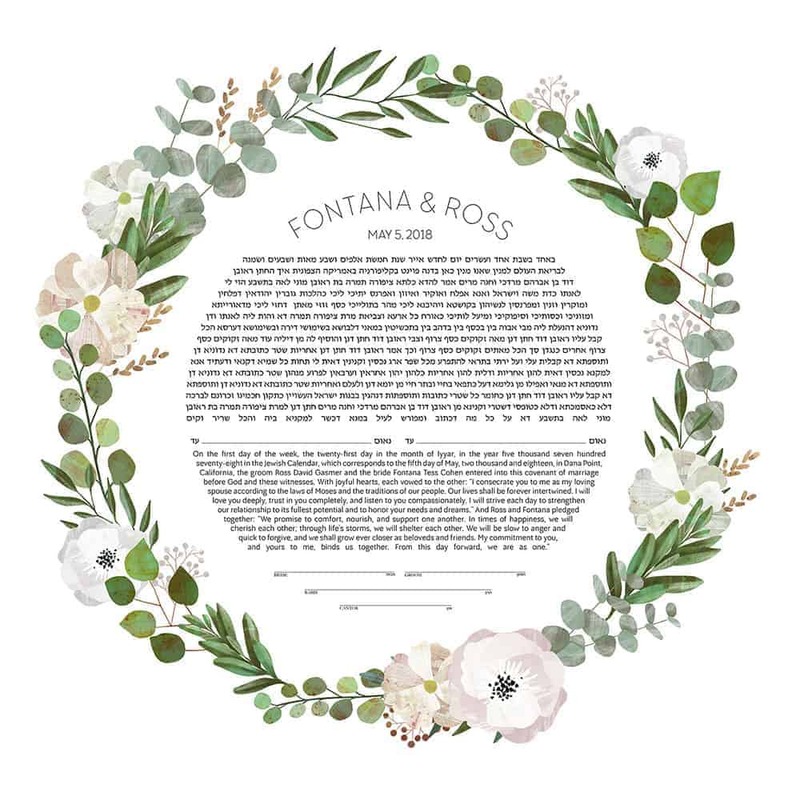 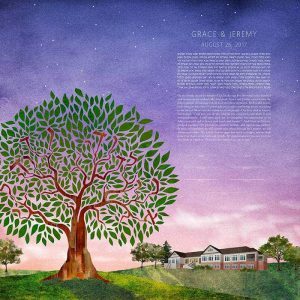 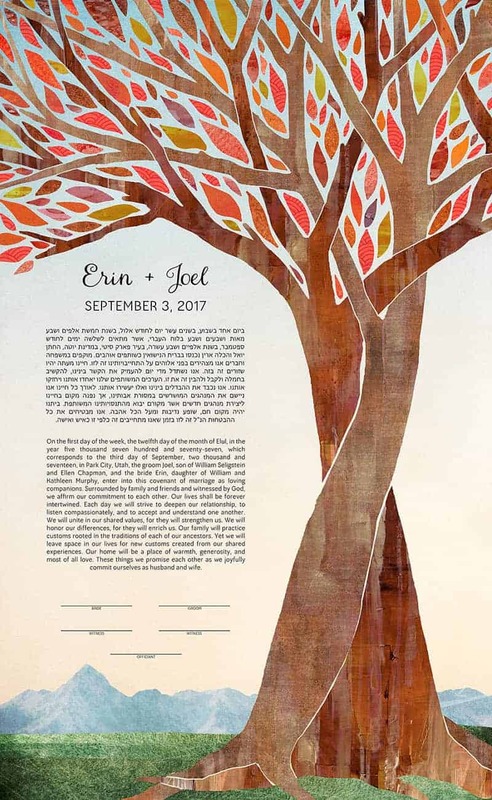 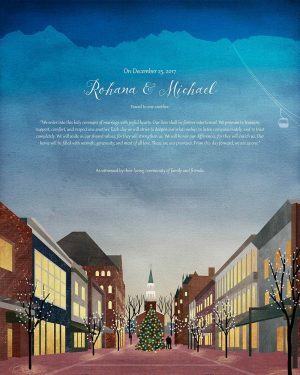 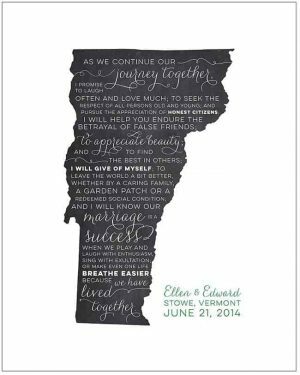 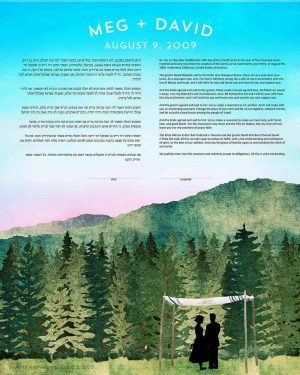 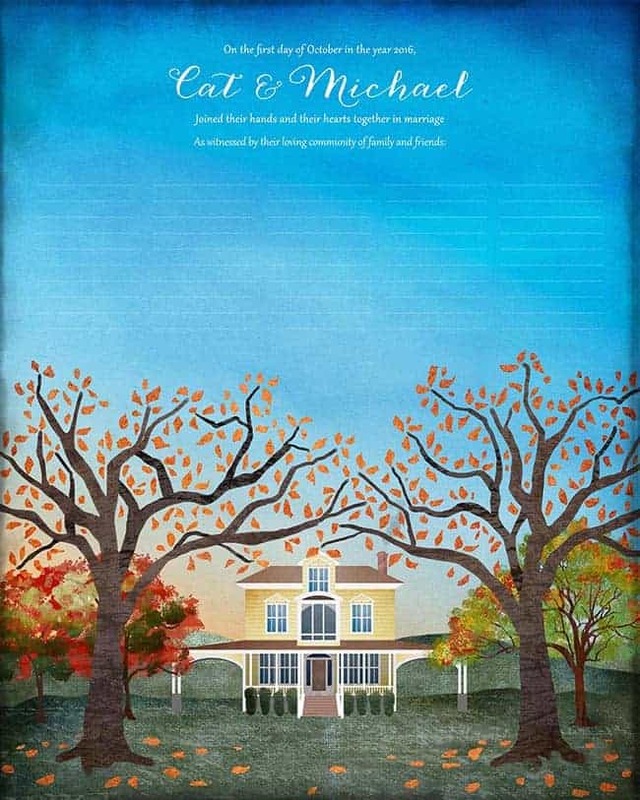 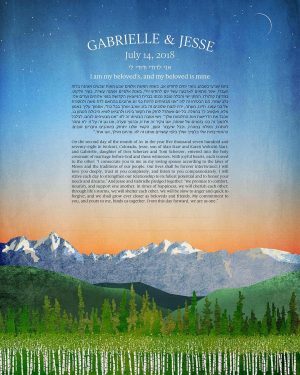 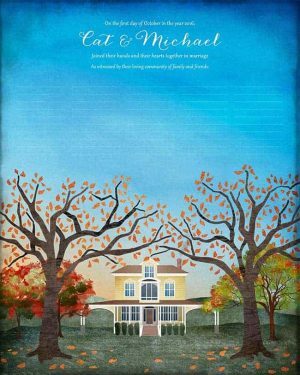 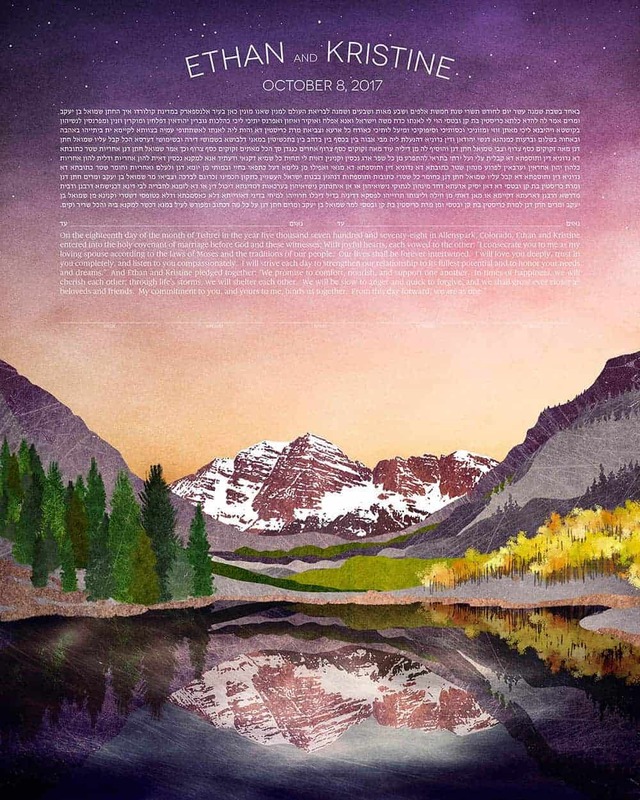 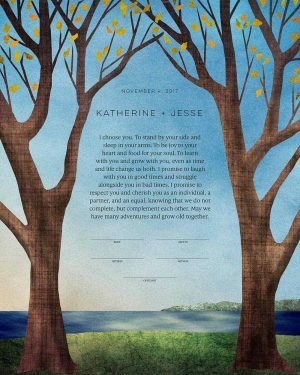 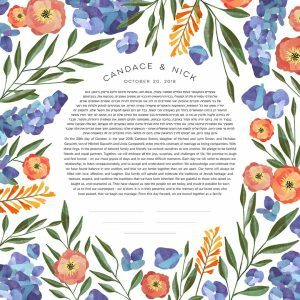 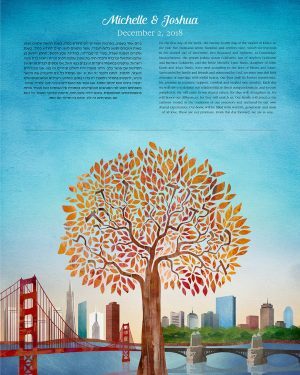 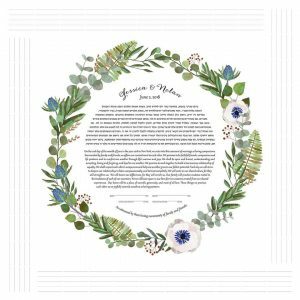 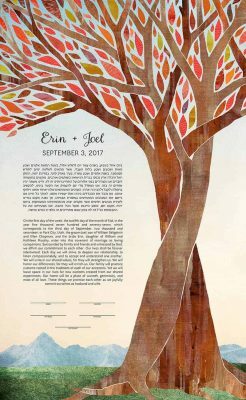 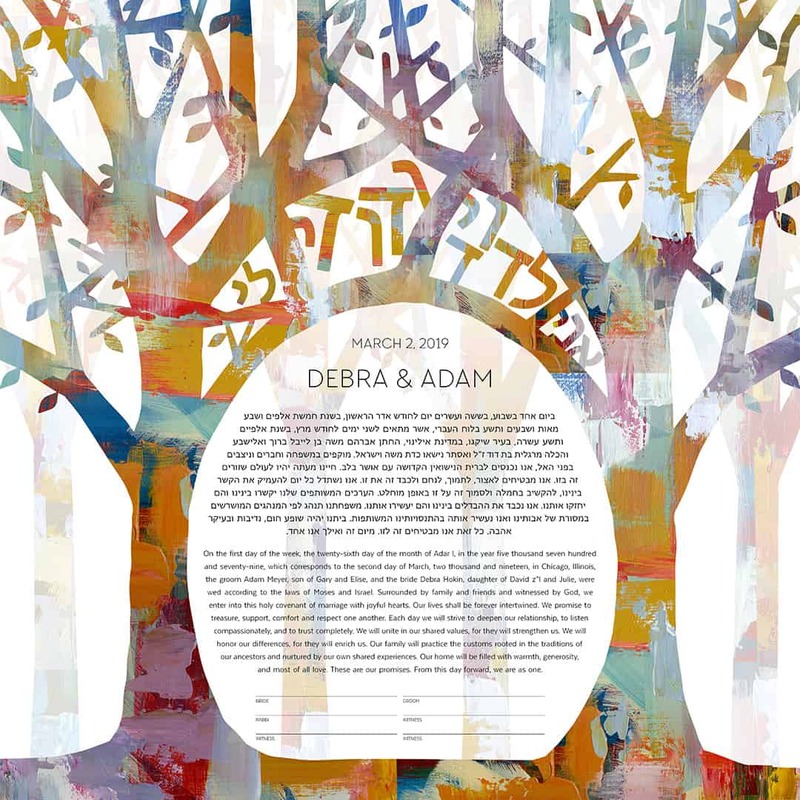 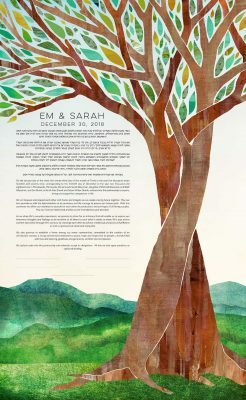 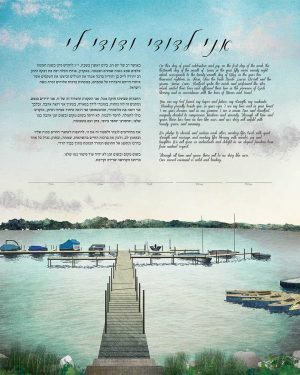 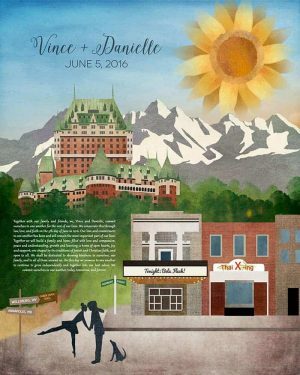 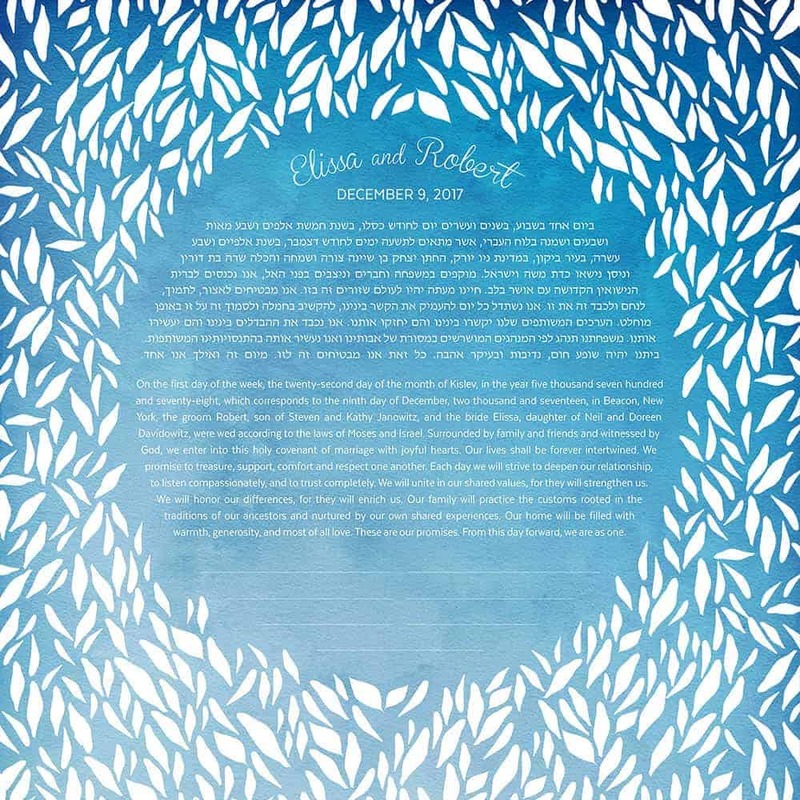 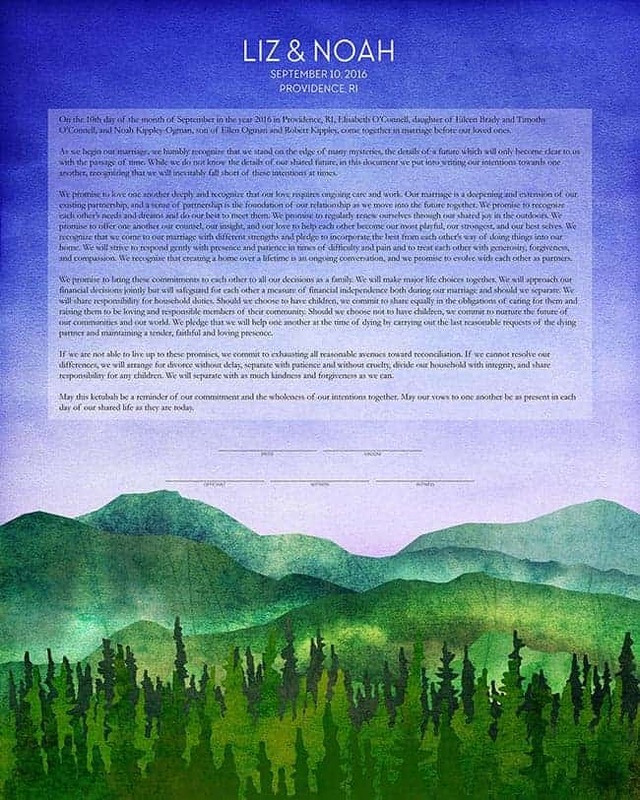 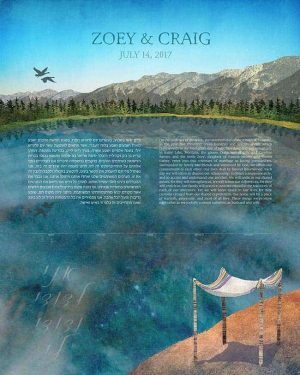 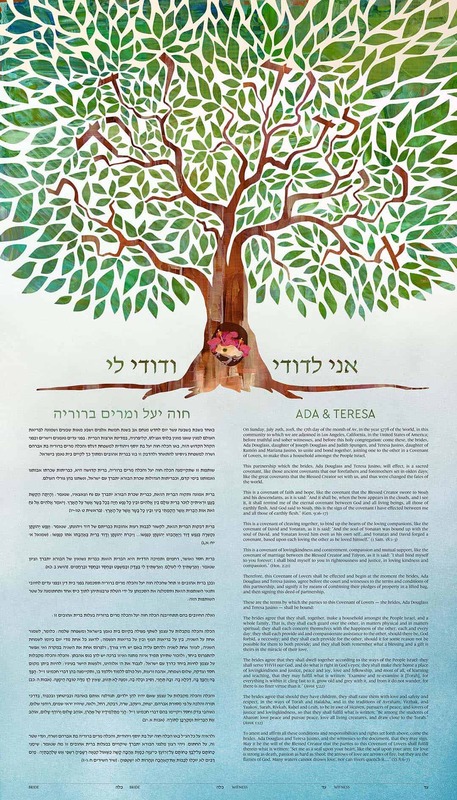 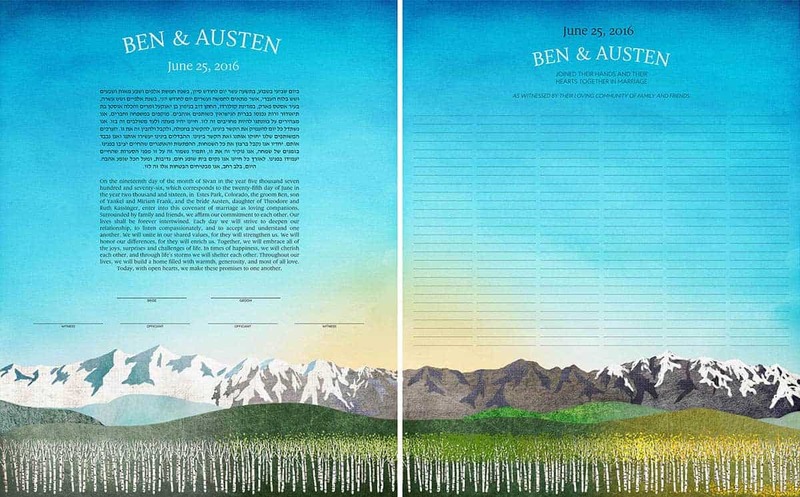 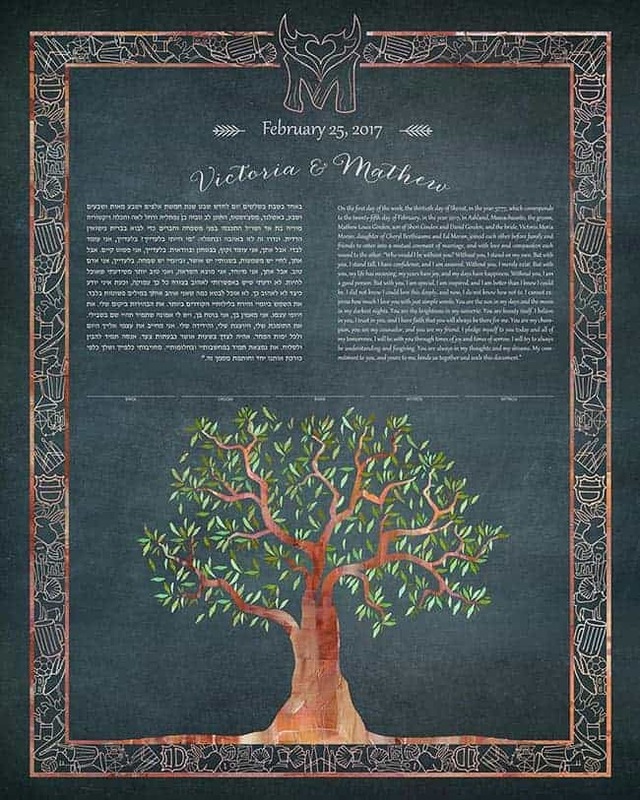 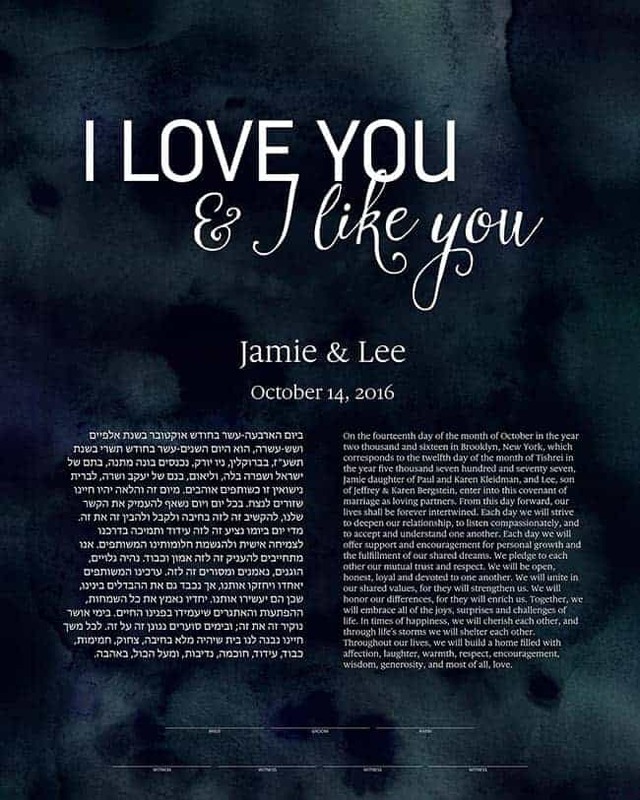 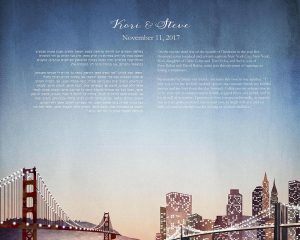 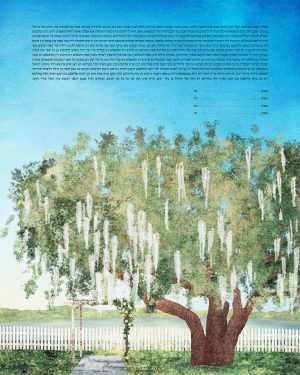 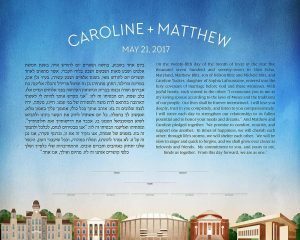 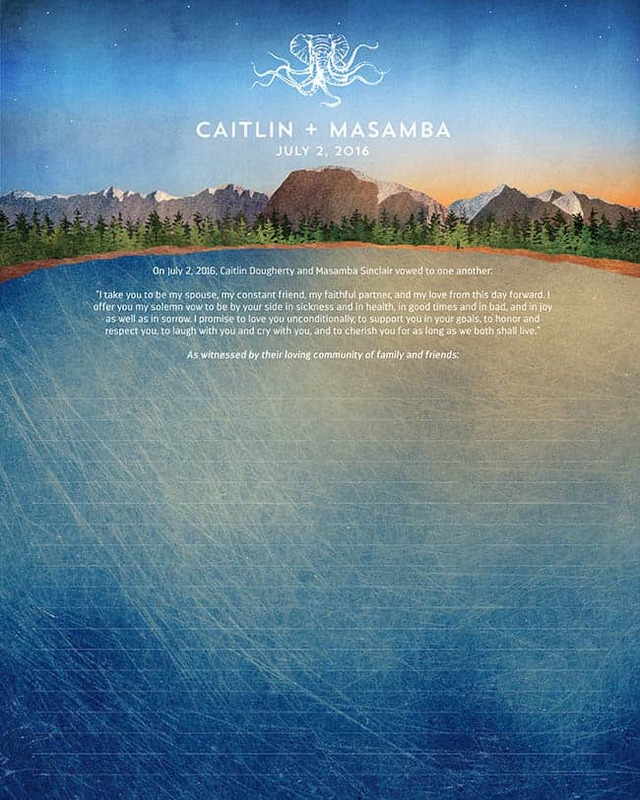 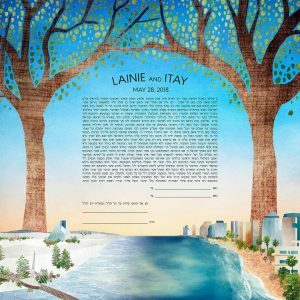 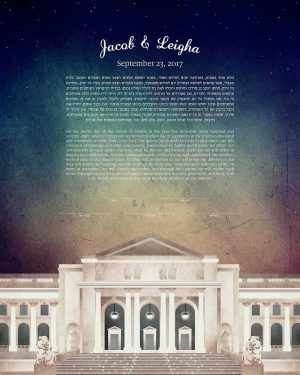 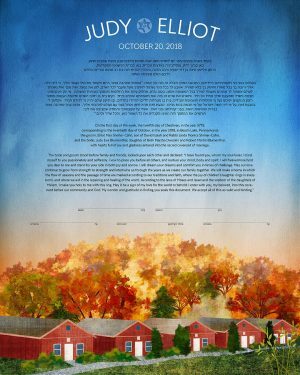 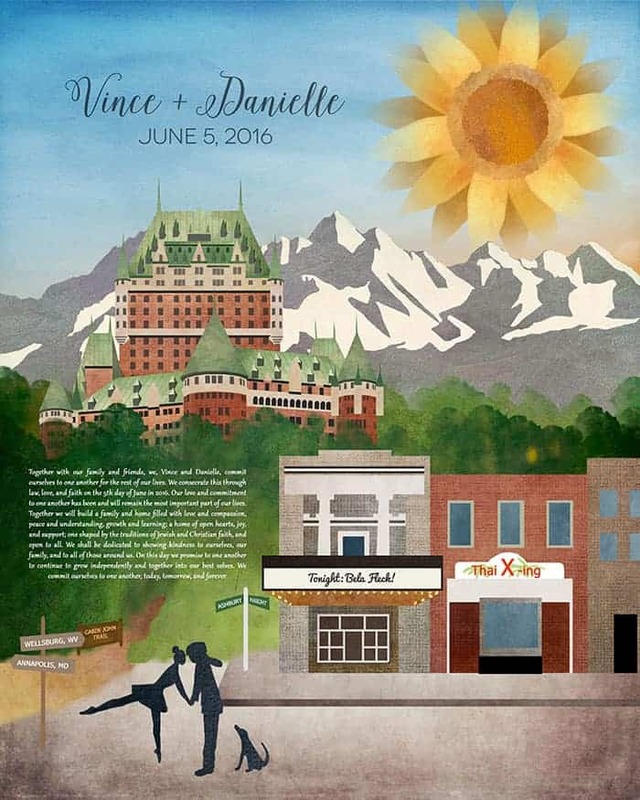 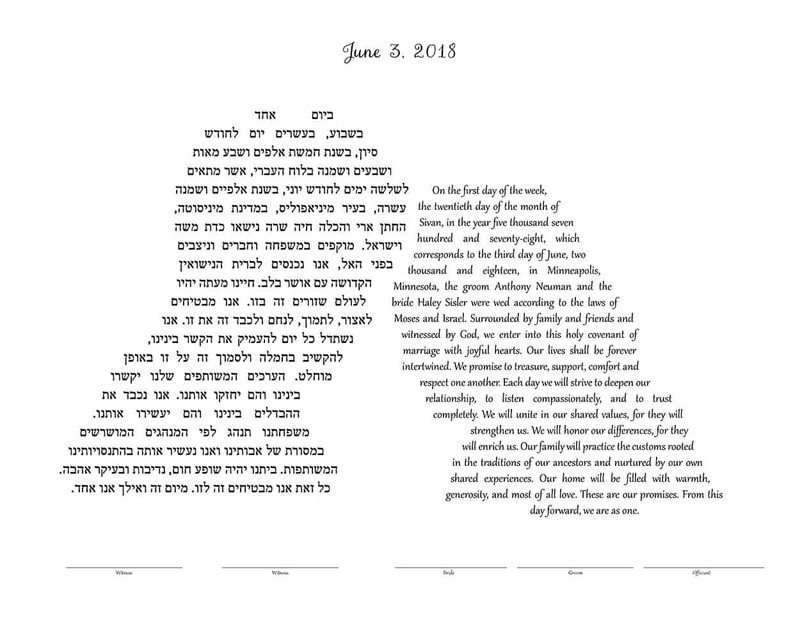 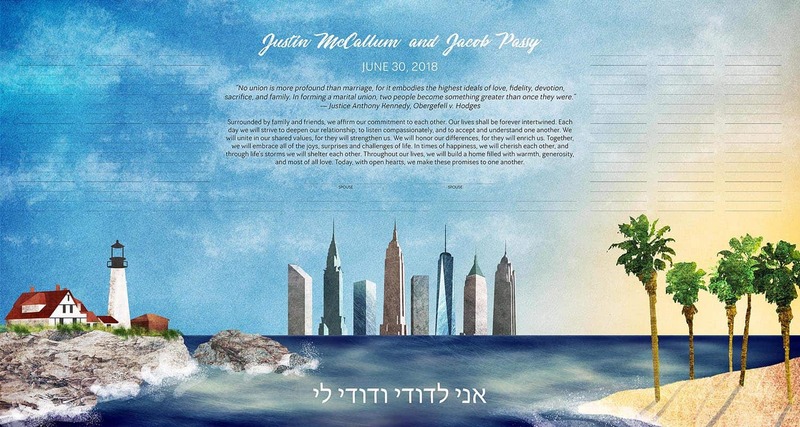 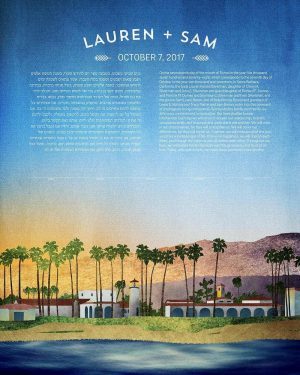 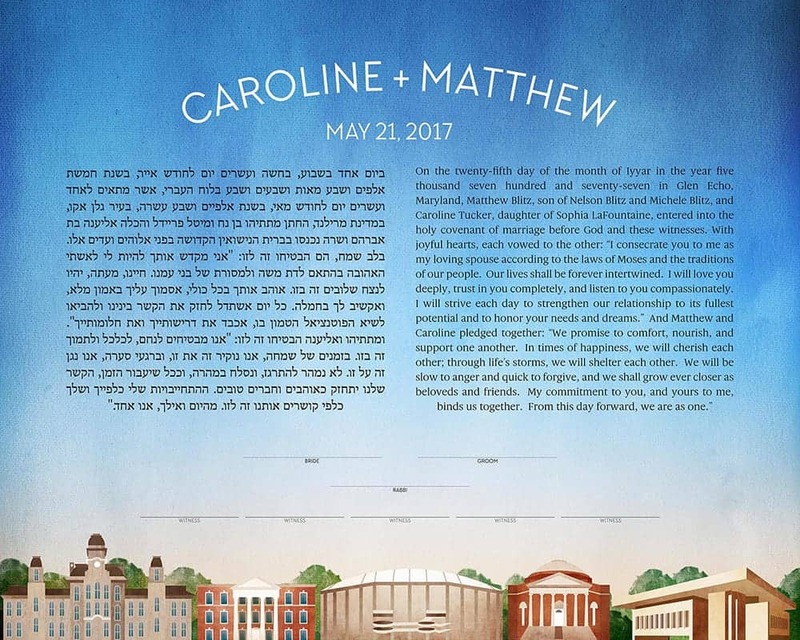 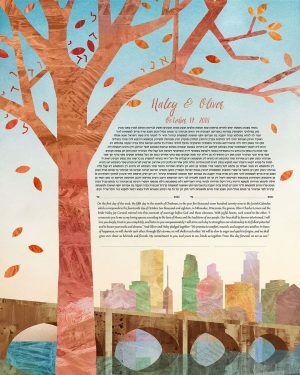 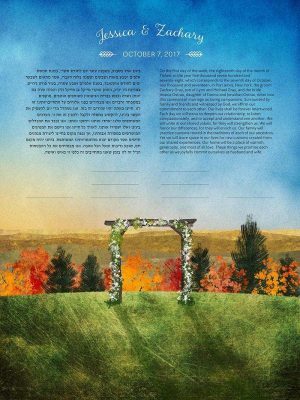 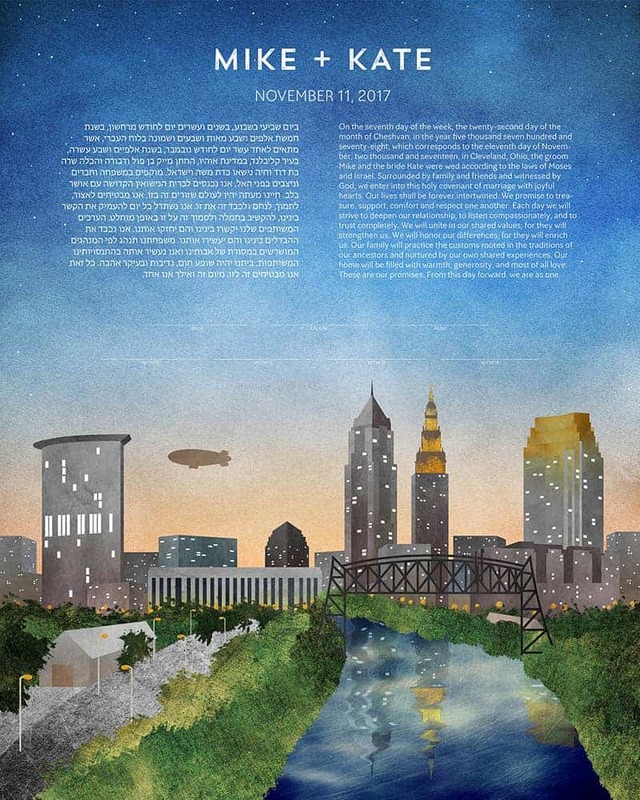 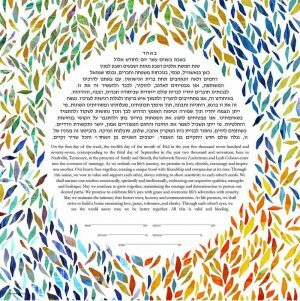 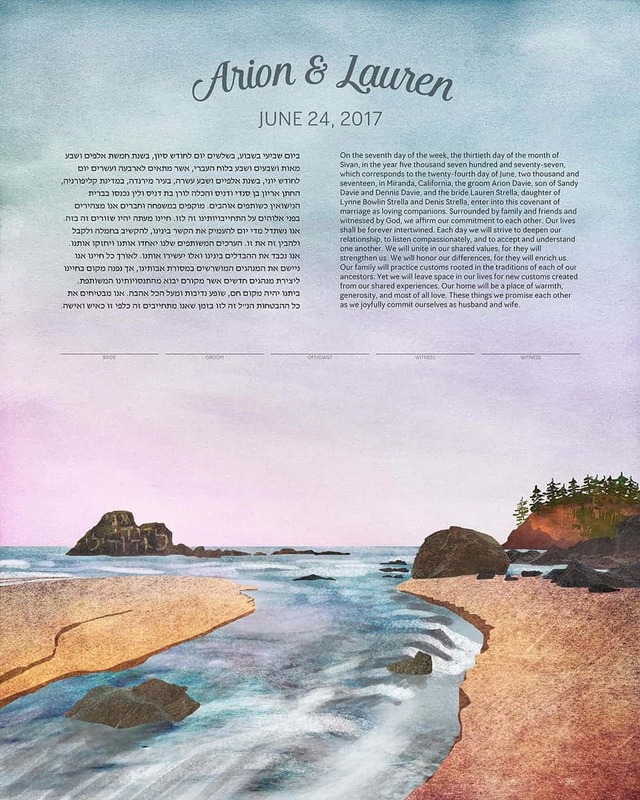 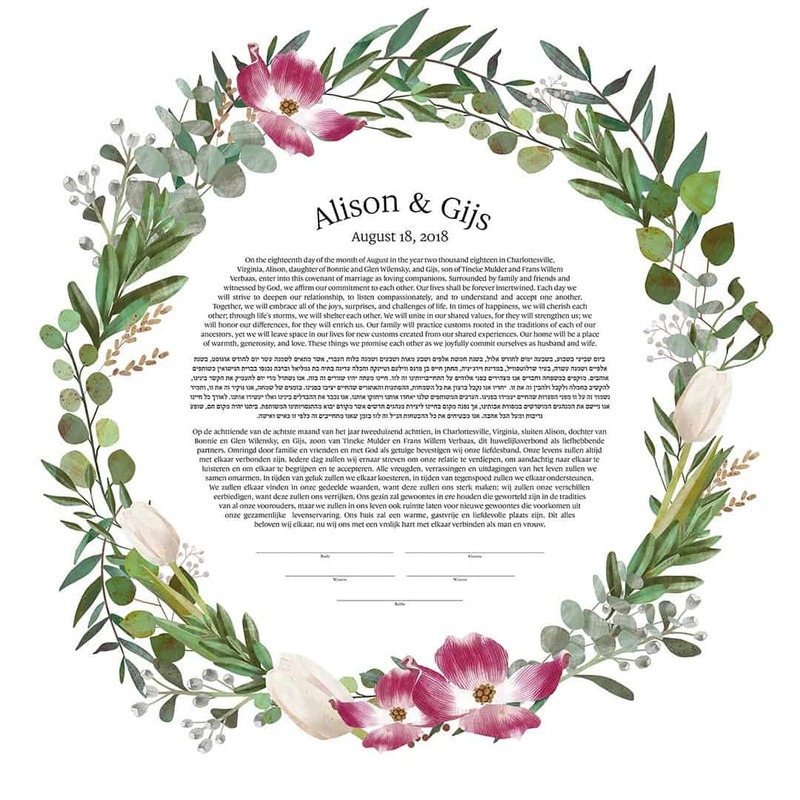 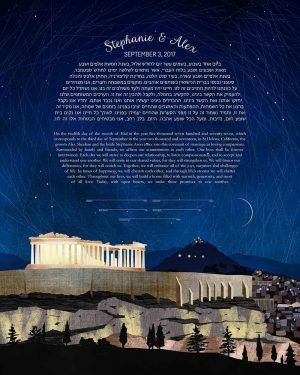 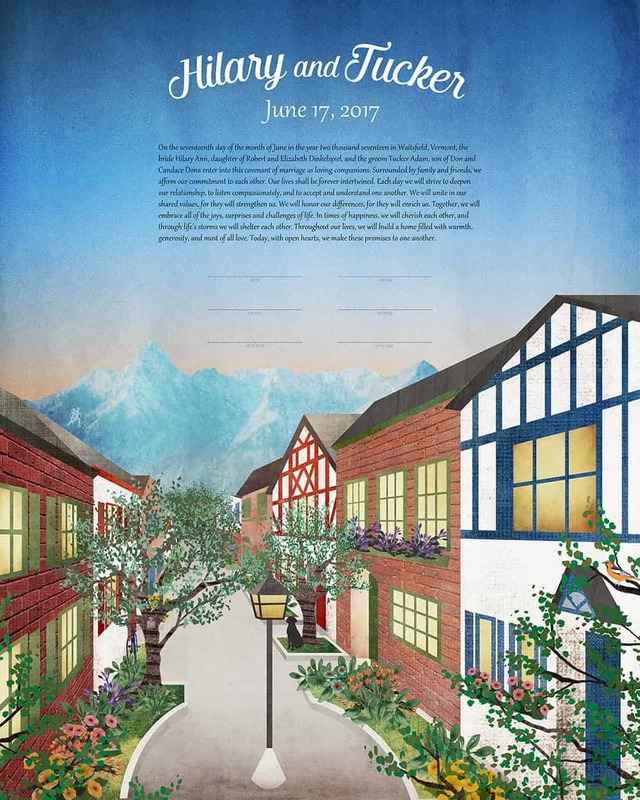 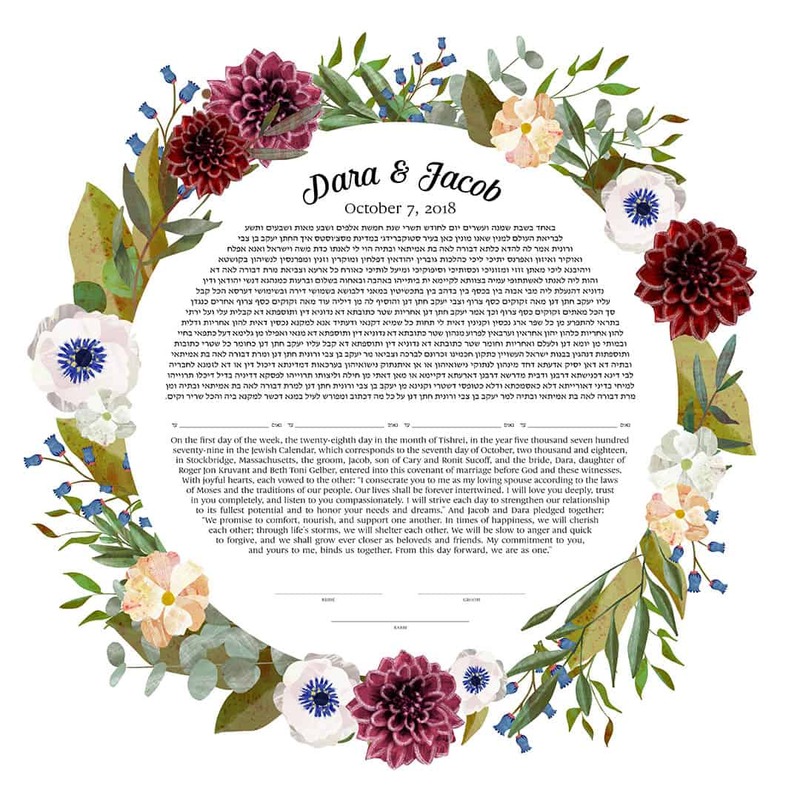 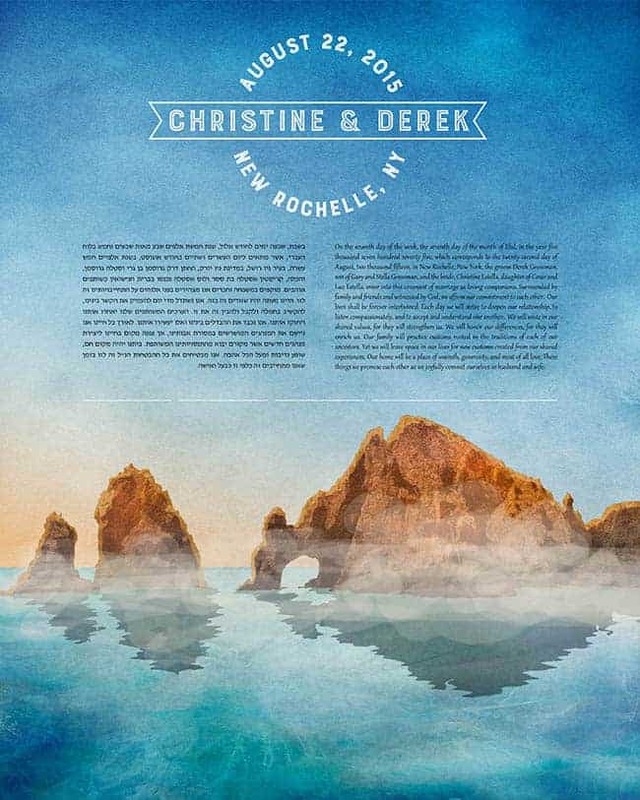 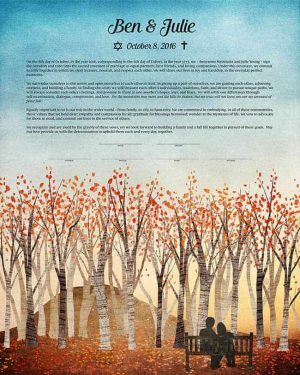 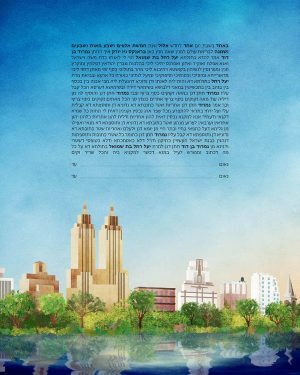 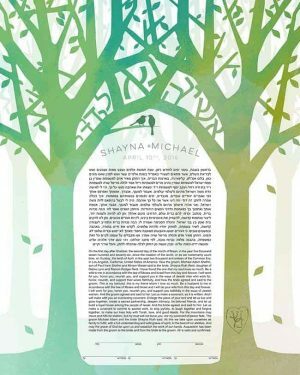 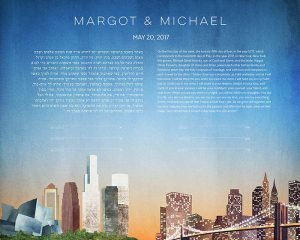 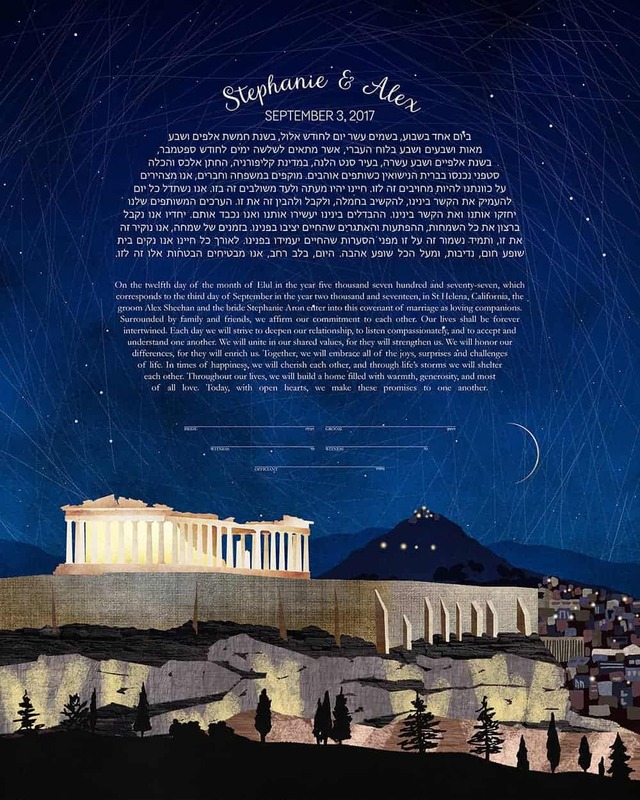 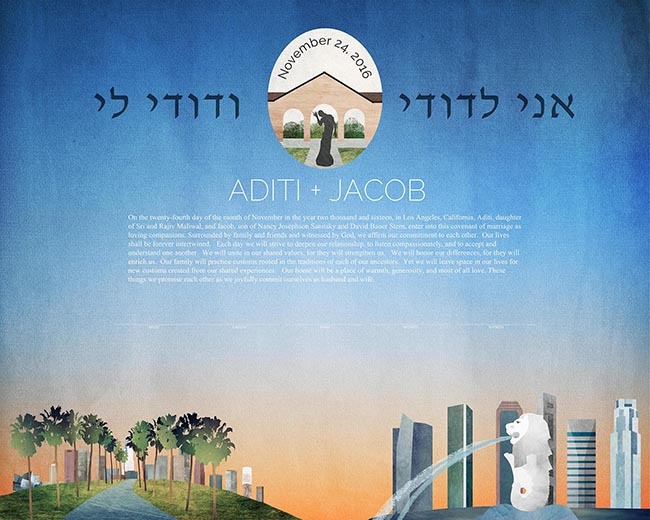 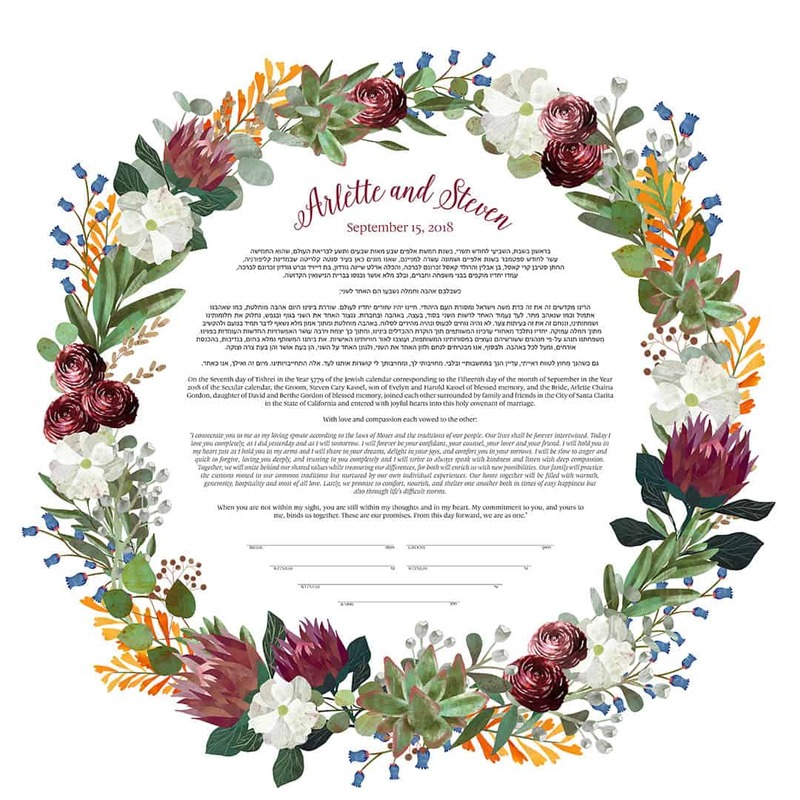 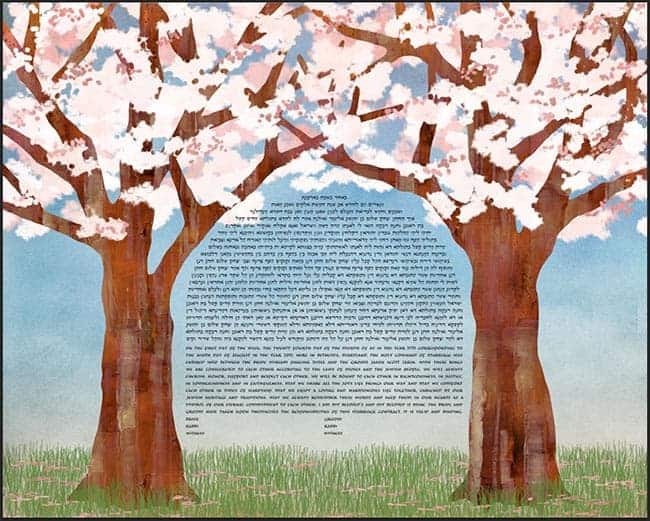 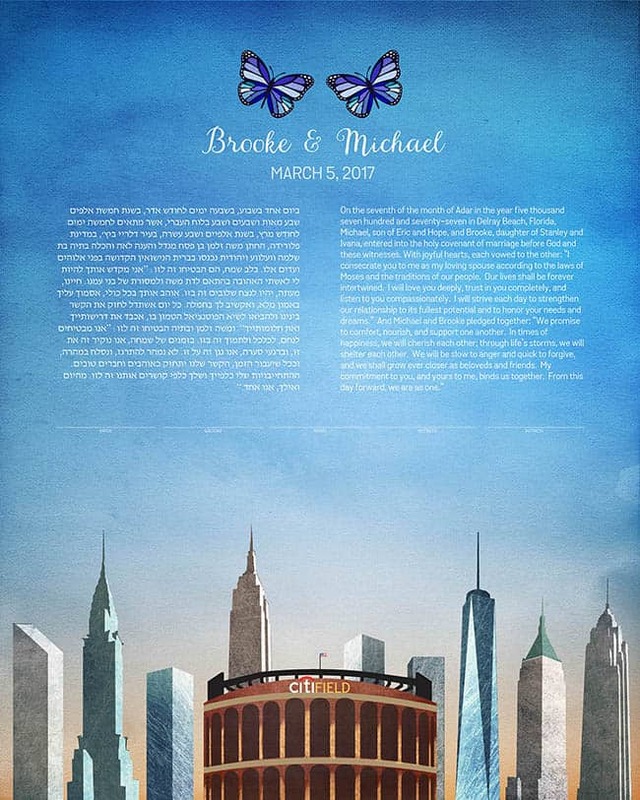 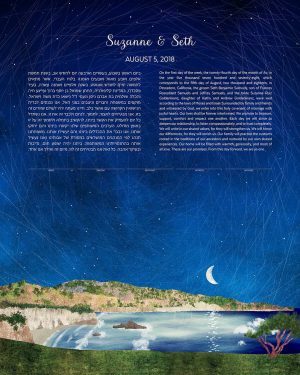 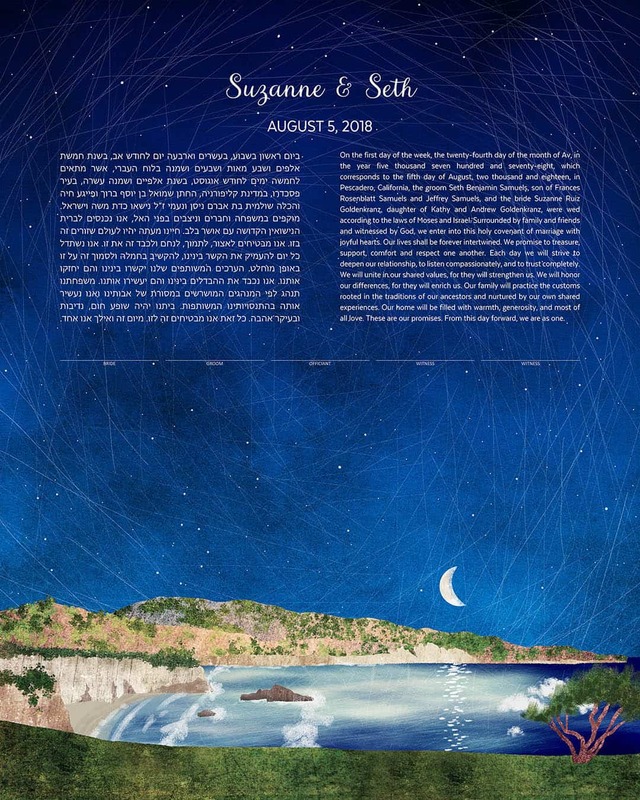 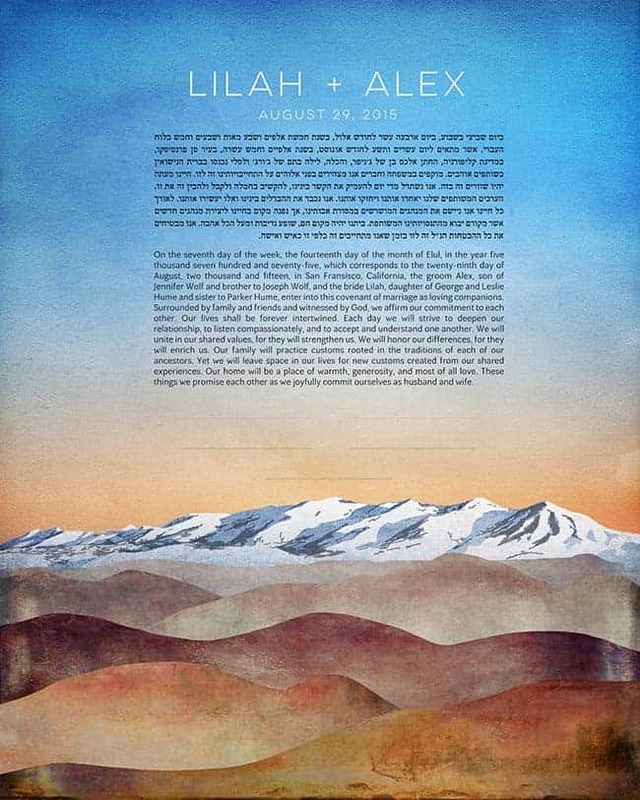 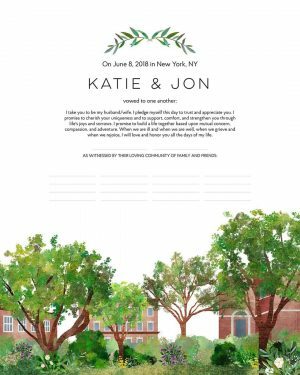 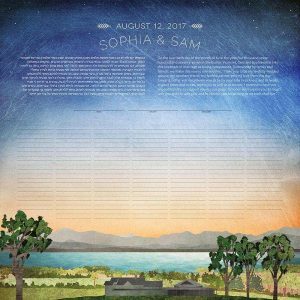 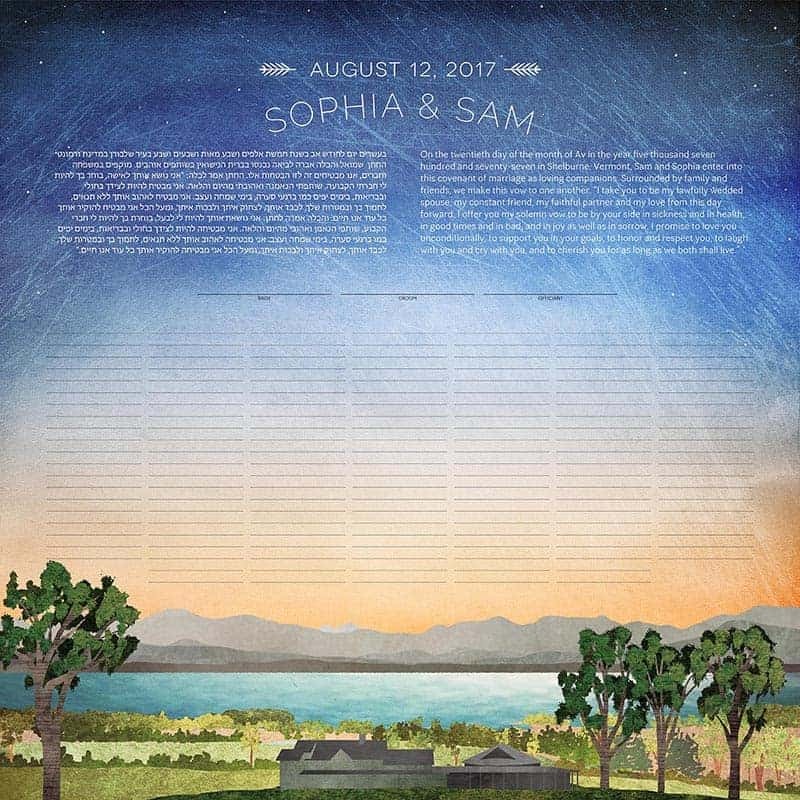 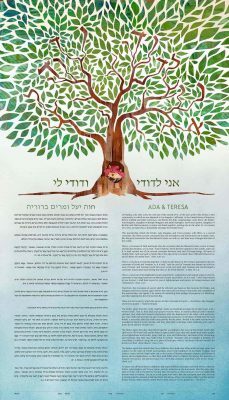 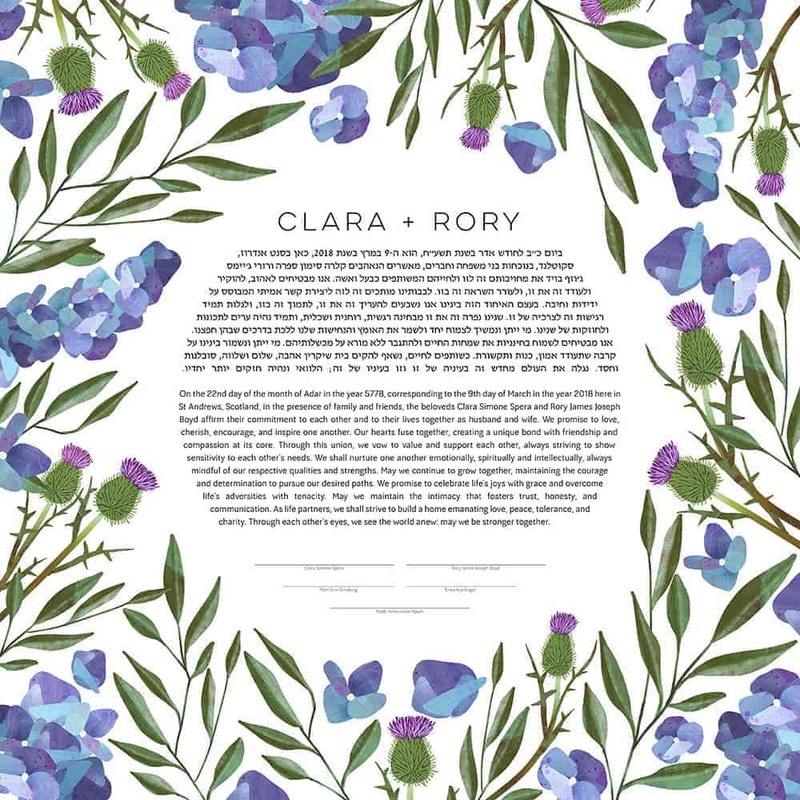 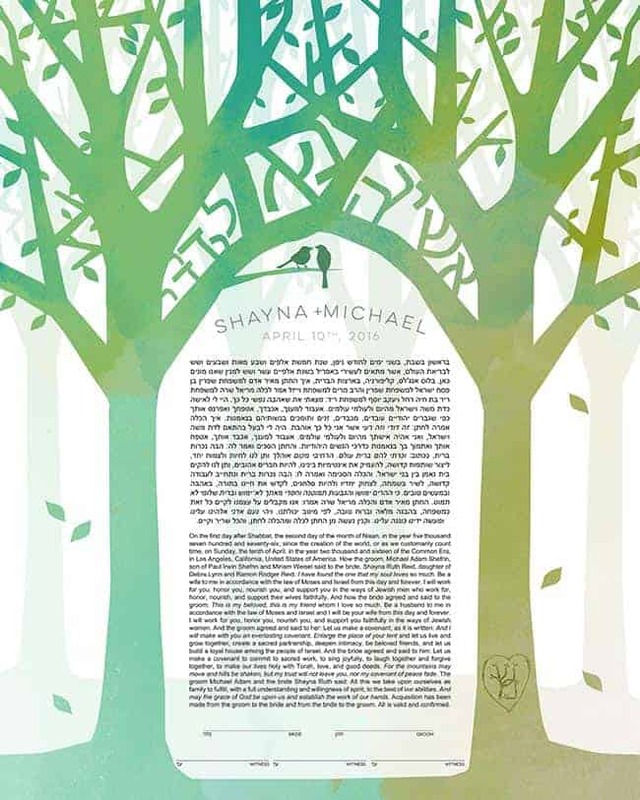 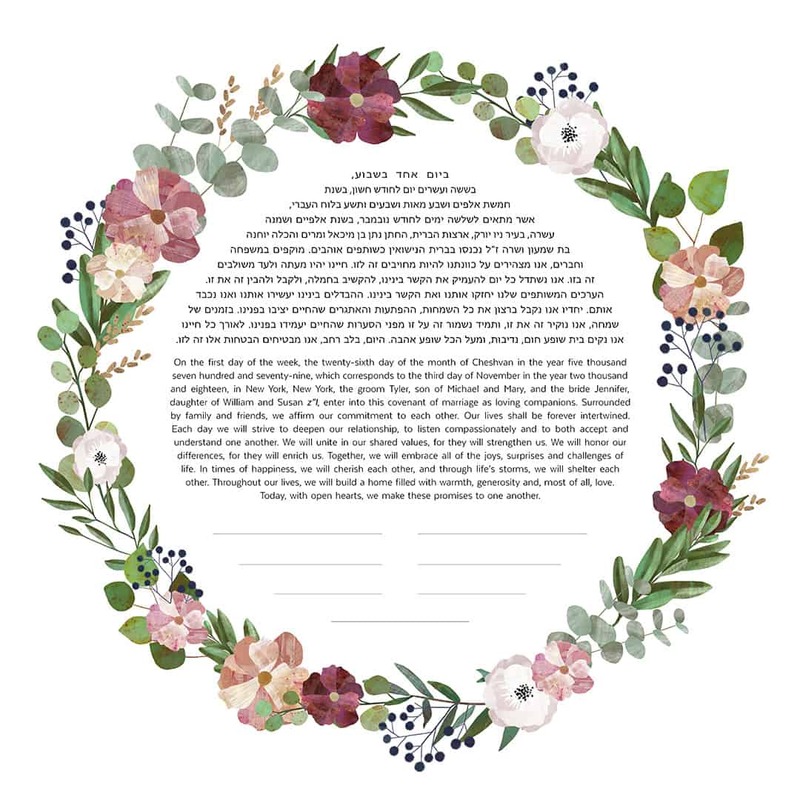 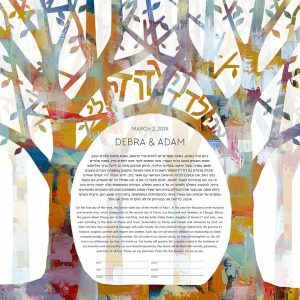 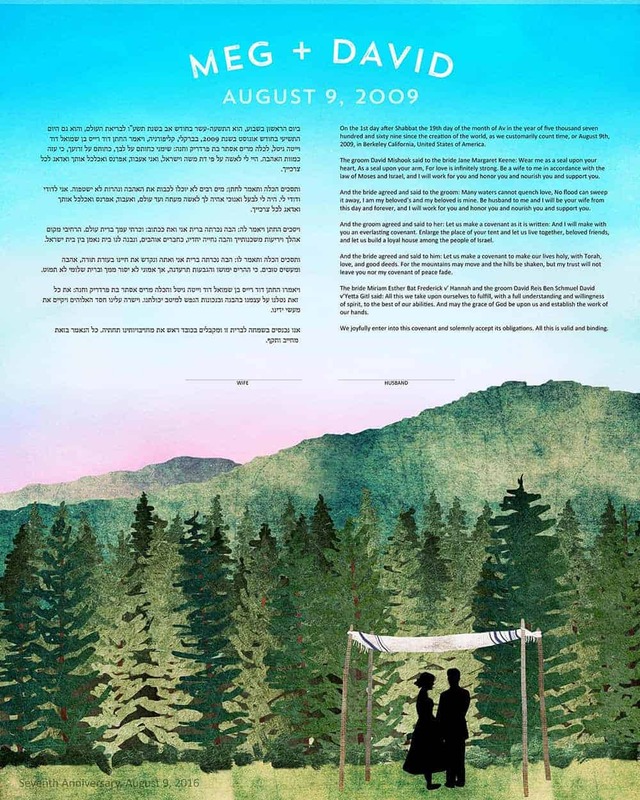 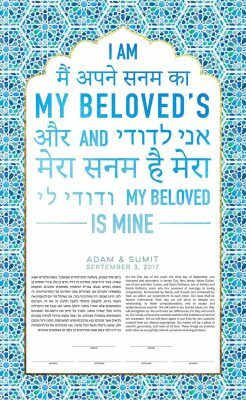 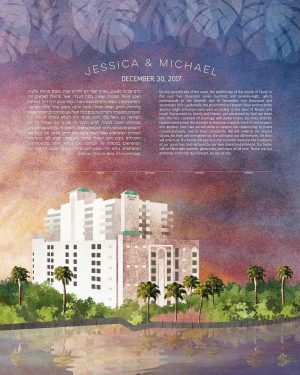 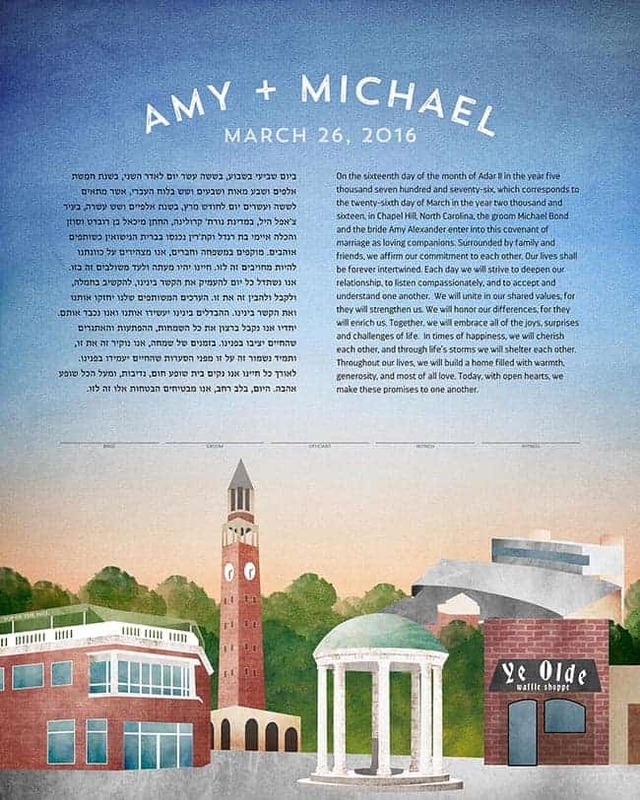 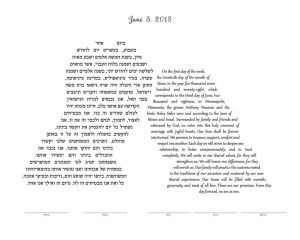 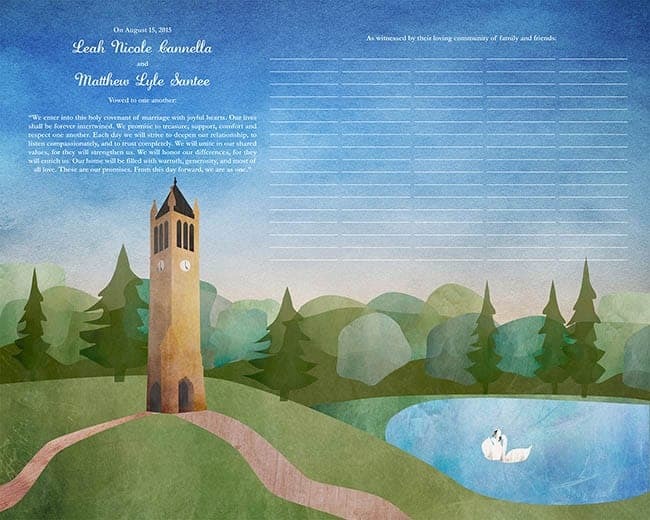 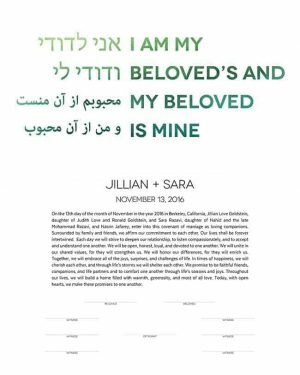 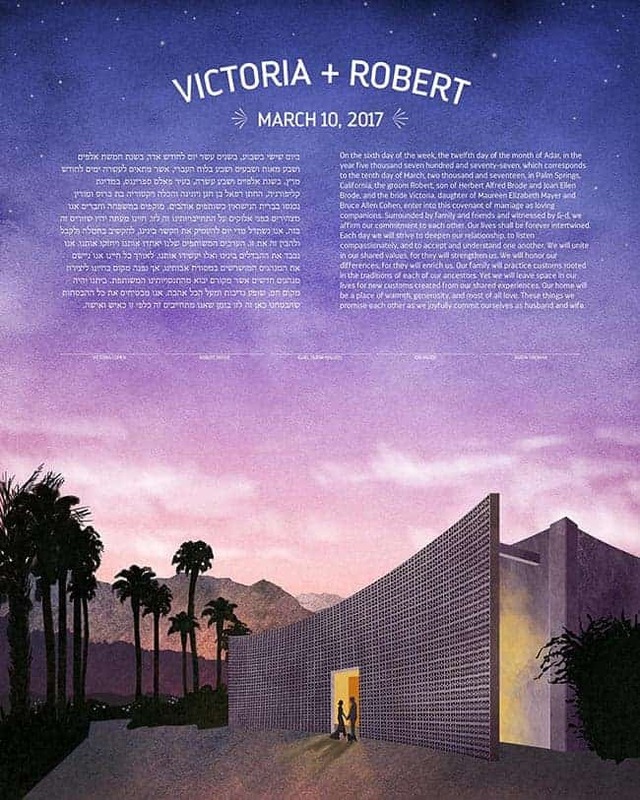 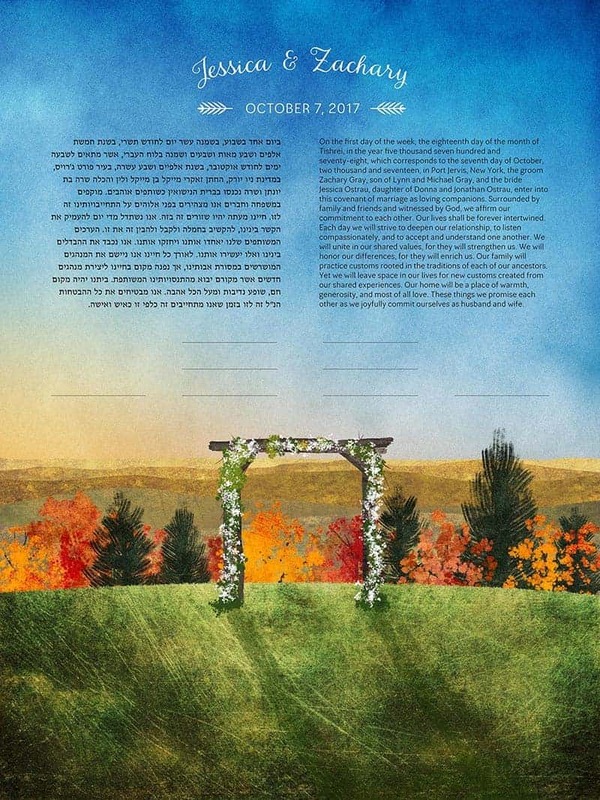 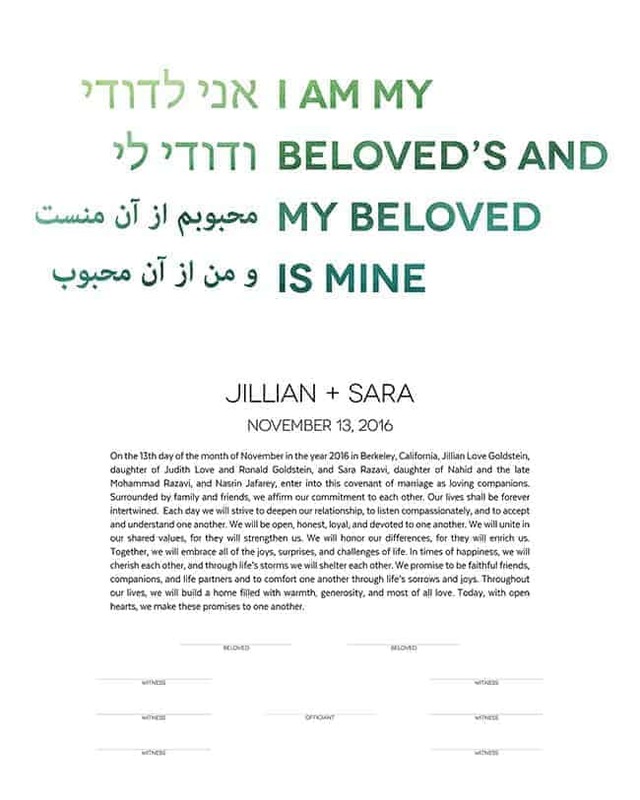 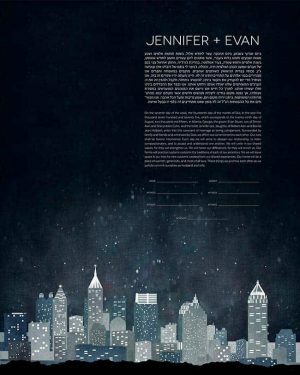 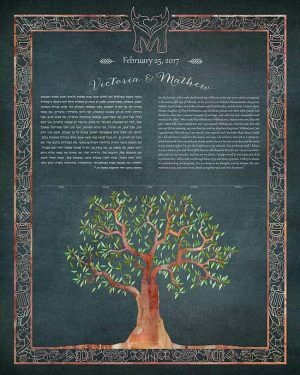 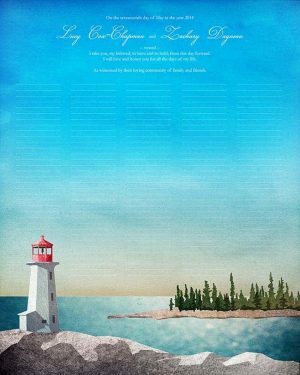 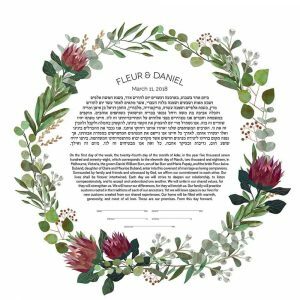 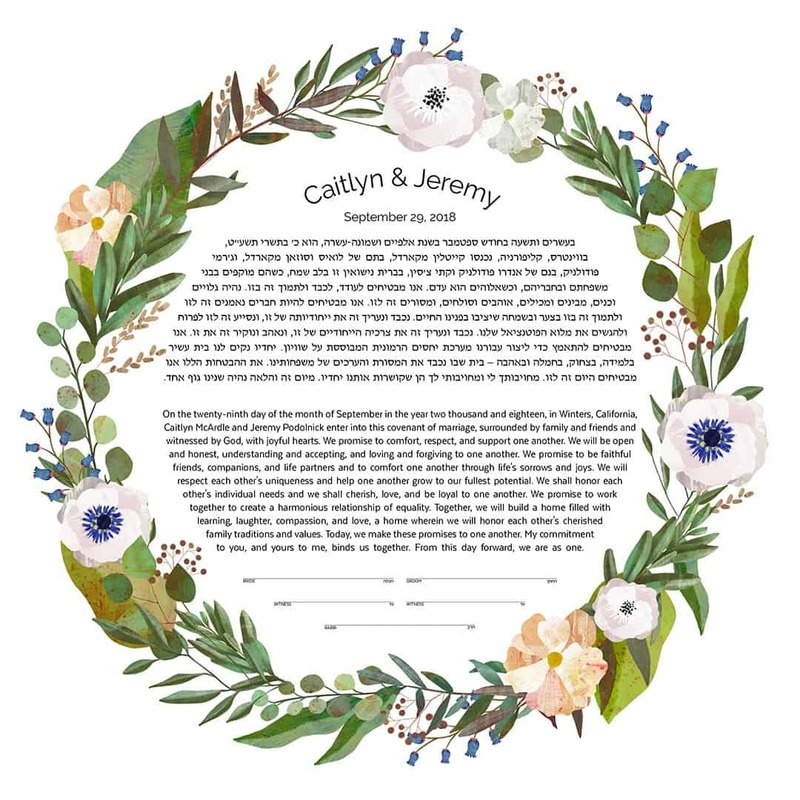 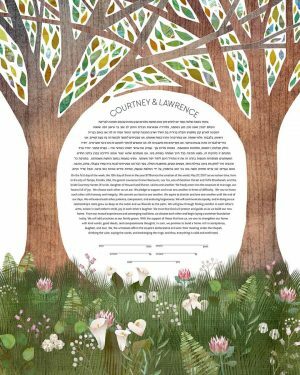 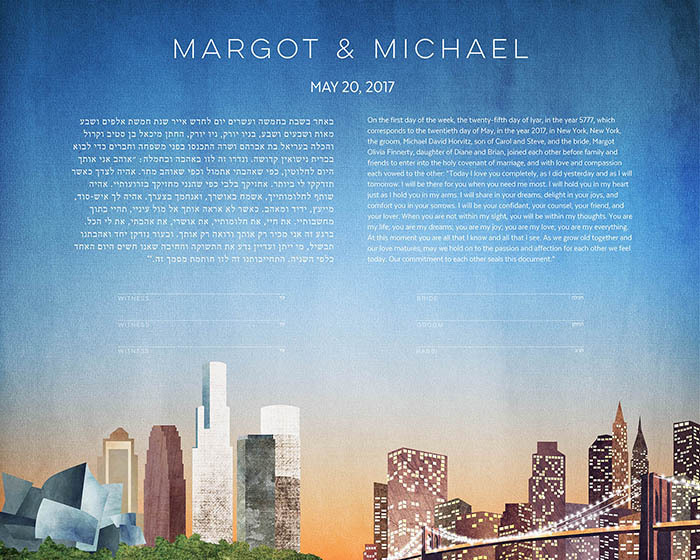 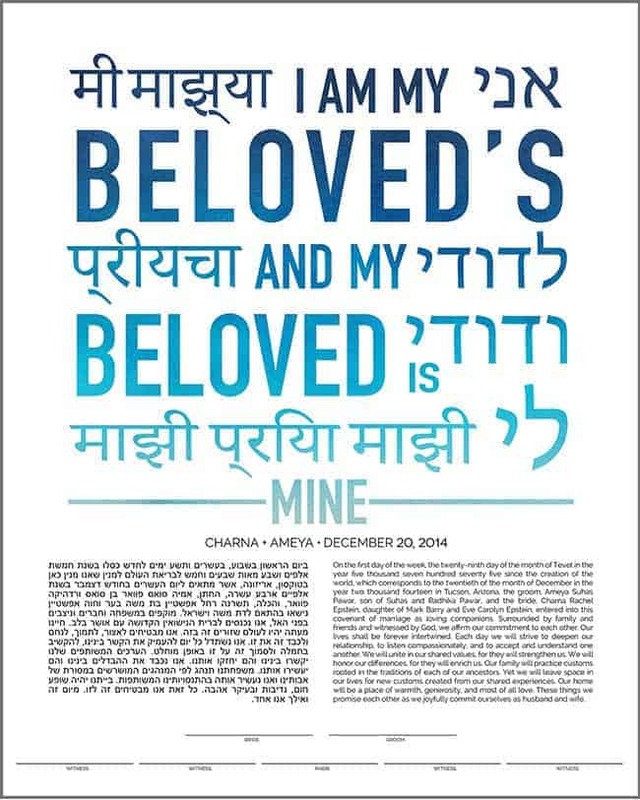 Once you're completely happy with your custom ketubah, I will have it printed and shipped to your door. 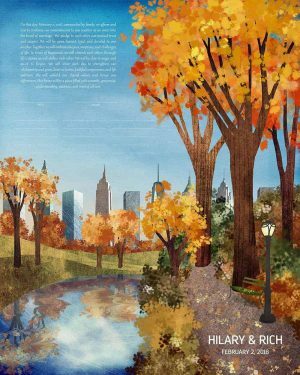 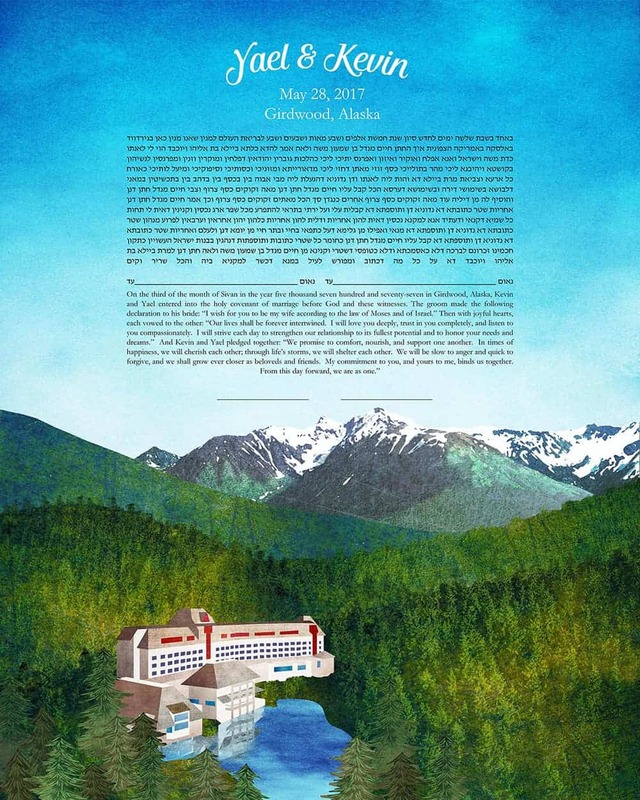 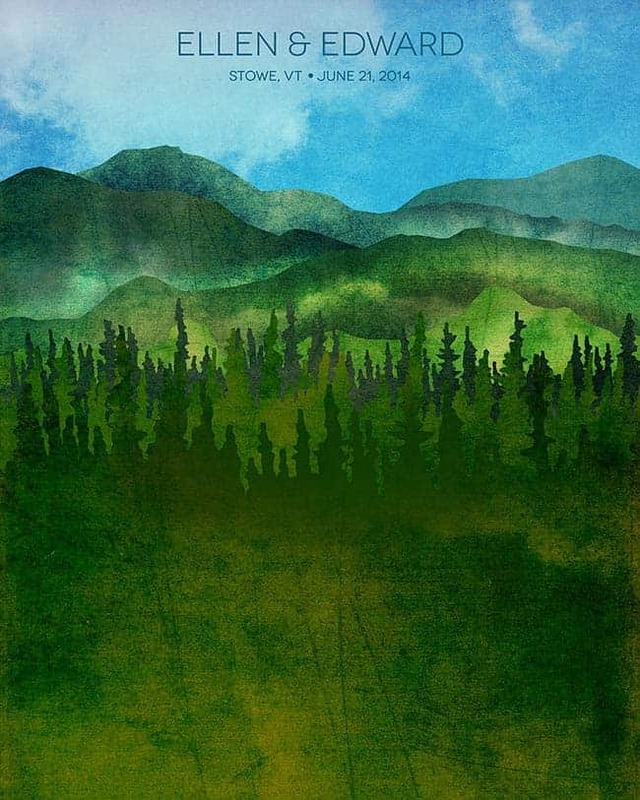 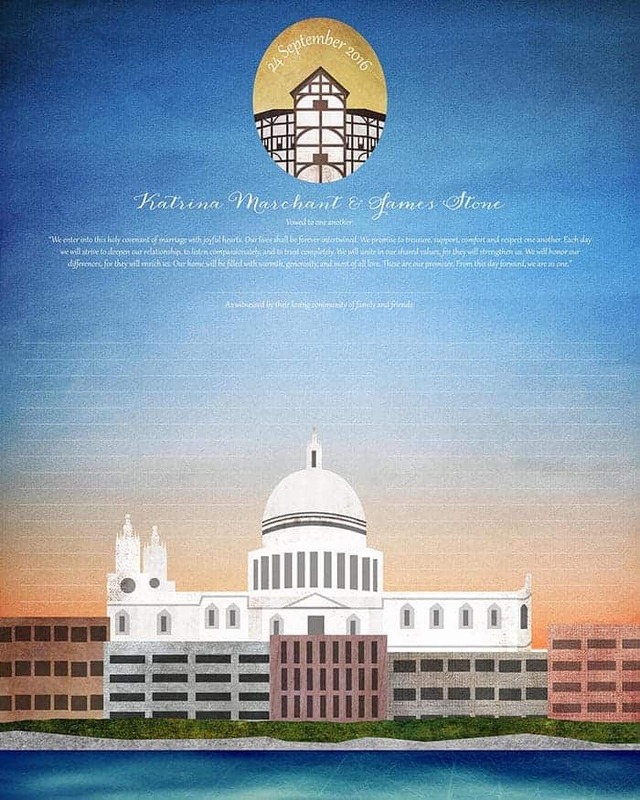 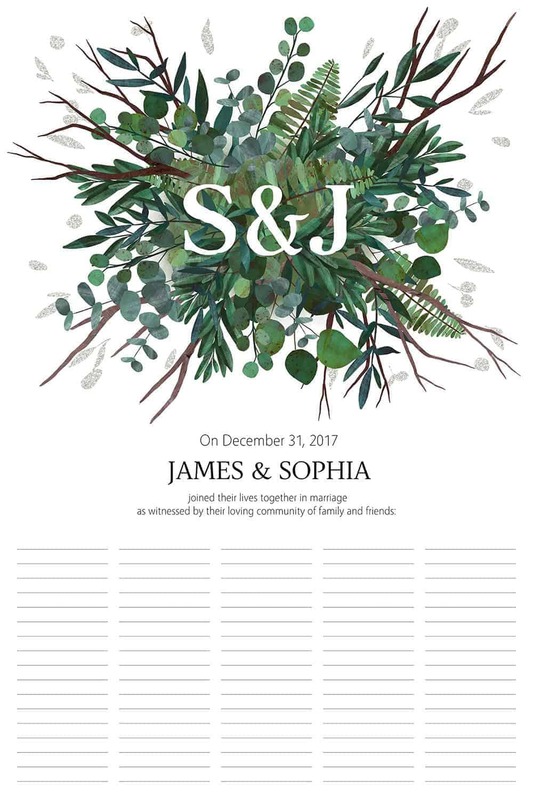 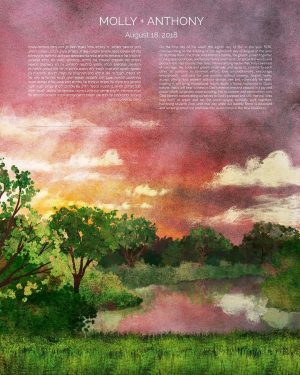 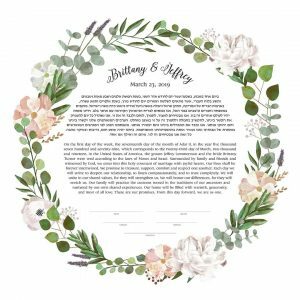 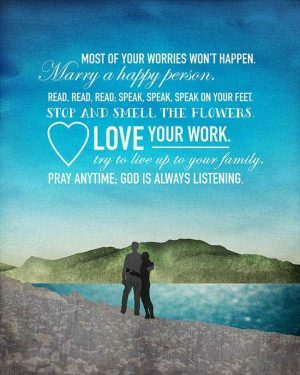 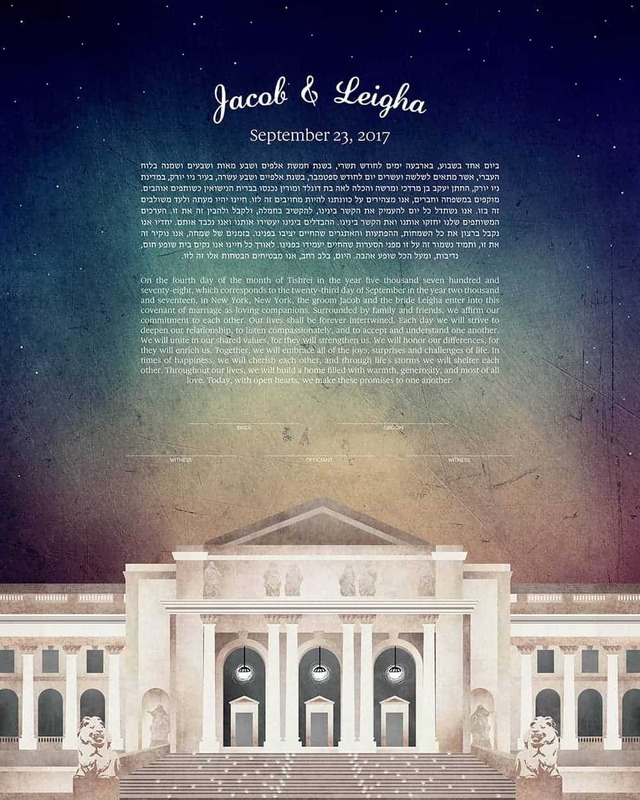 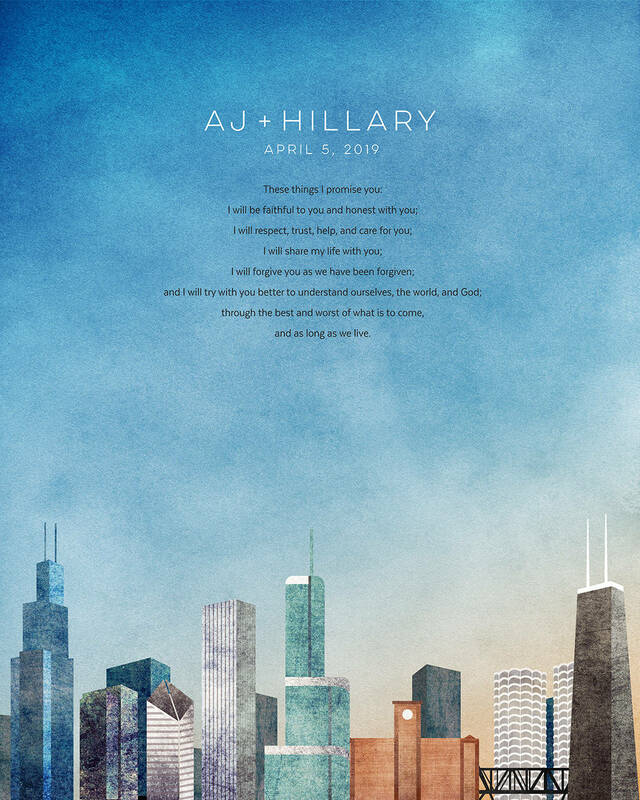 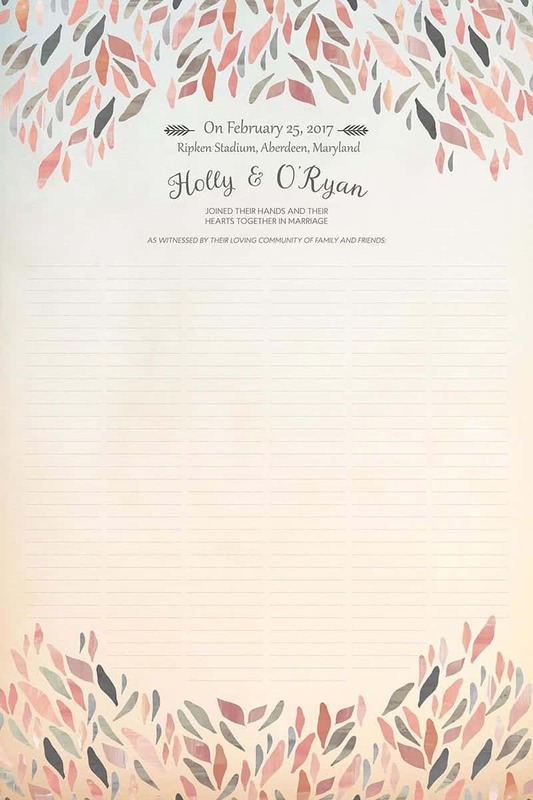 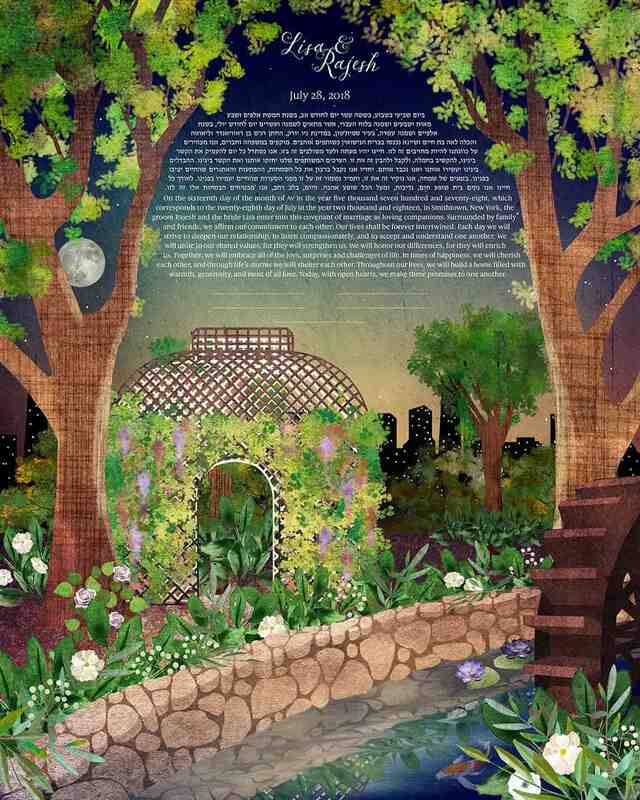 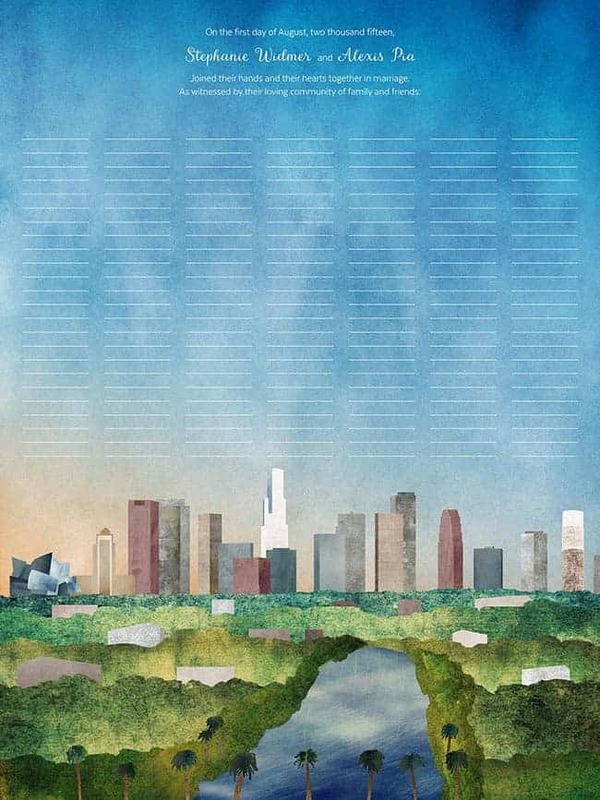 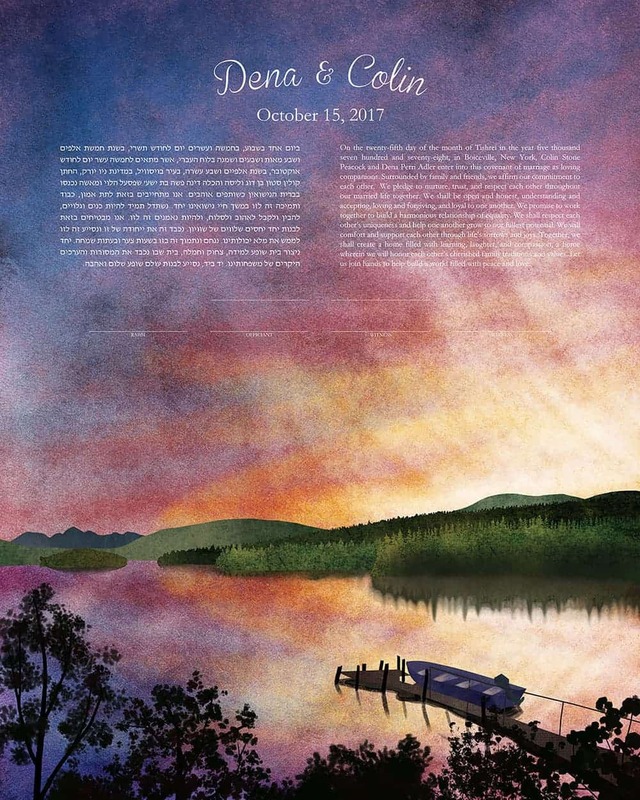 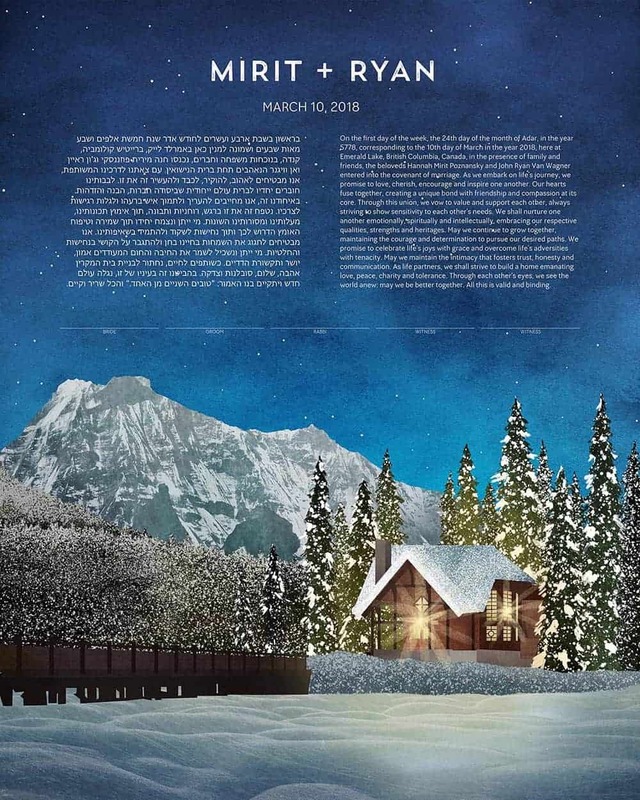 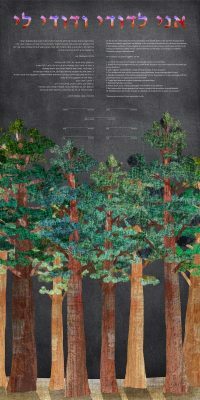 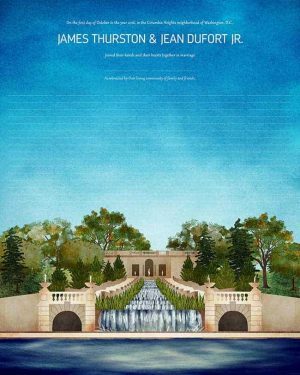 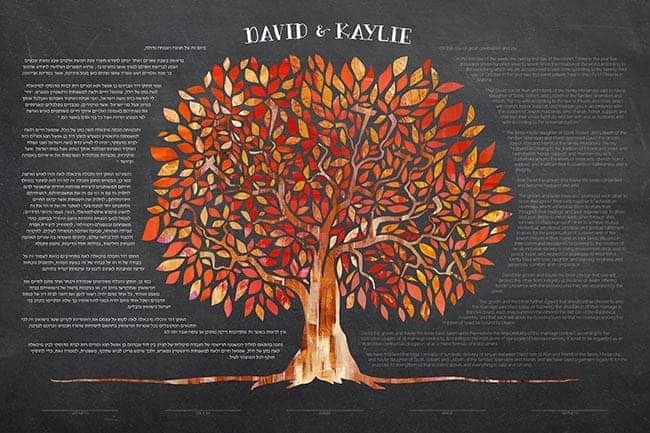 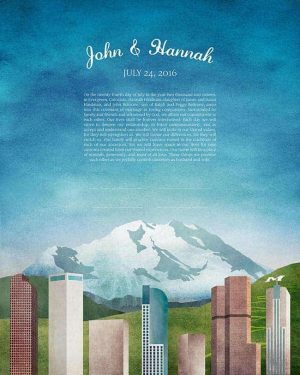 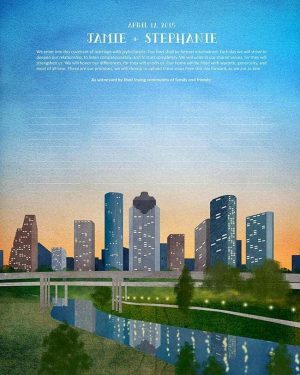 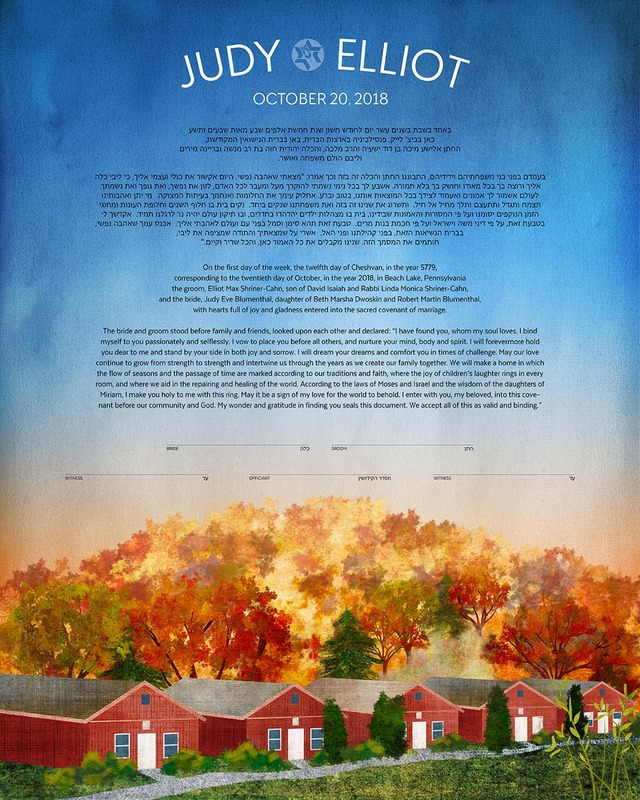 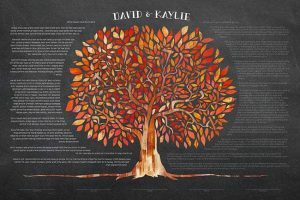 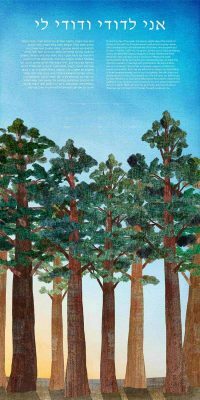 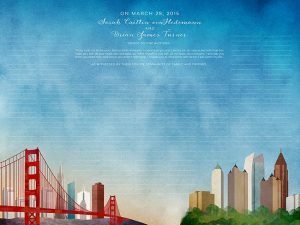 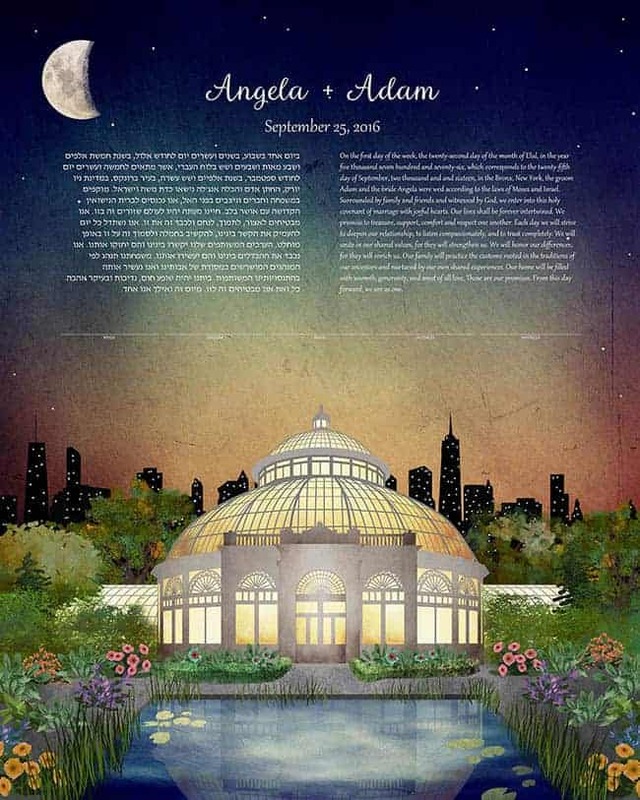 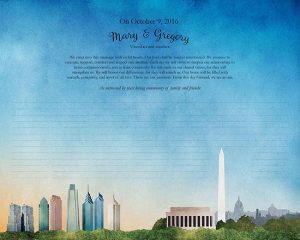 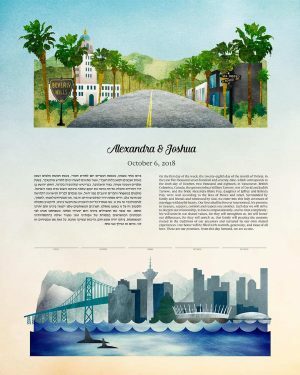 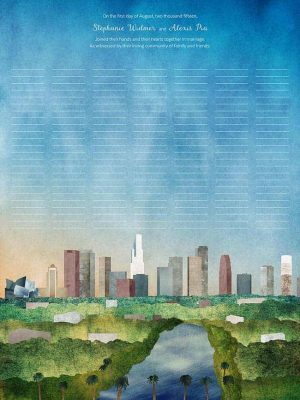 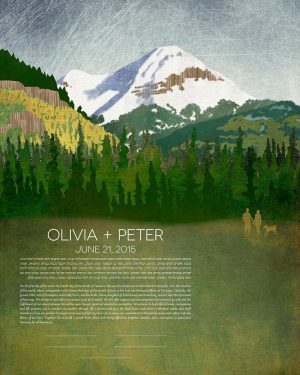 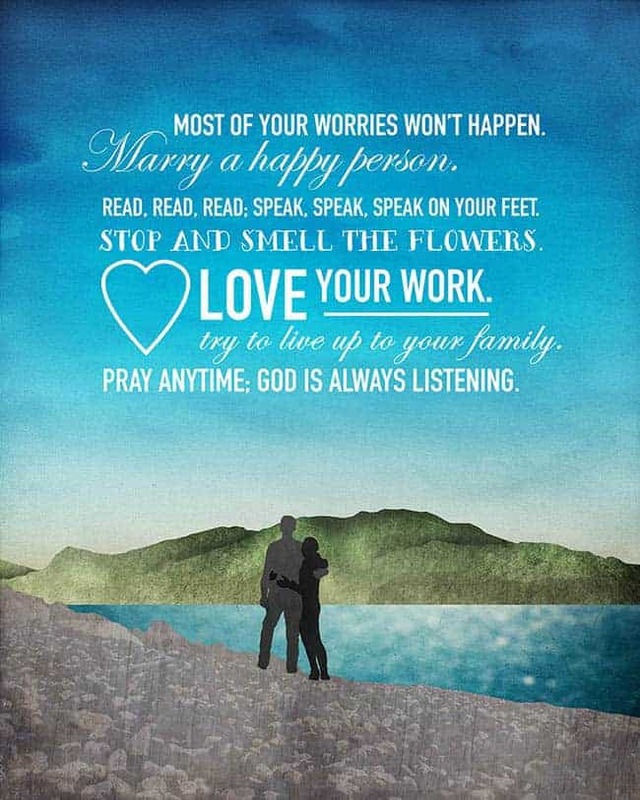 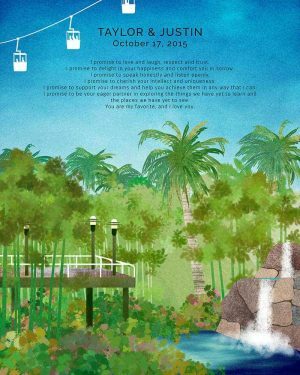 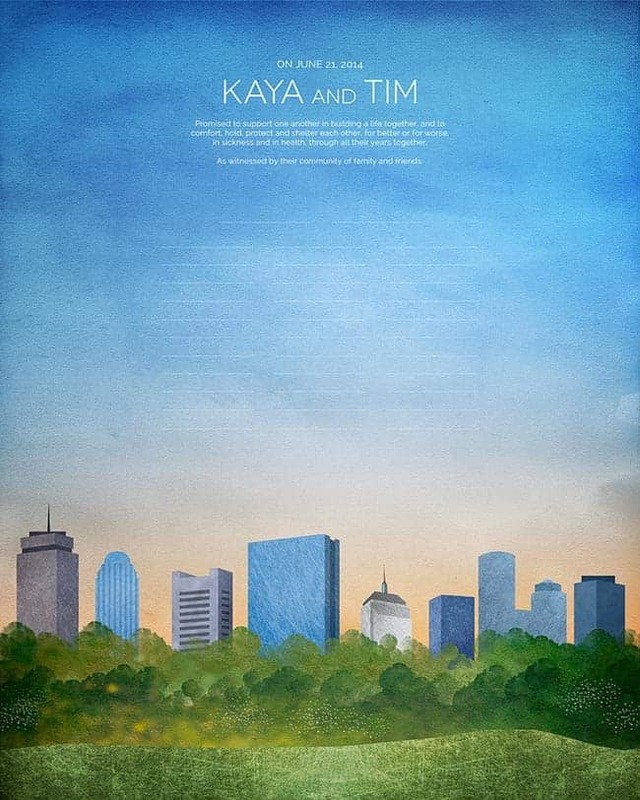 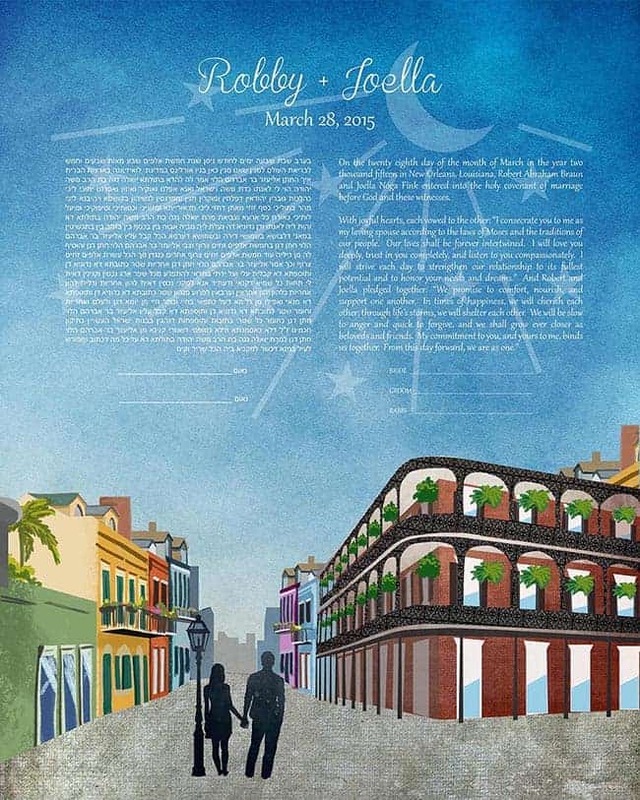 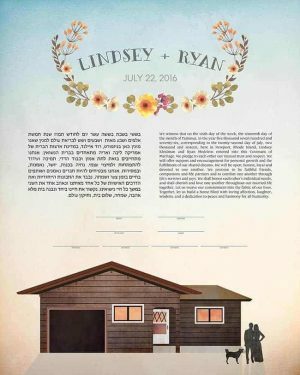 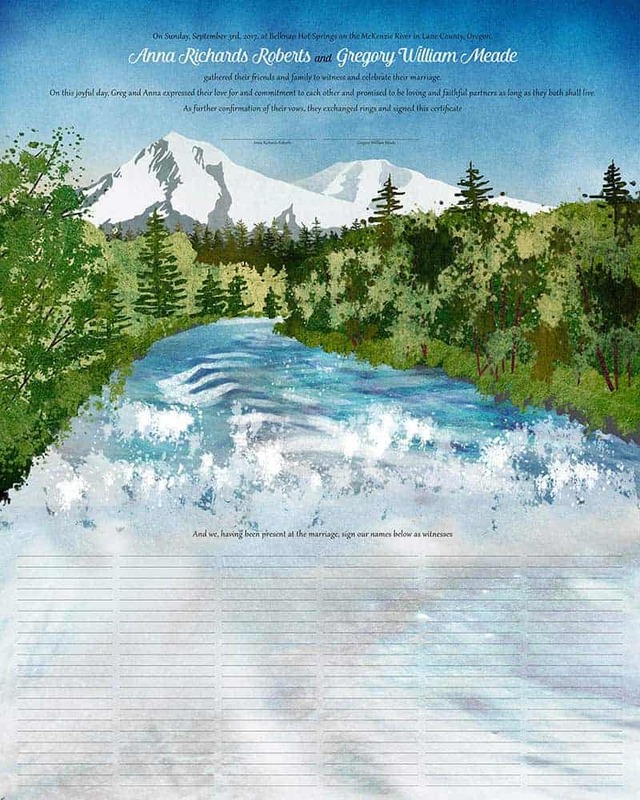 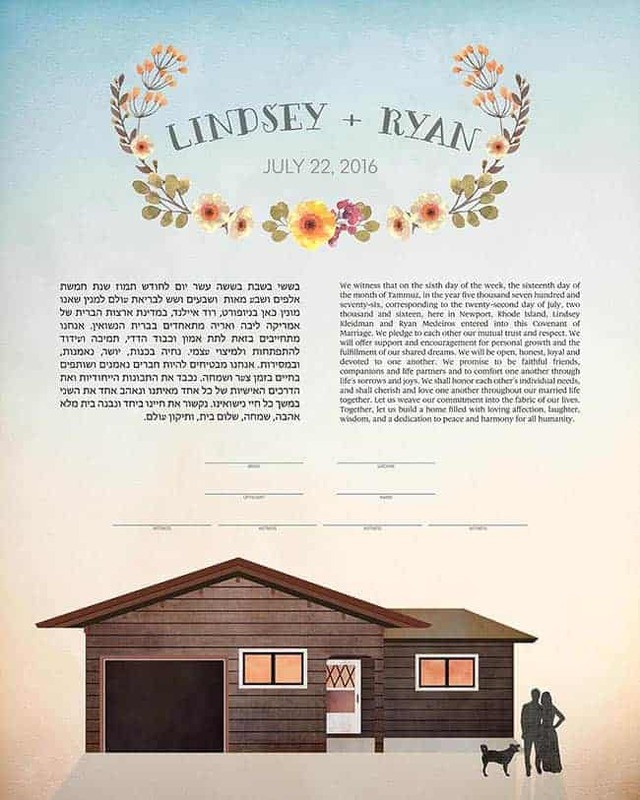 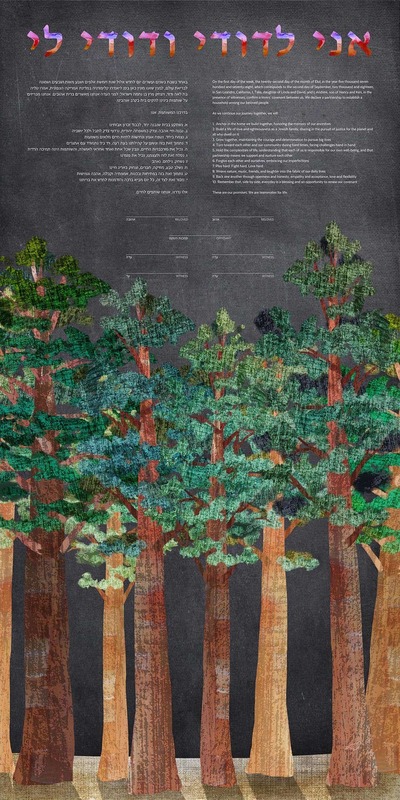 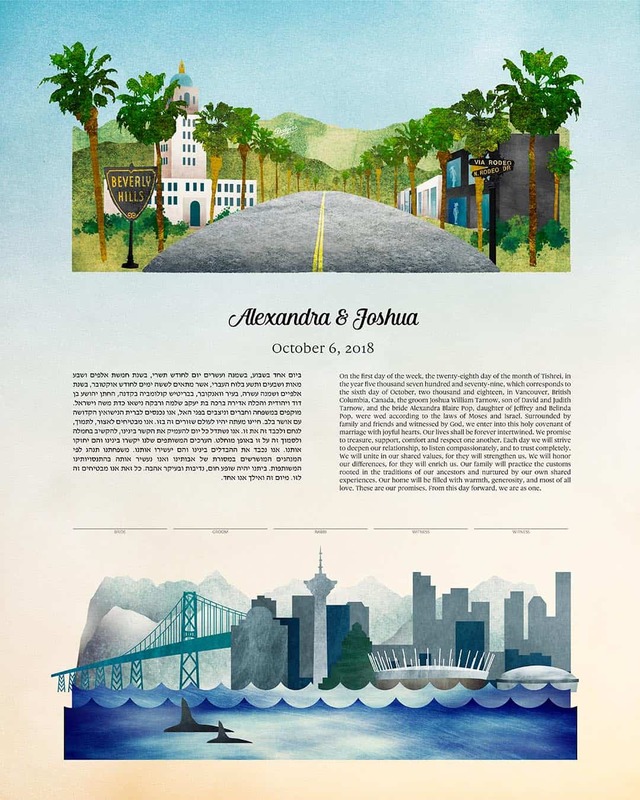 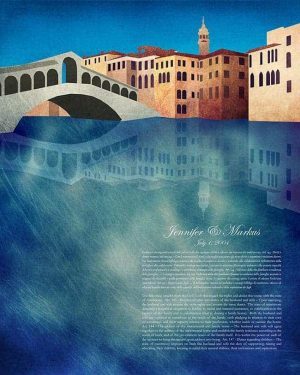 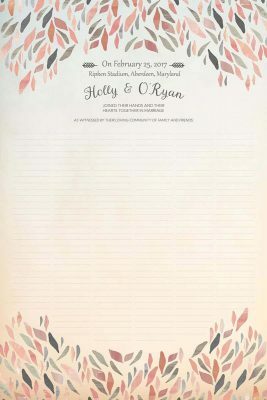 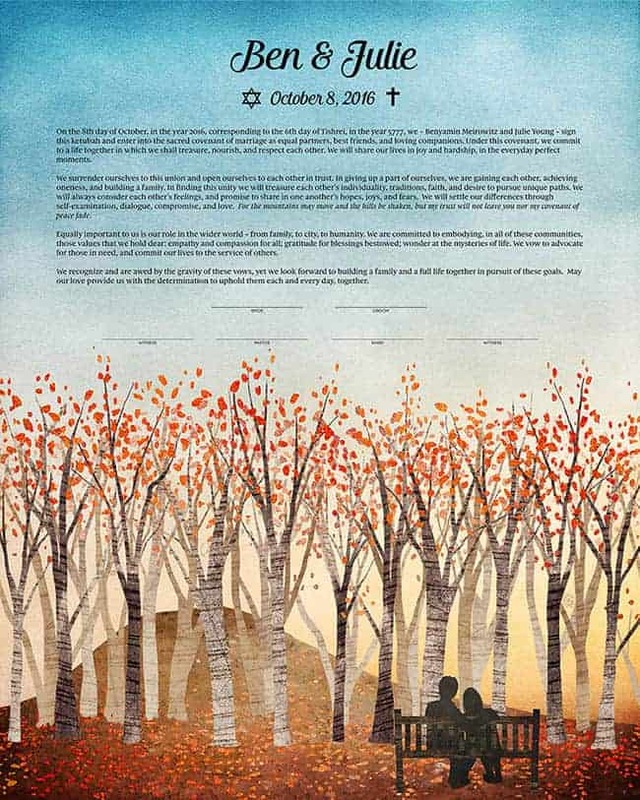 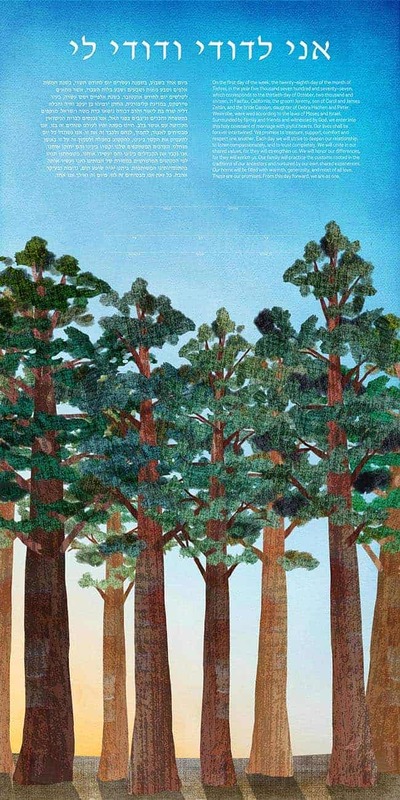 Prices for a custom ketubahs and wedding certificates typically range from $500 - $900, with nature scenes on the lower half and complicated architectural illustrations on the upper half. 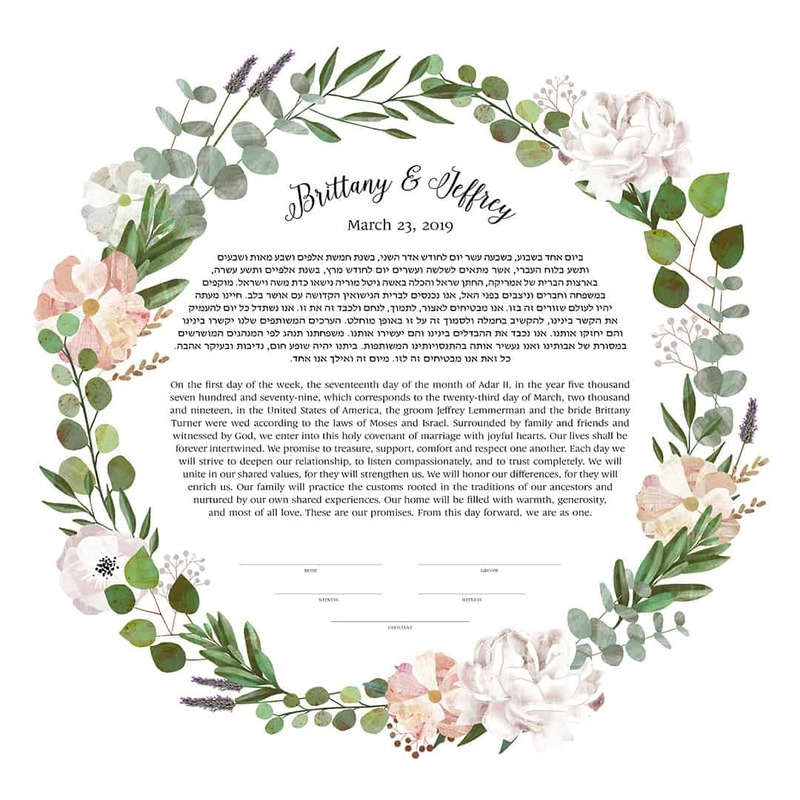  That said, I can often come up with semi-custom options to fit your vision that are a little less expensive, and I do my very best to provide options in everyone's price point. 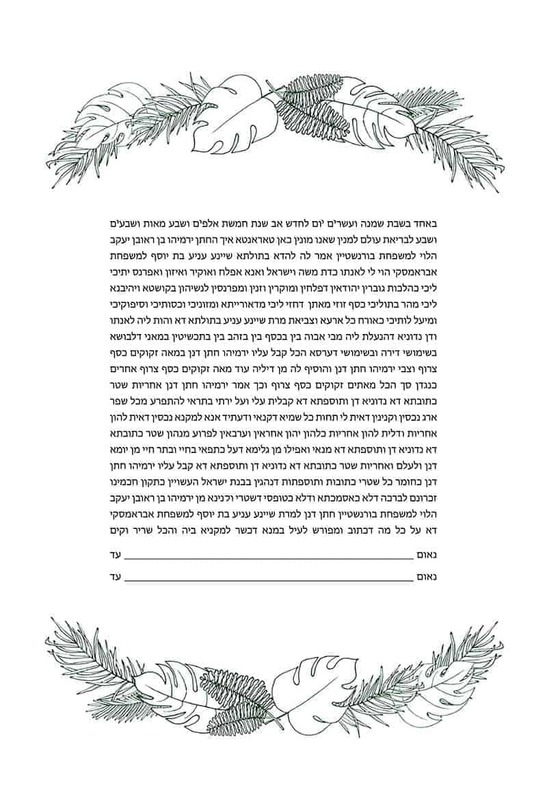 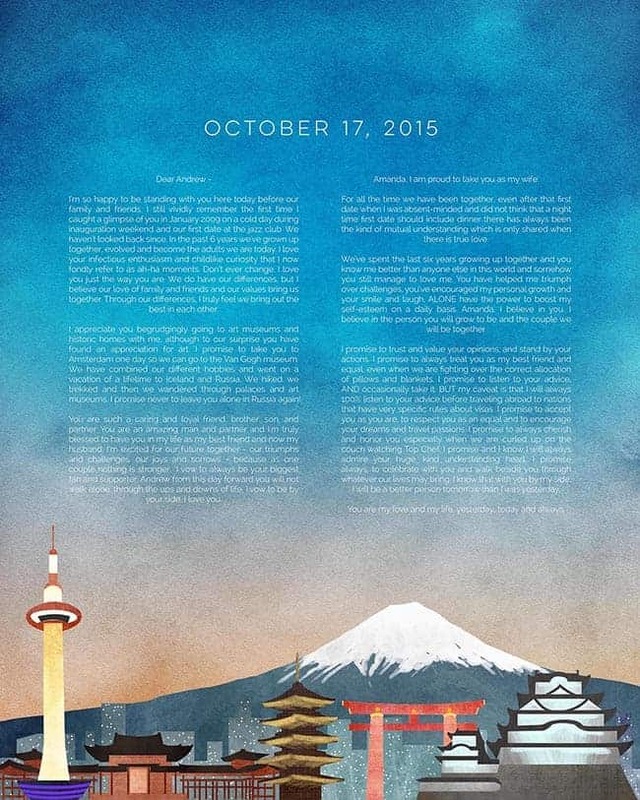 Once you sign off, it's printed and shipped! 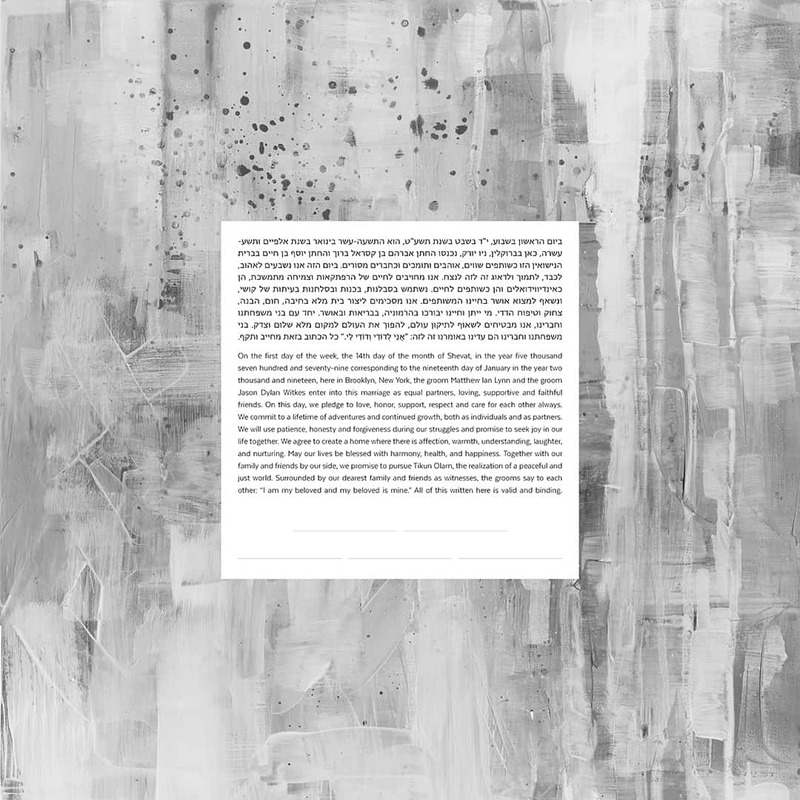 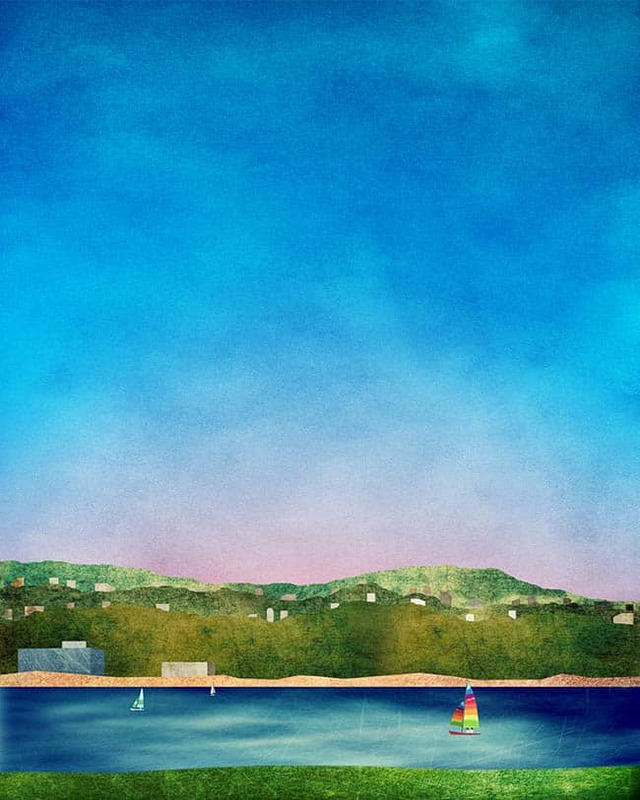 Schedule a complimentary 30 minute consultation with artist and founder Adriana Saipe. 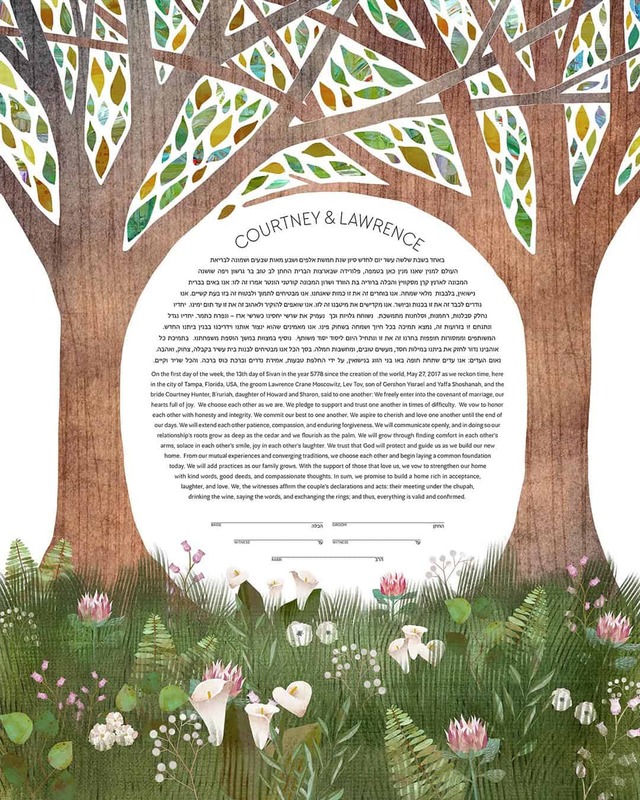 She'll go over your ideas, ask all her design questions, and then send you an illustrated quote for the project.